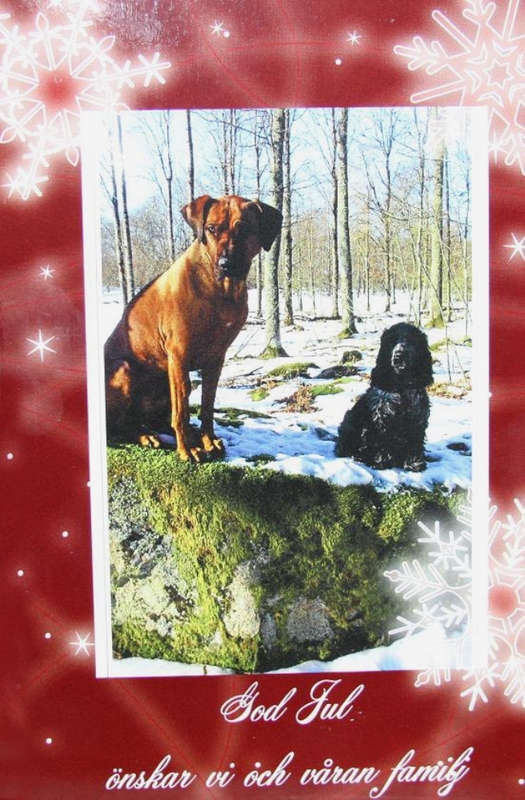 Thank you to all who has send me/us Christmascards and textmessages,very appreciated! 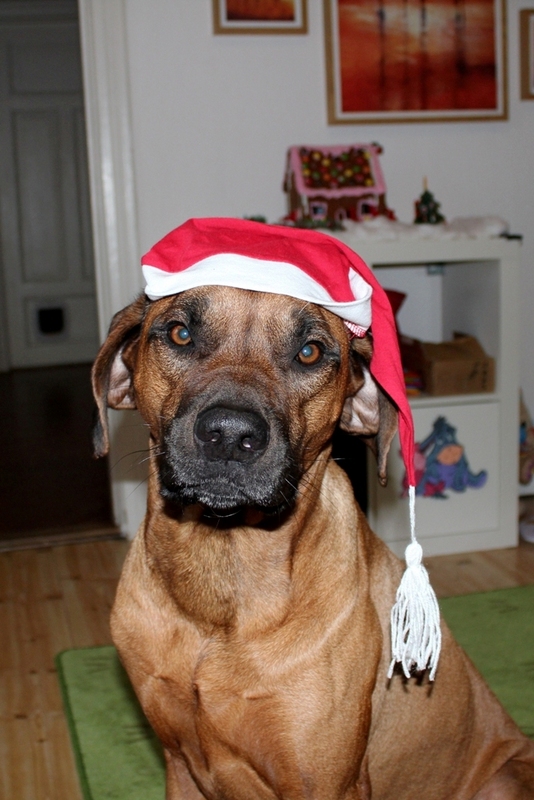 I hope you all have had a wonderful christmas:) and spoiled your fourlegged a little bit extra! 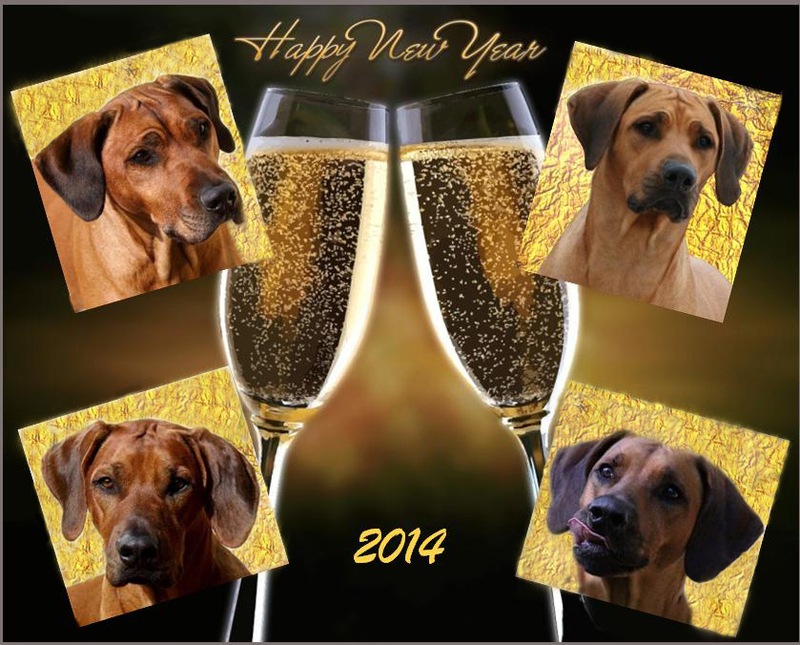 I wish you all a wonderful New Year and all the best for 2014! 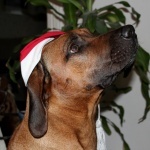 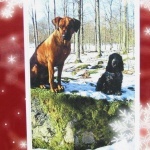 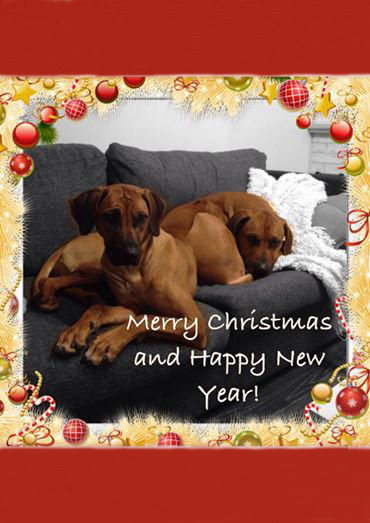 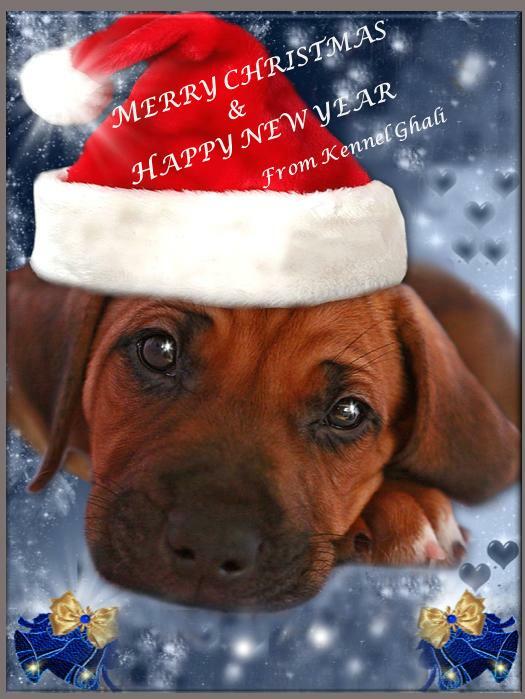 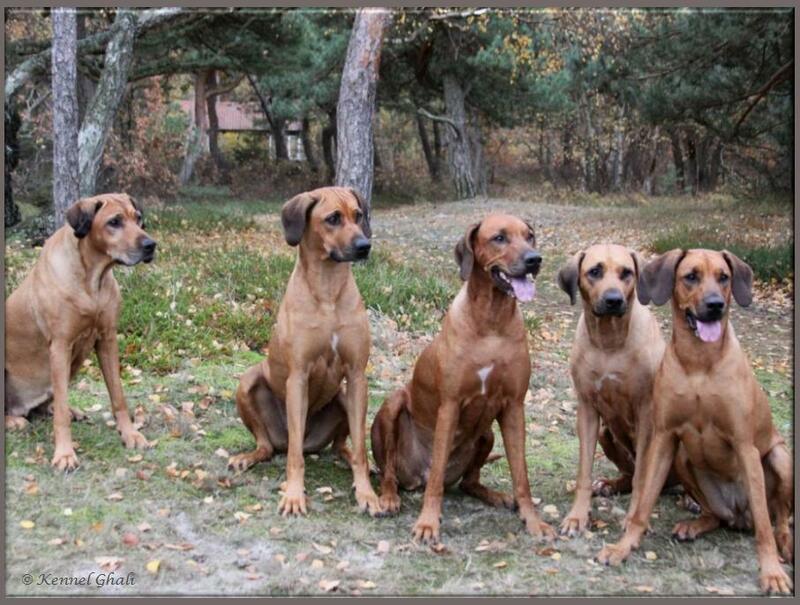 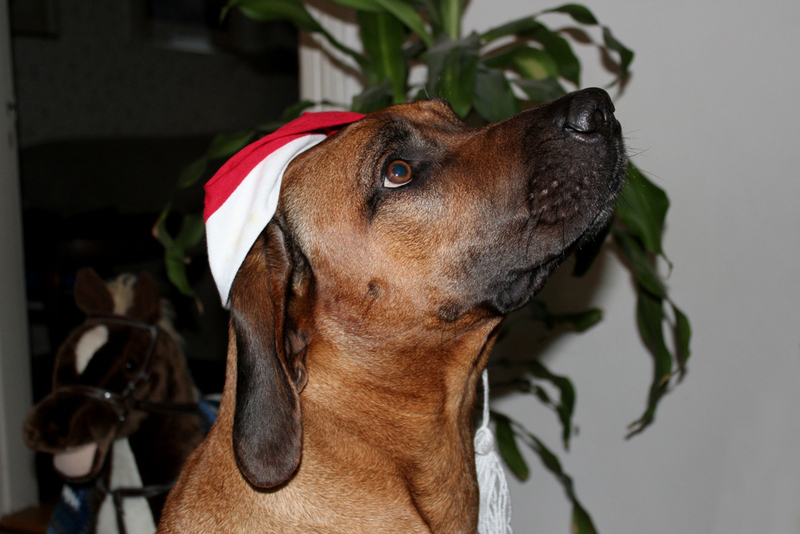 Below you can enjoy some wonderful Christmas greetings from some of our lovely Ghalidogs:)! 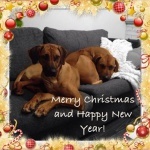 Greetings from Safir & Primus son! 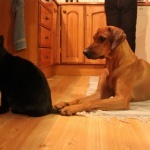 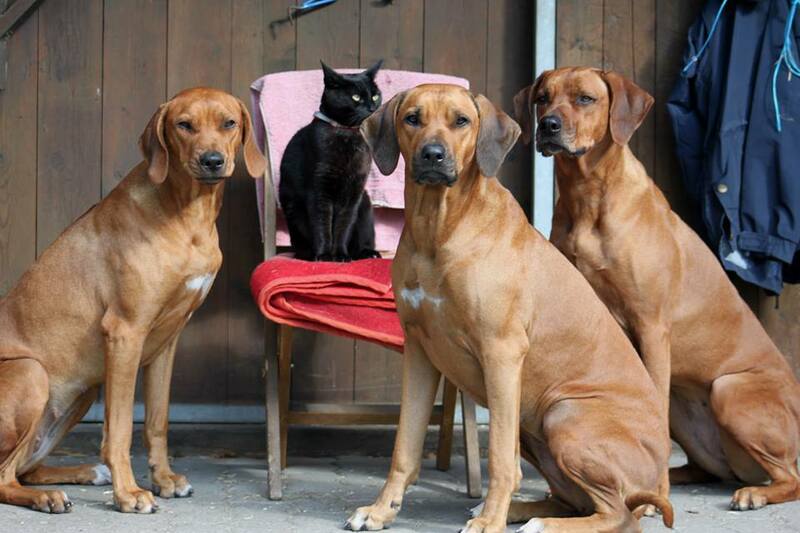 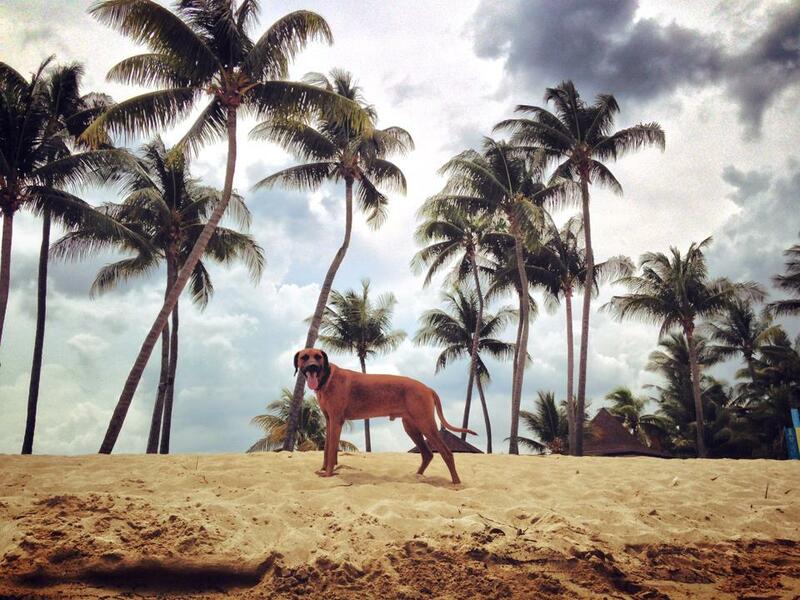 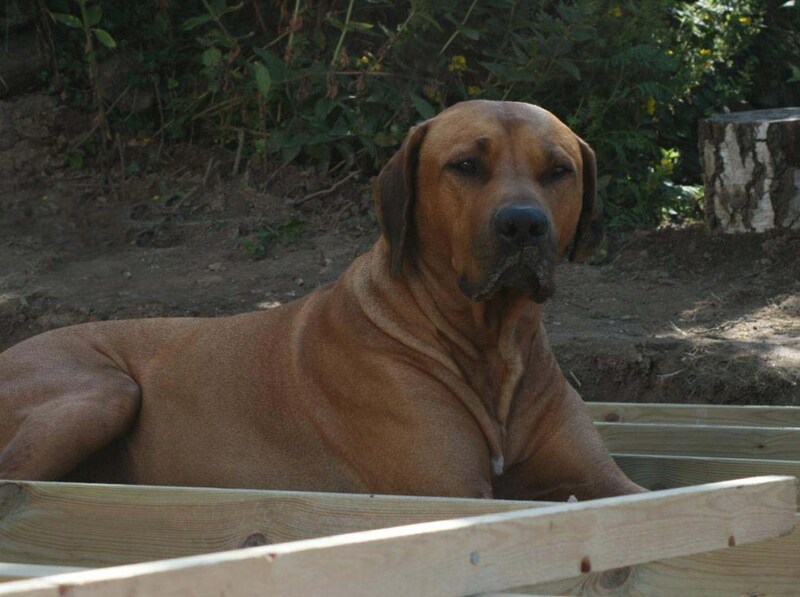 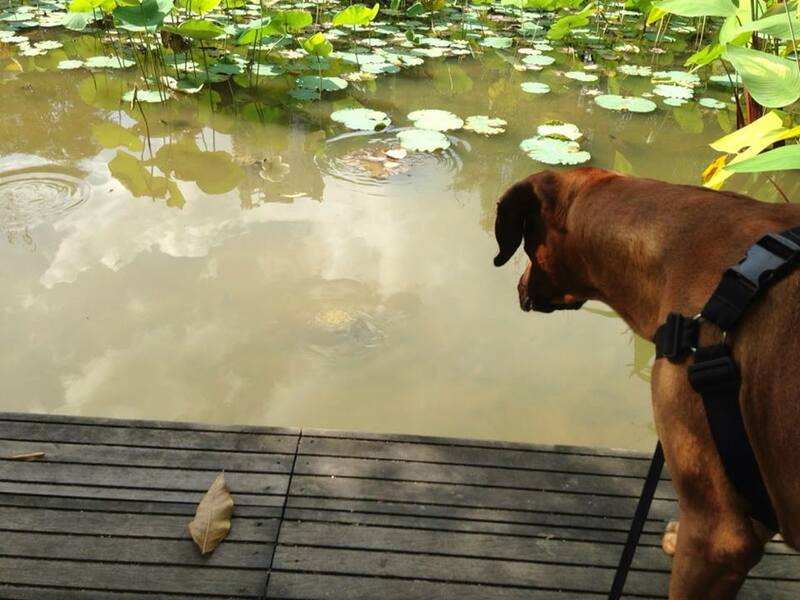 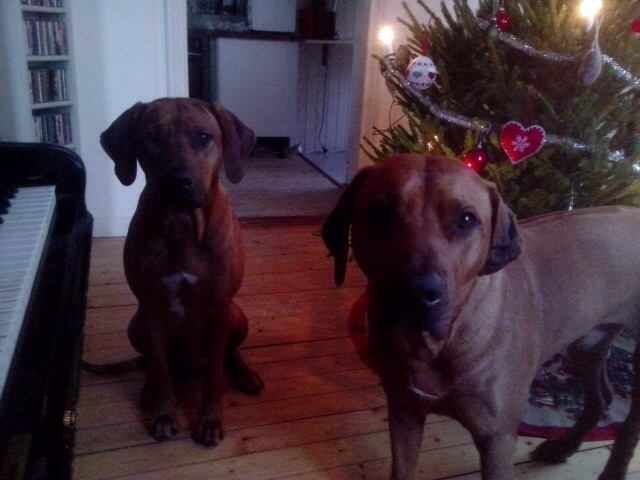 Some weeks ago I received a few pictures in my email from Zimba and Zorro´s owner:)! 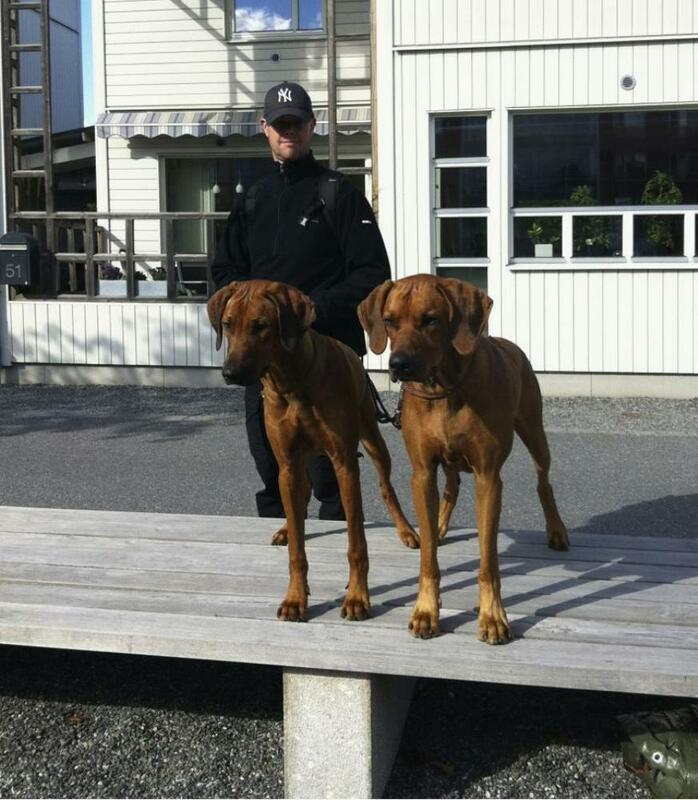 To the left on the picture is sweet Zimba, he is a son of our lovely Primus. 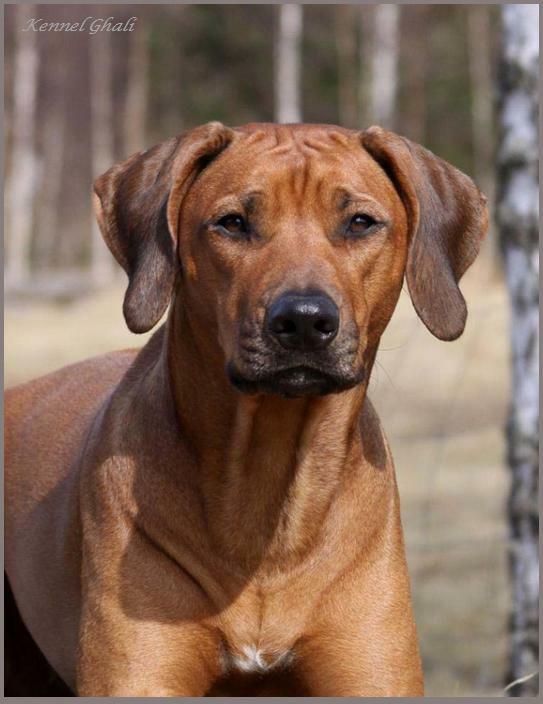 Seuch Dkuch Sevch Ghali Akili af Argos"Primus" to the right on the picture below is Safir´s lovely son Zorro, from our F-litter! 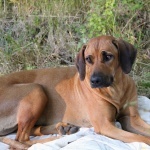 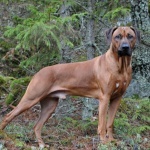 Ghali For I`M Fire N`ice"Zorro"
They are often out in the woods and fields, for long walks or tracking. When the weather permits, they're also out on the sea fishing with the family boat. 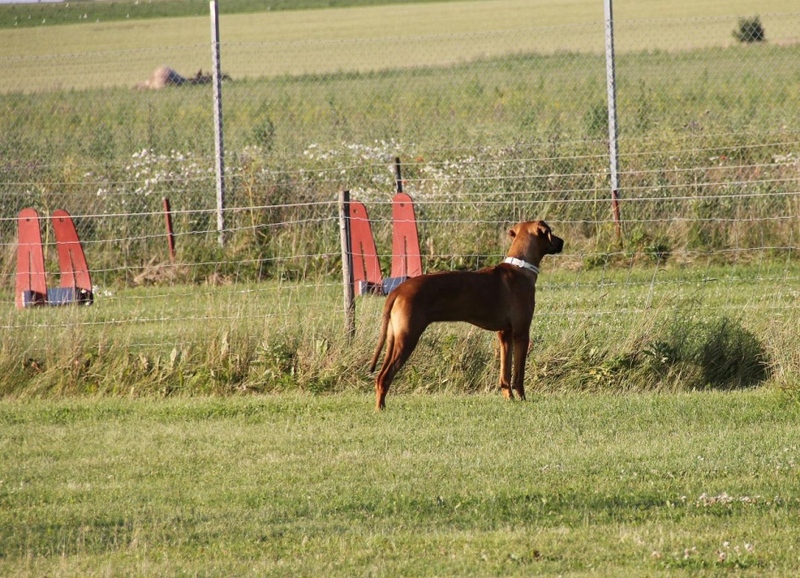 Safir´s son Zorro has proved to be really great at tracking:) he only needs one more first prize to call him self Champion:)! 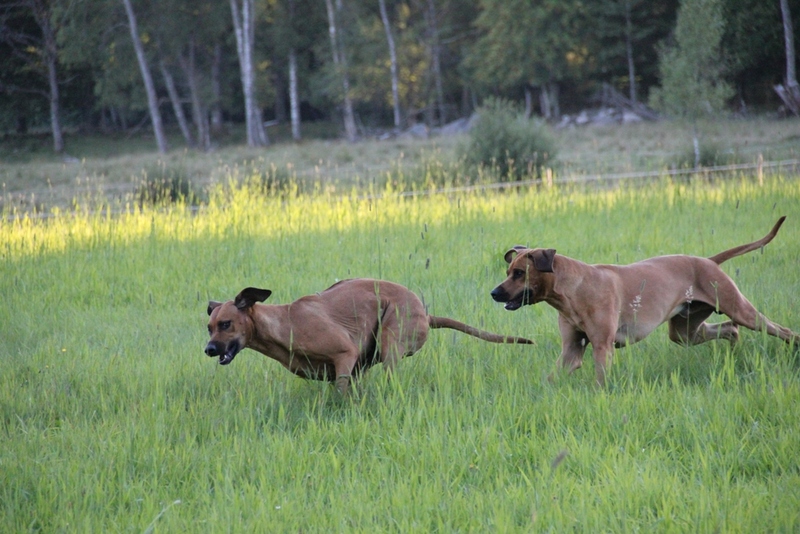 But I'm not surprised that it works so well between these two guys, their two-legged dad has a strong and clear leadership role. 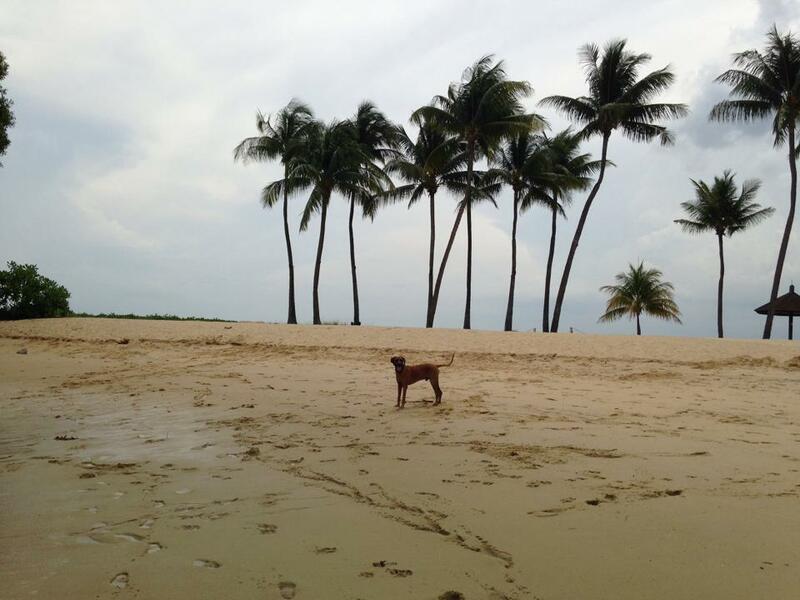 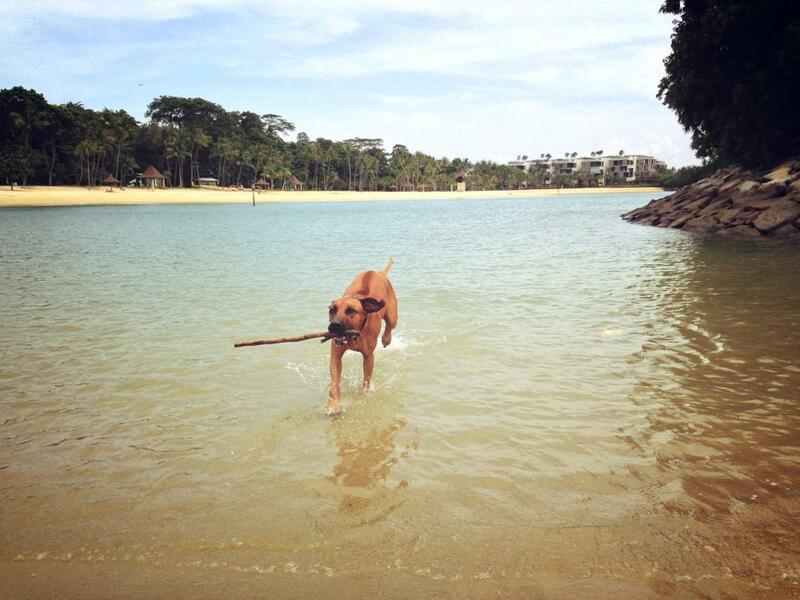 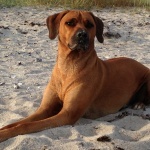 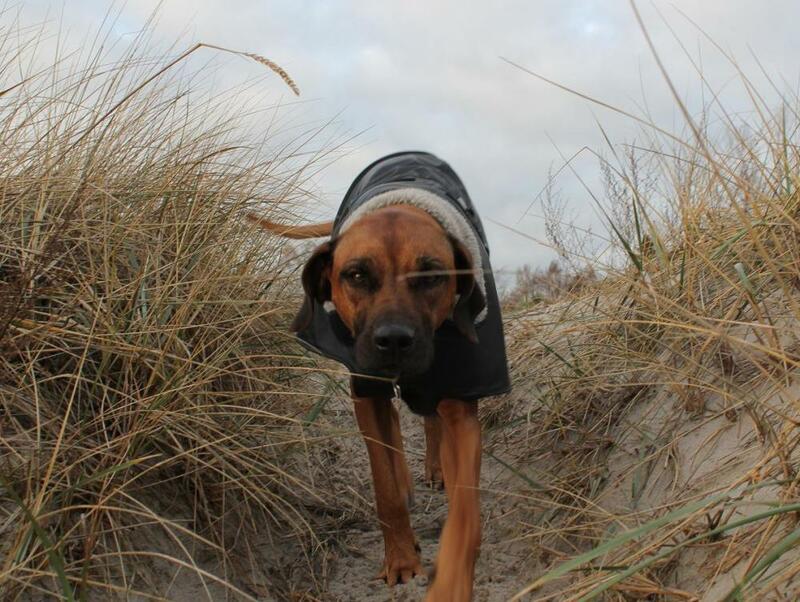 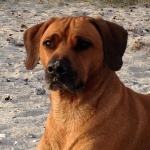 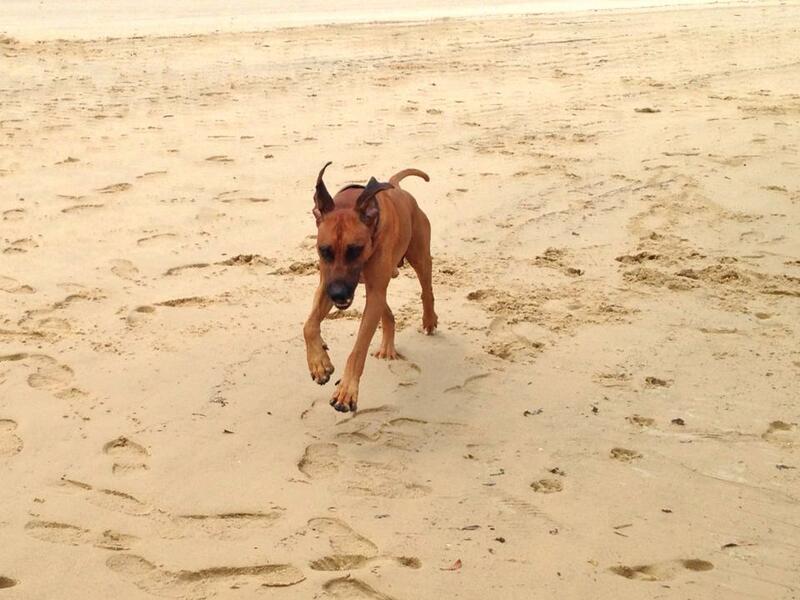 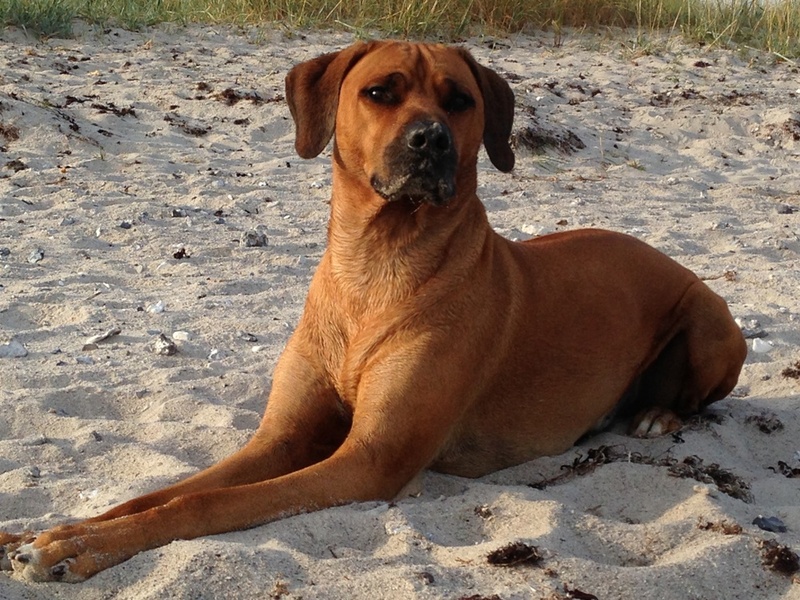 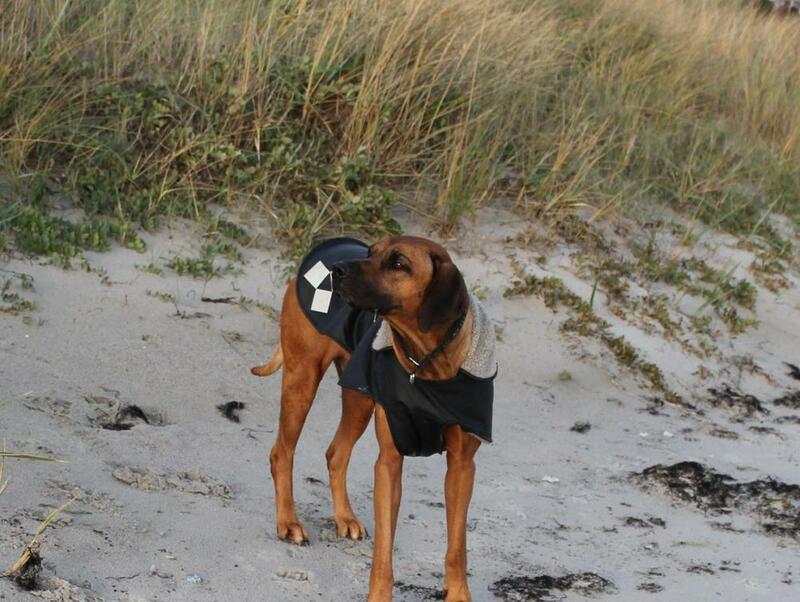 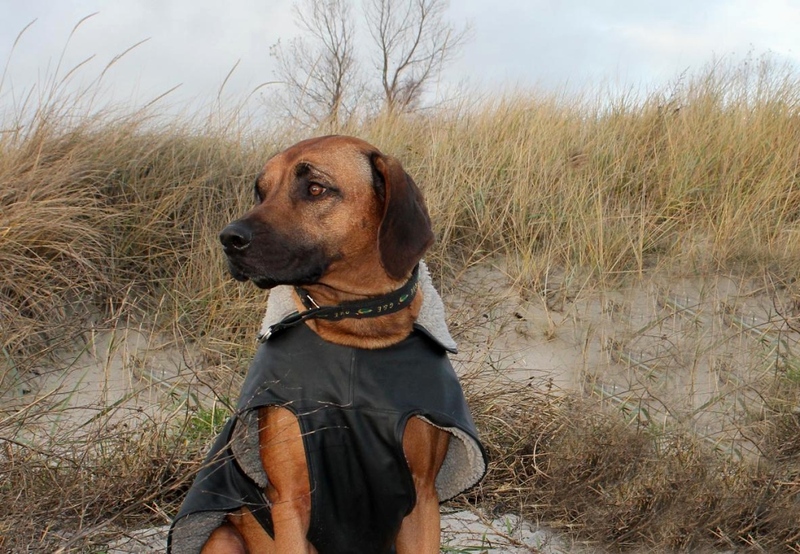 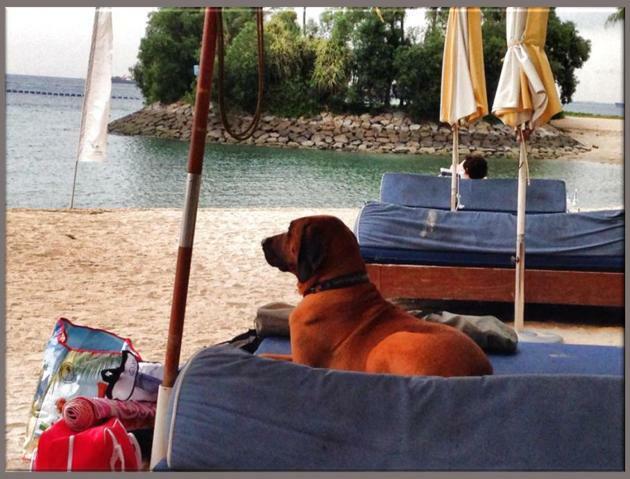 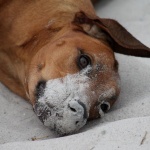 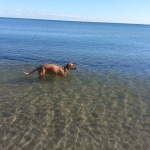 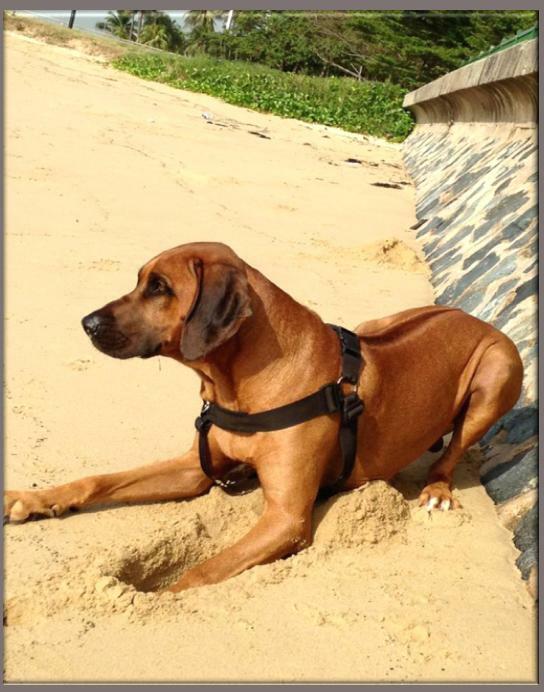 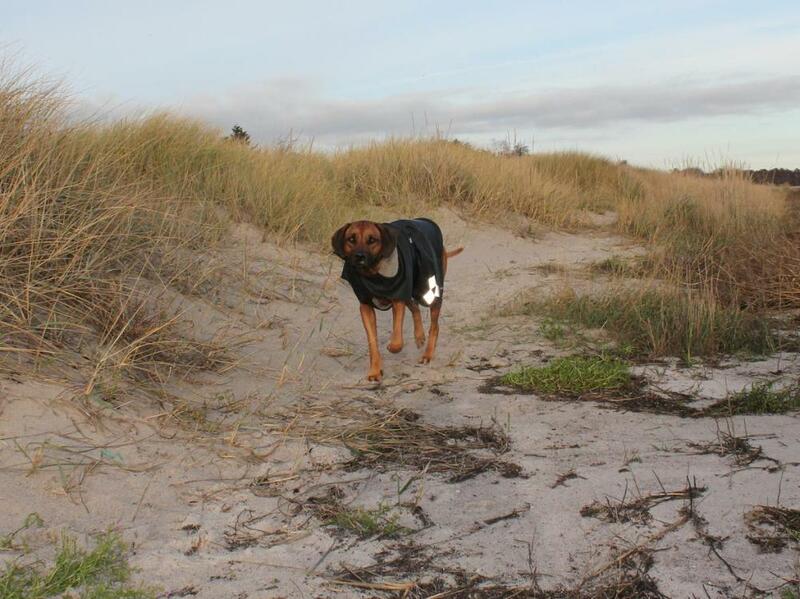 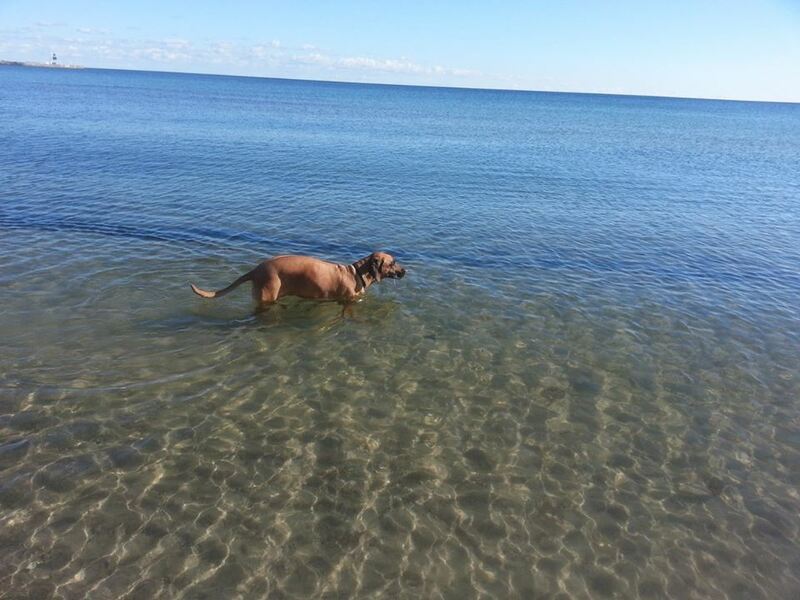 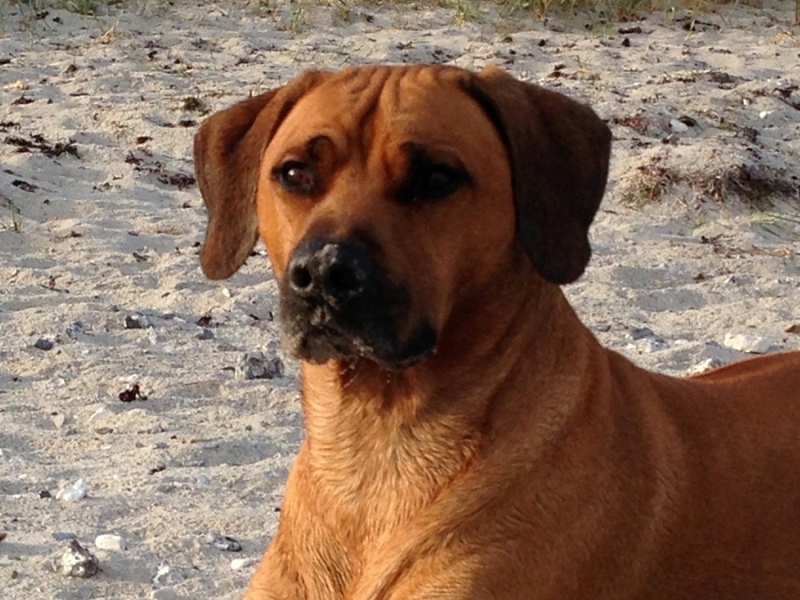 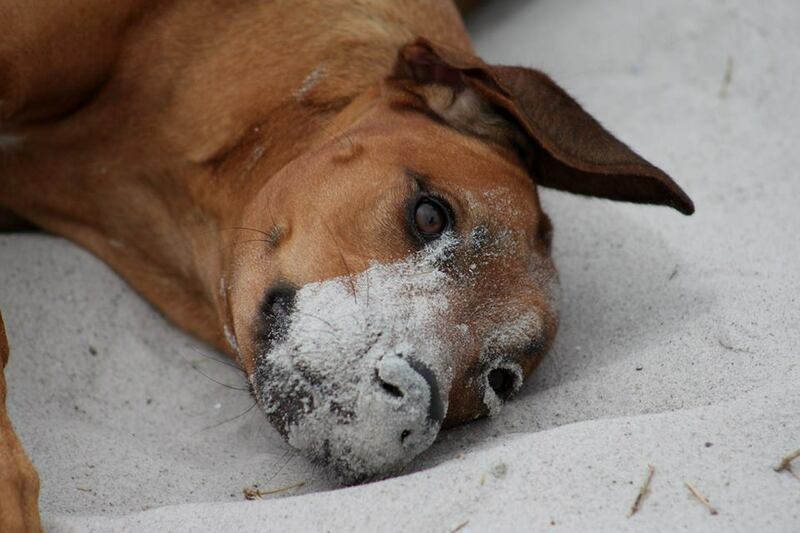 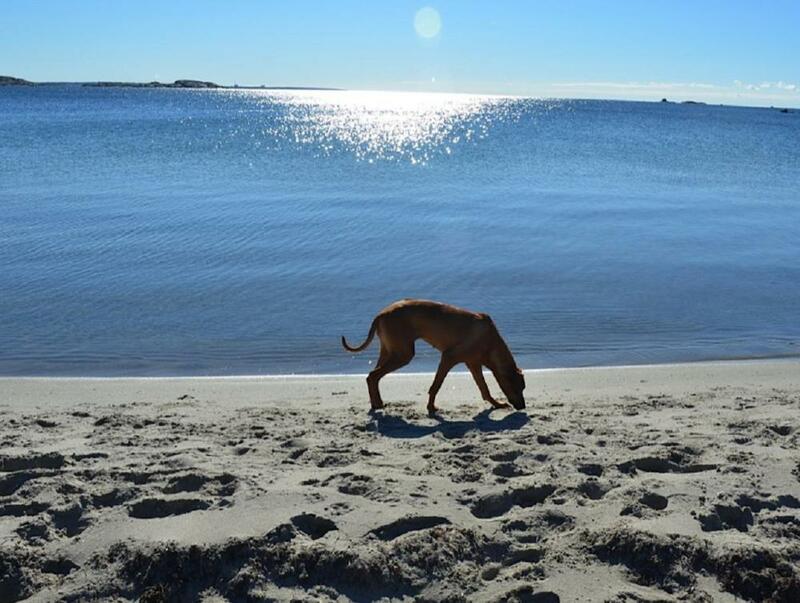 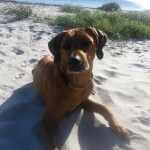 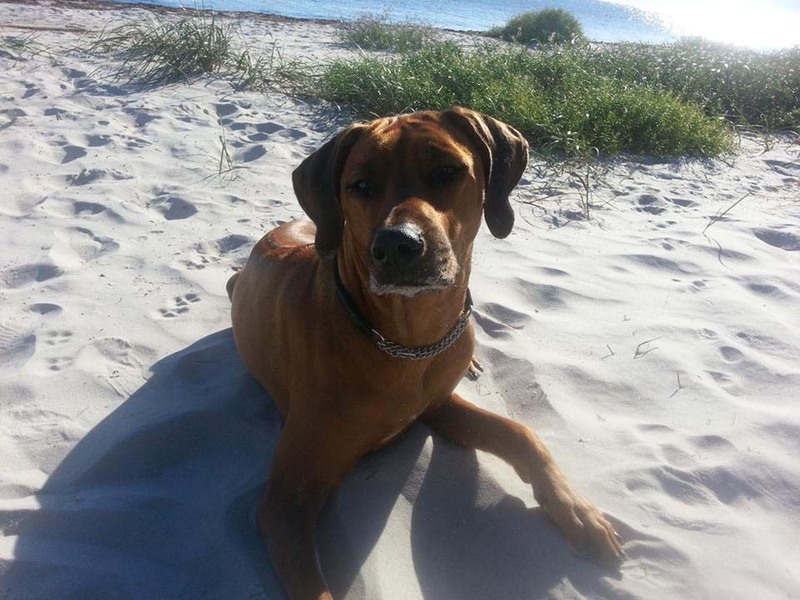 Dex new owners sent me an email with some pictures from their walk at the beach:) Thanks! 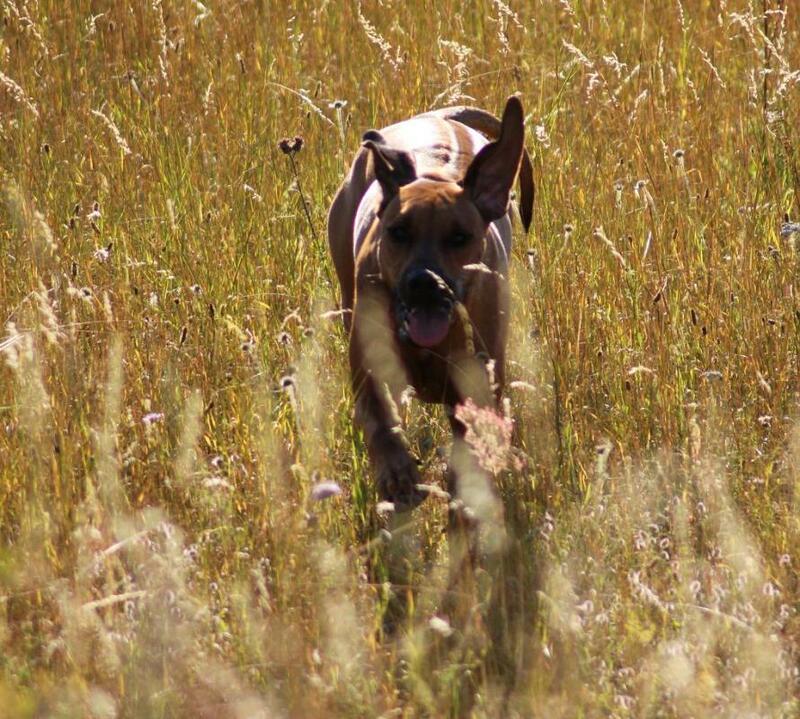 Dex has settled in great at his new home on the country side:) and everything works great with the other four-legged animals:)! 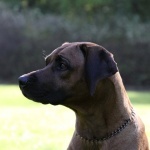 Come back for more updates soon! 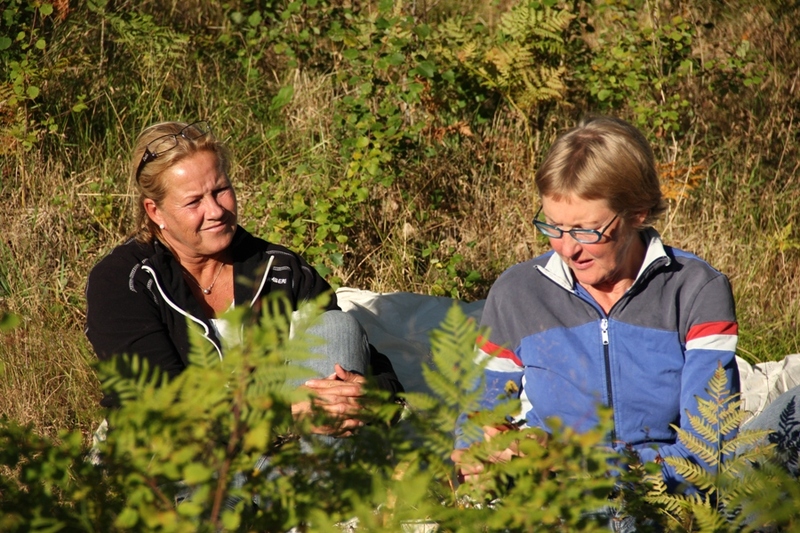 I have updated the photogallery 2013 with some of them. 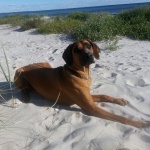 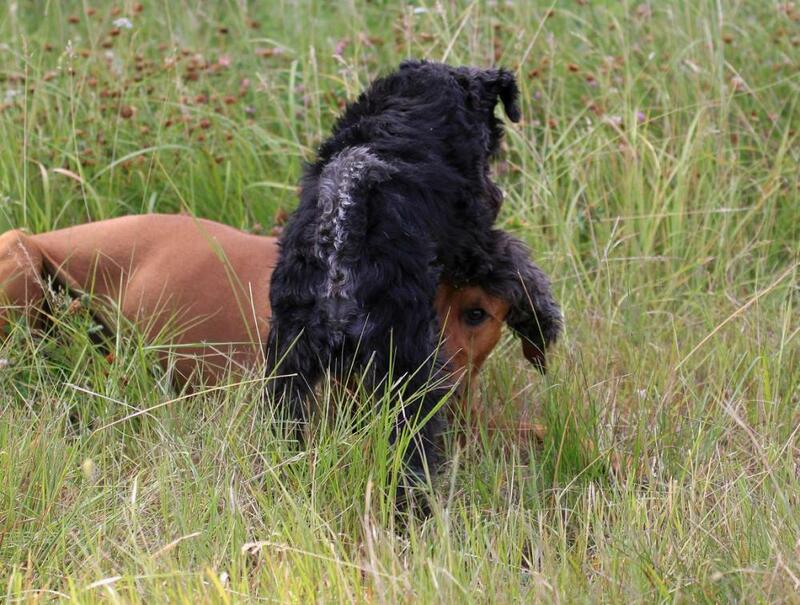 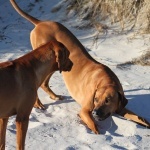 It´s from one of the siblings playdates in Skanör/Falsterbo. 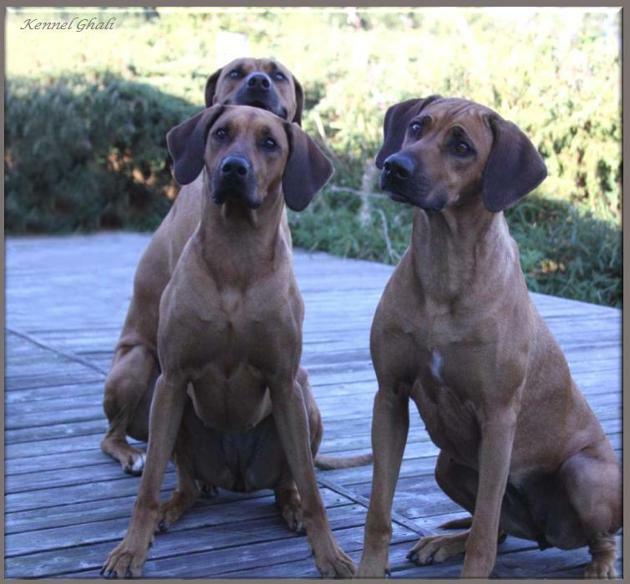 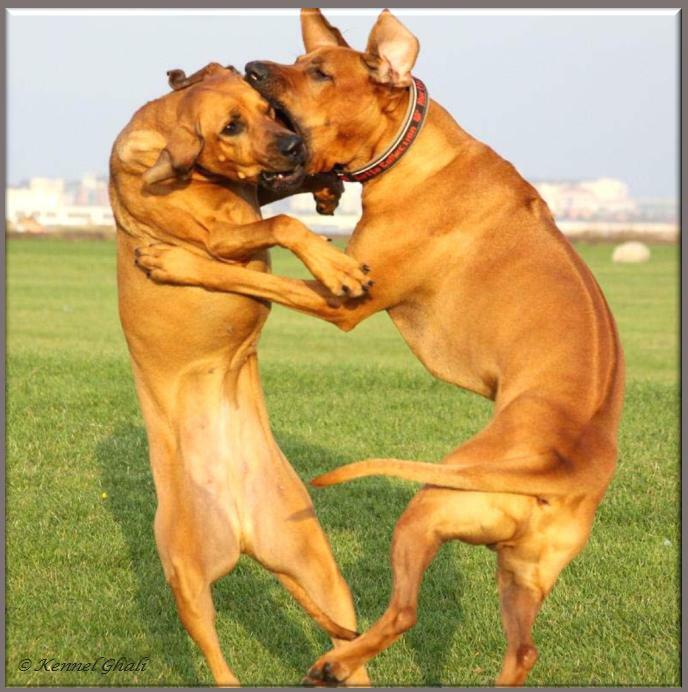 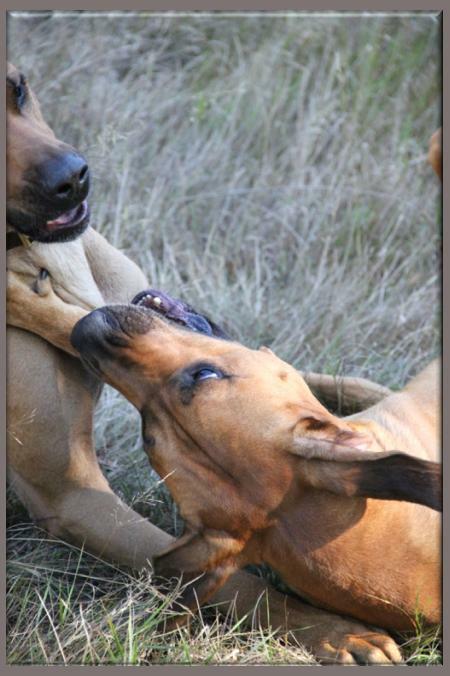 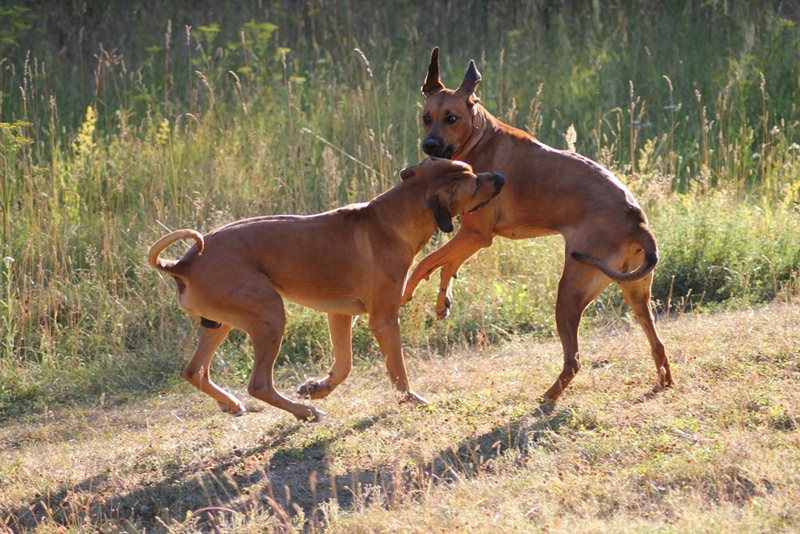 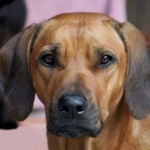 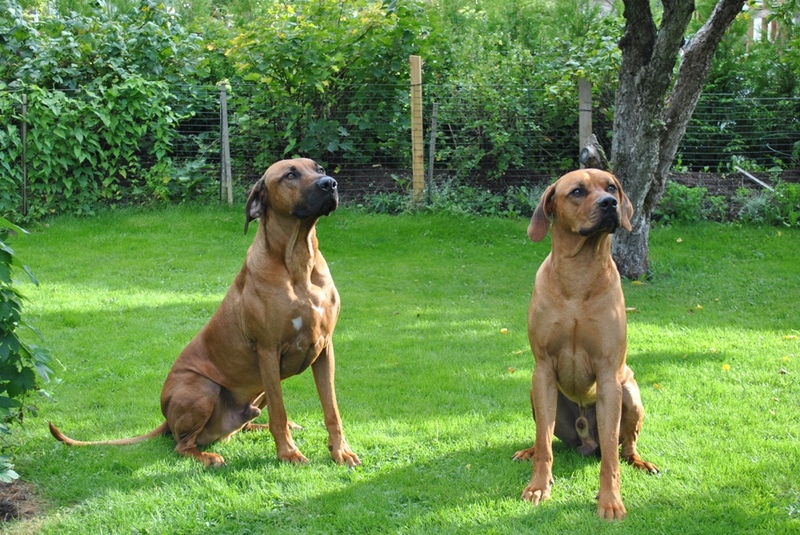 Chimme & Salma are from our D-litter, Asla x Minos. 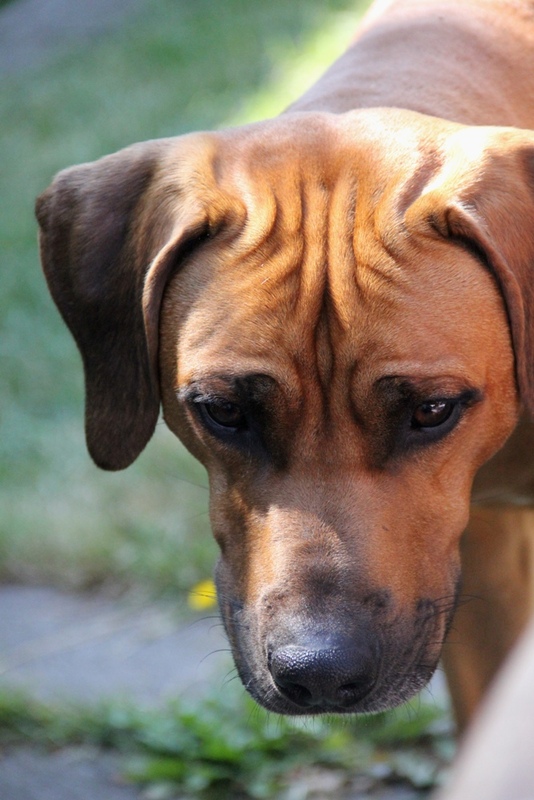 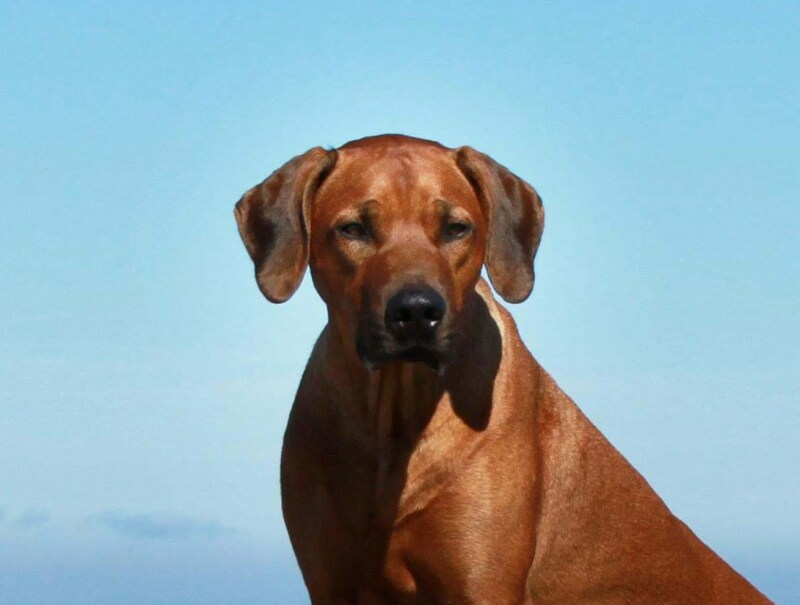 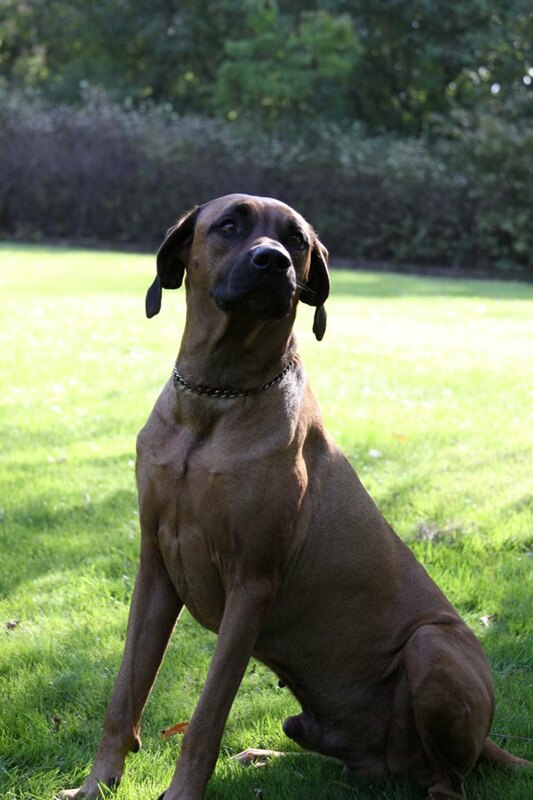 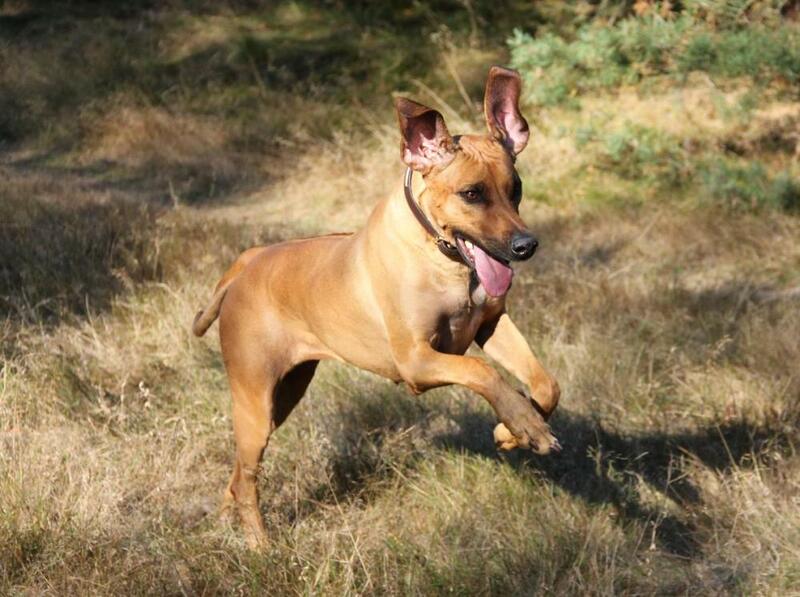 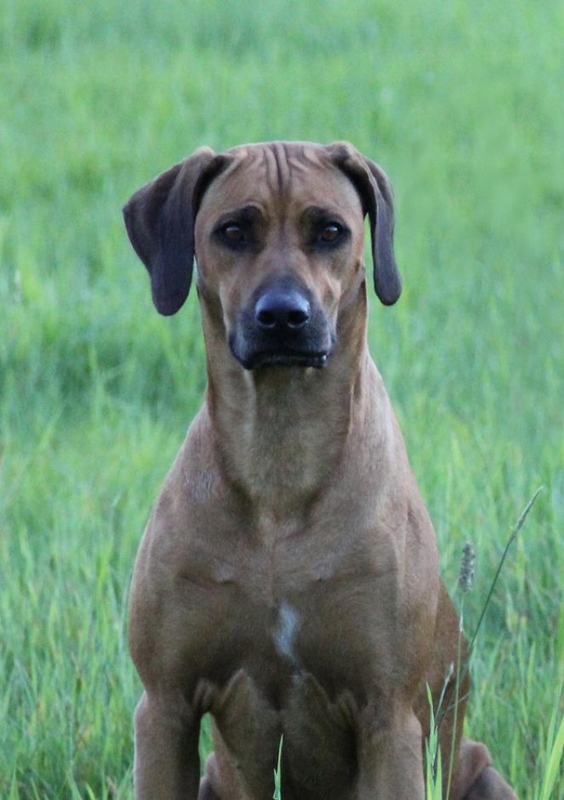 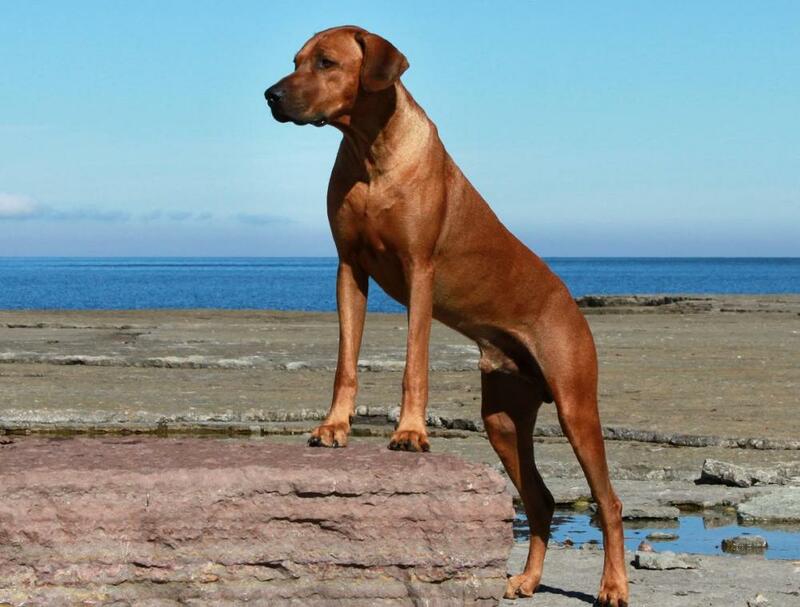 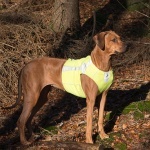 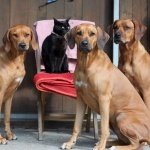 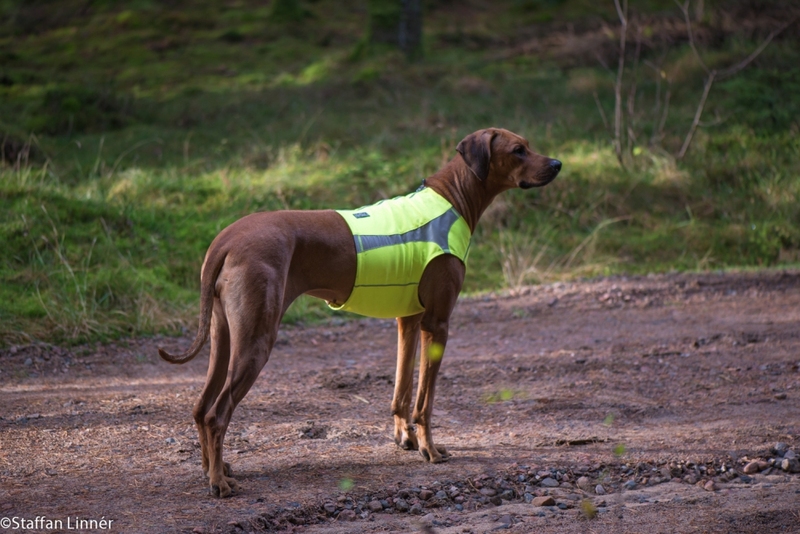 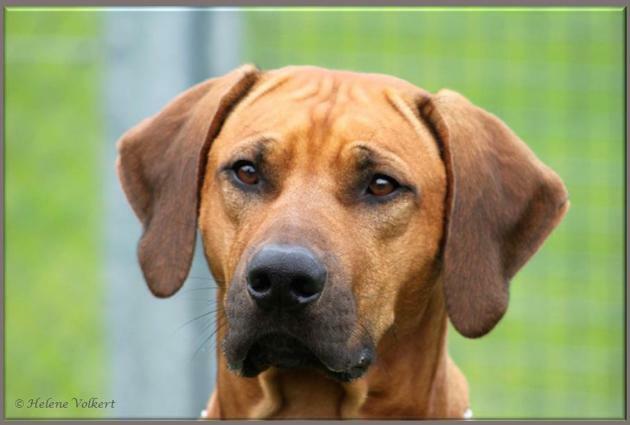 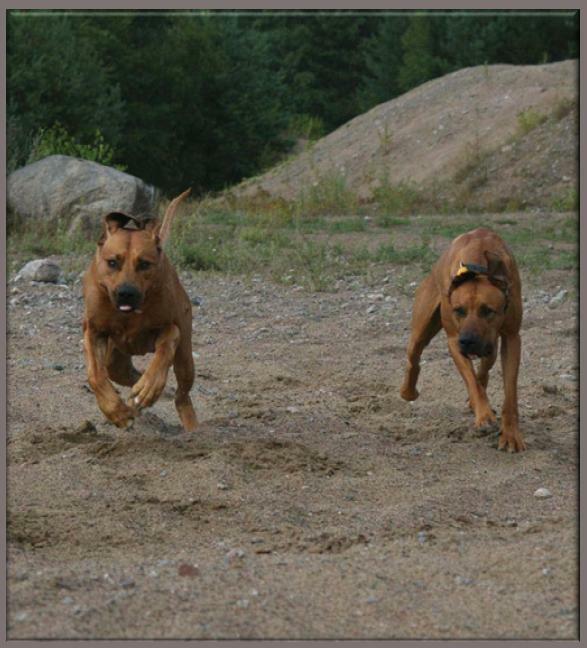 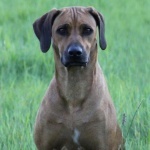 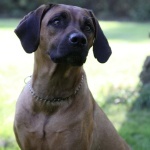 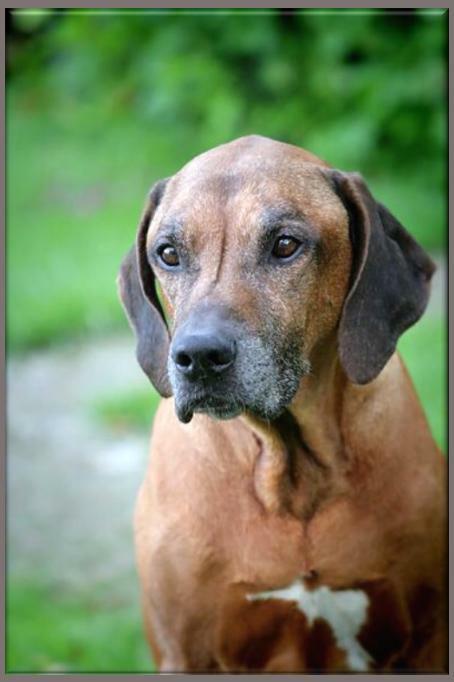 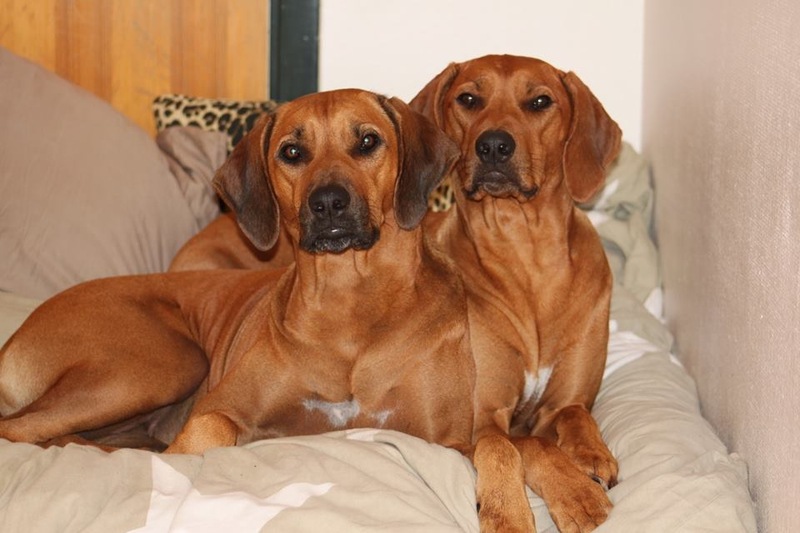 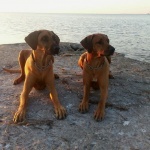 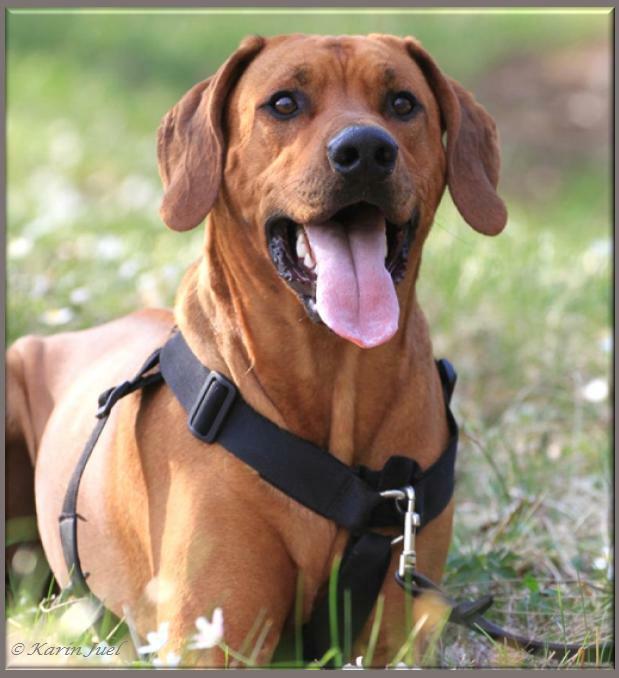 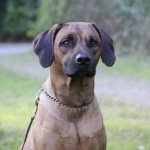 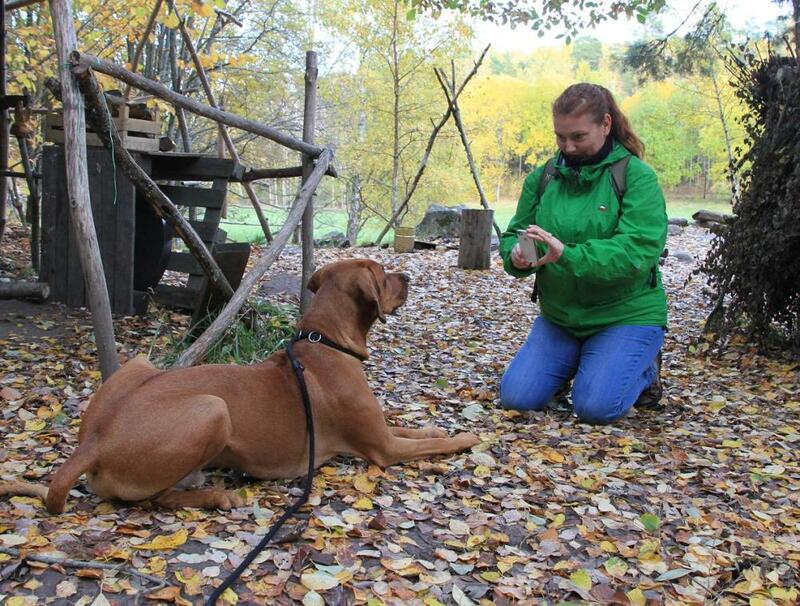 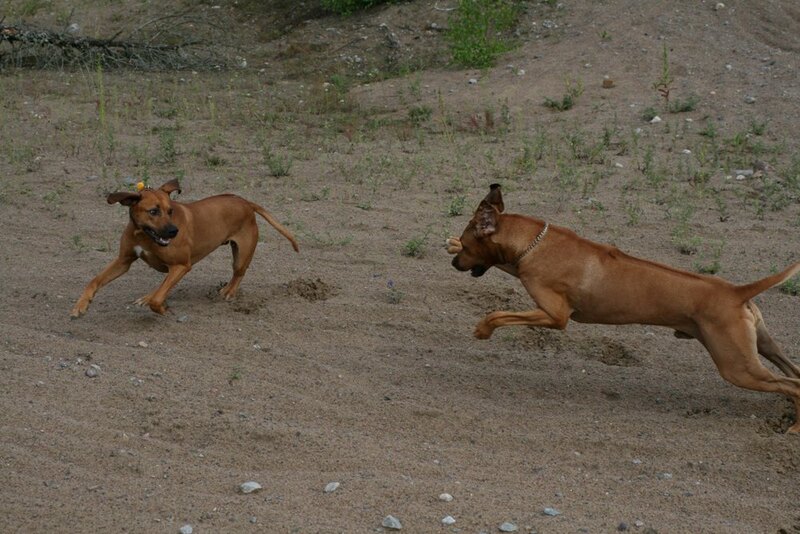 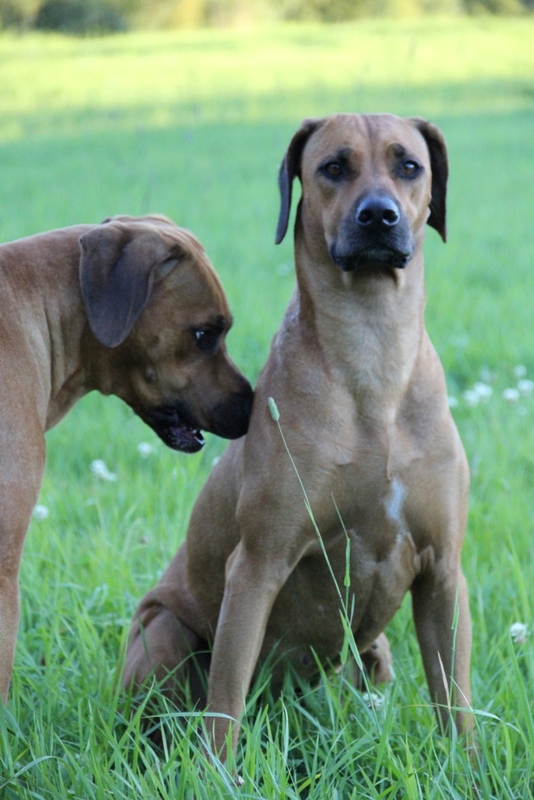 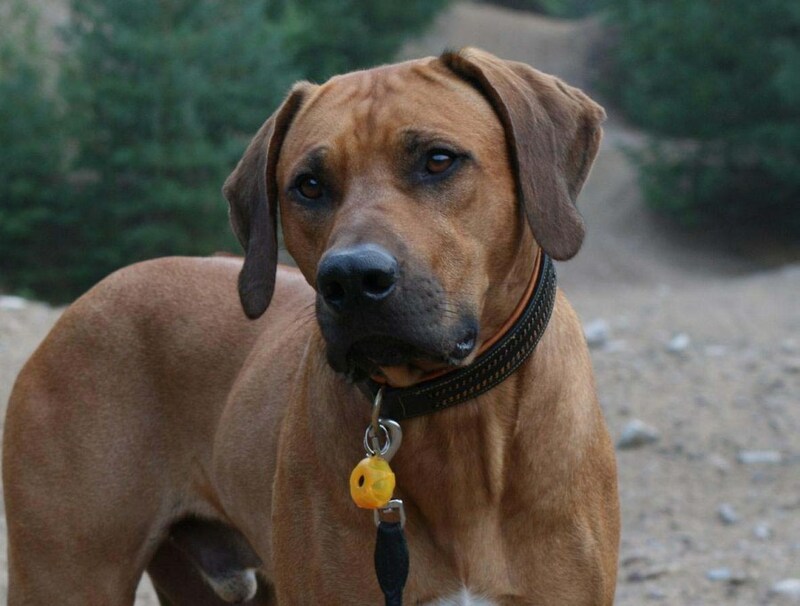 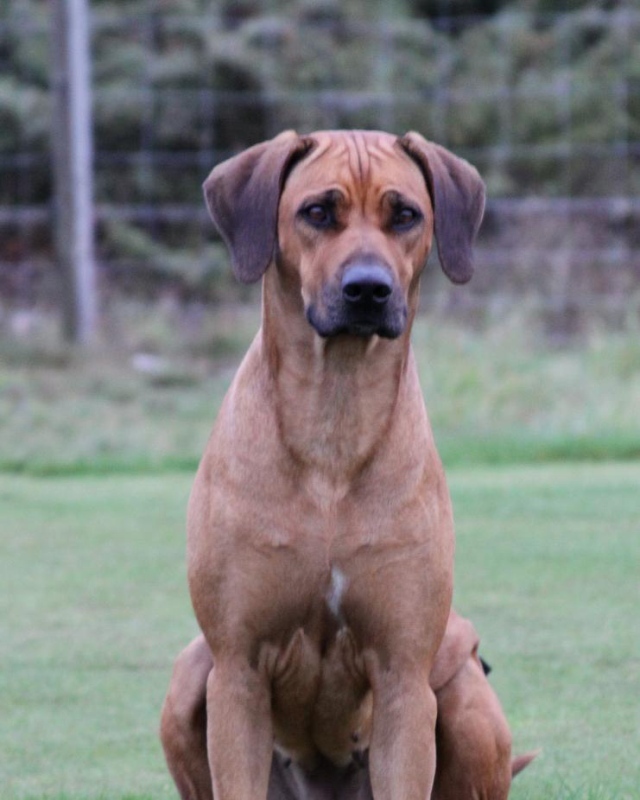 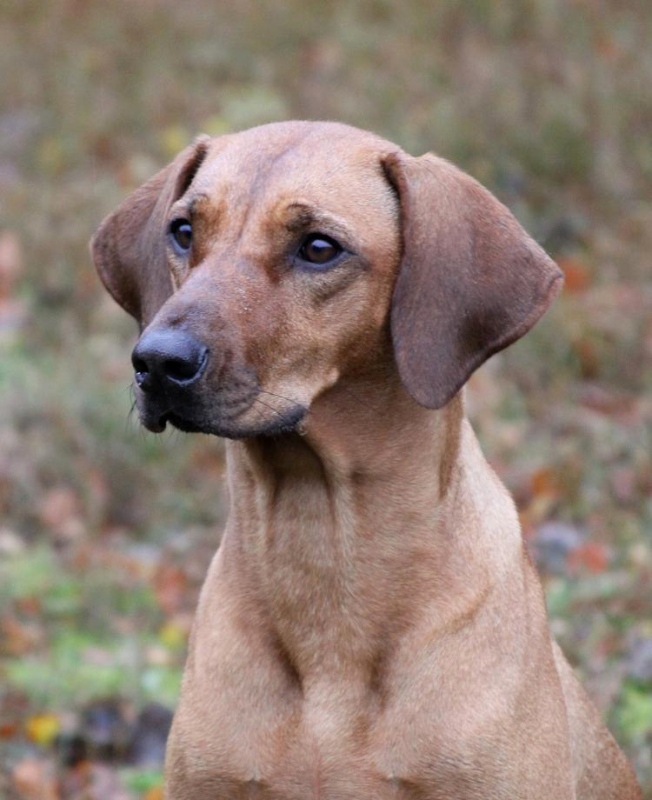 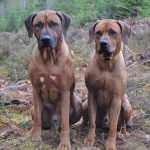 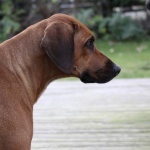 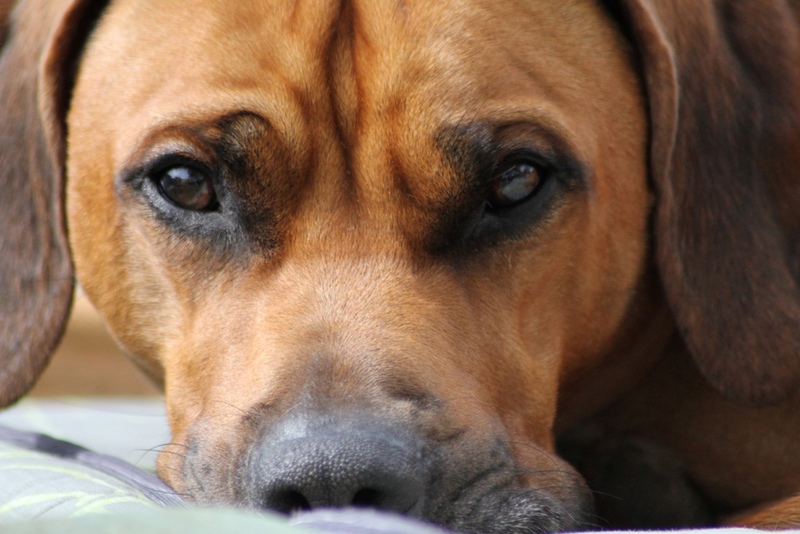 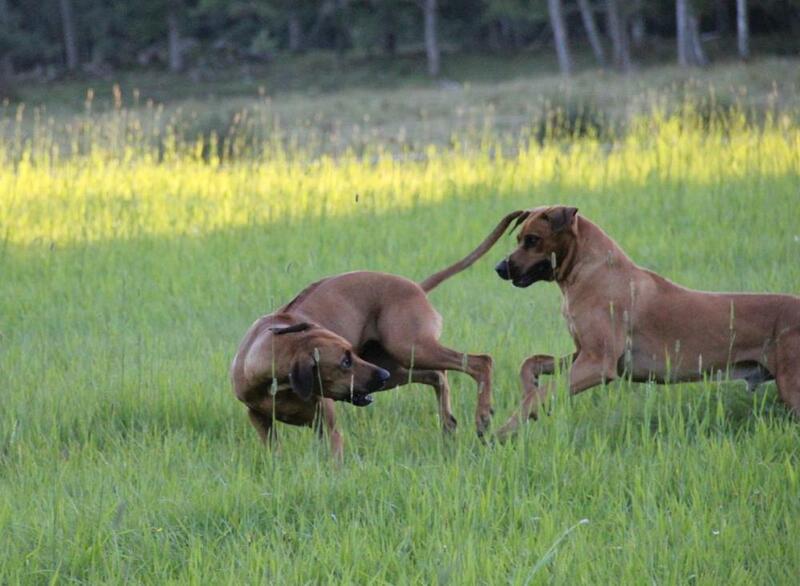 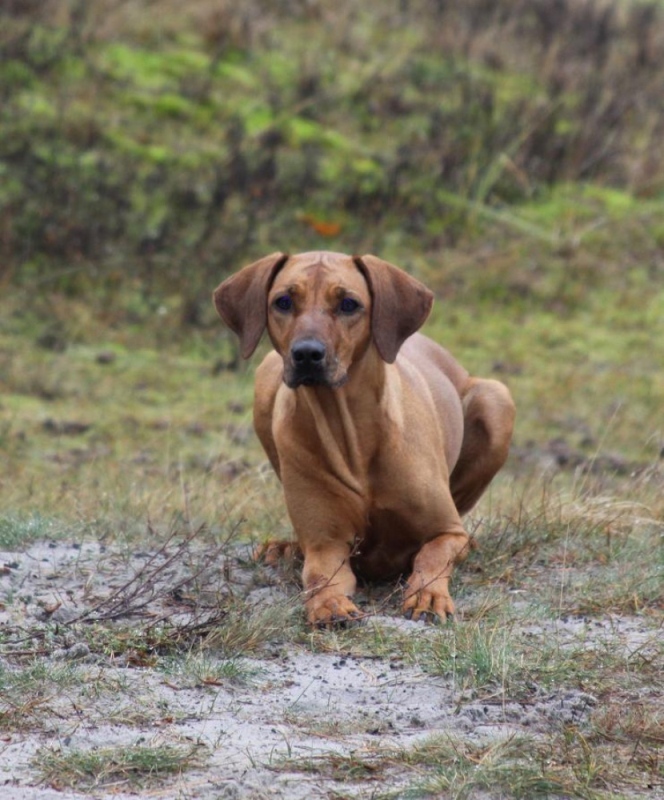 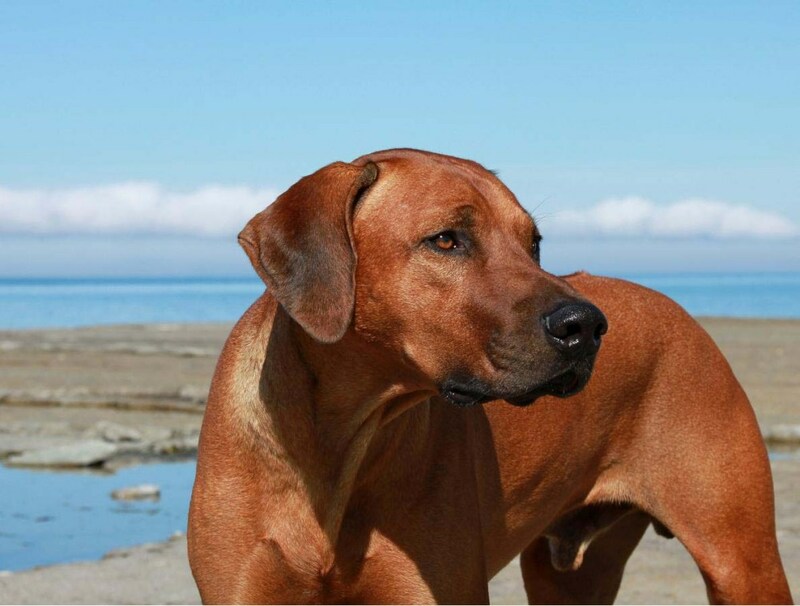 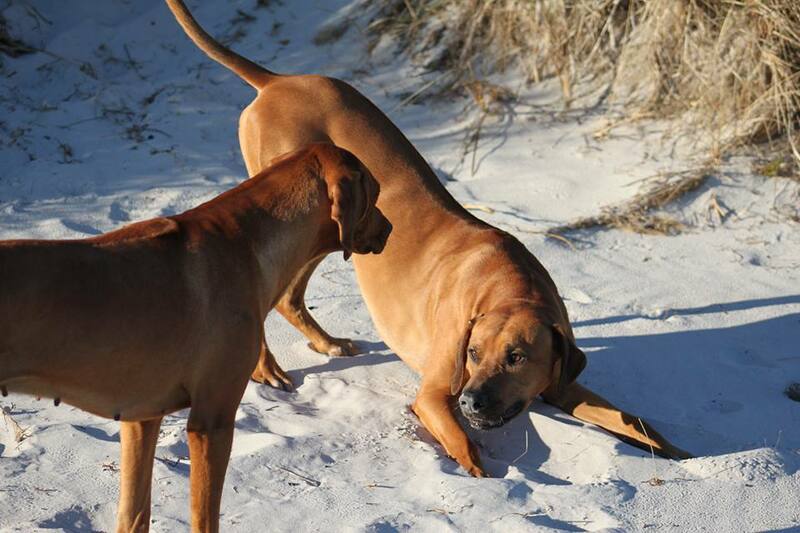 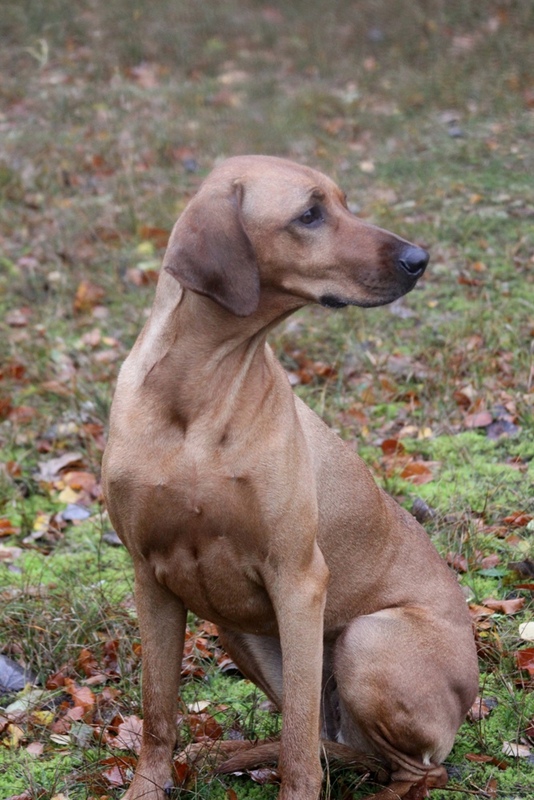 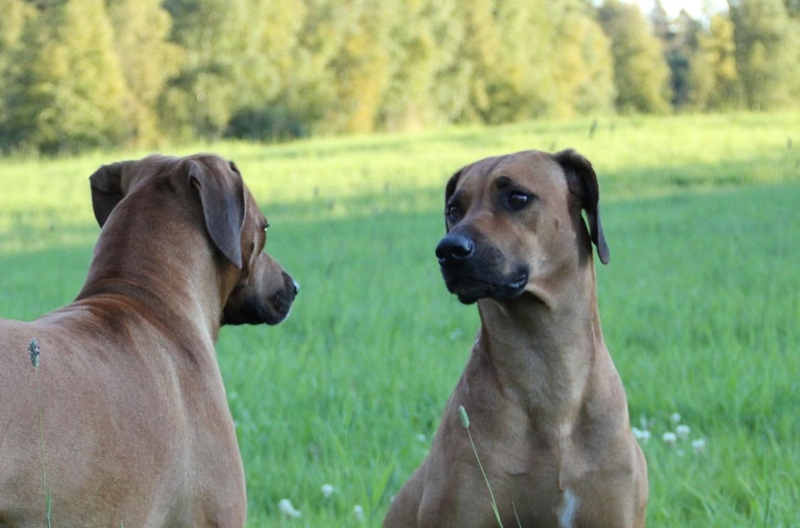 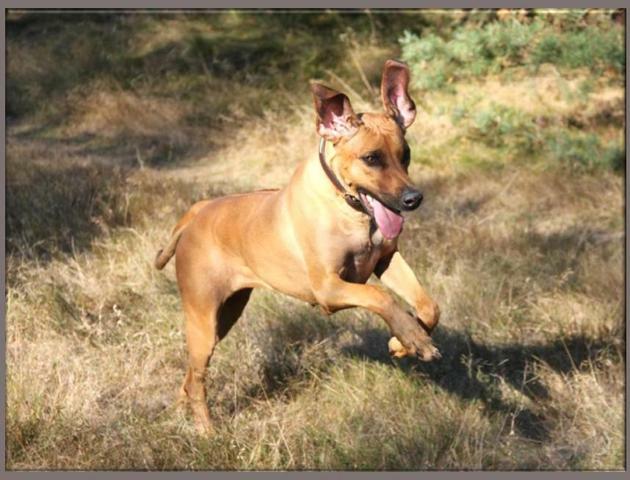 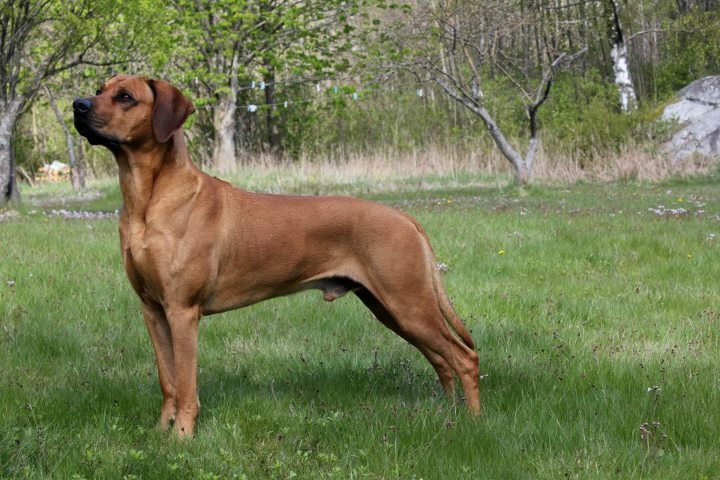 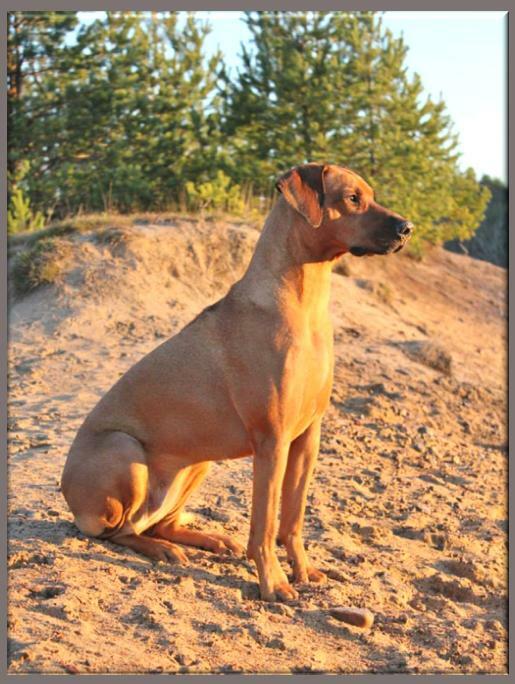 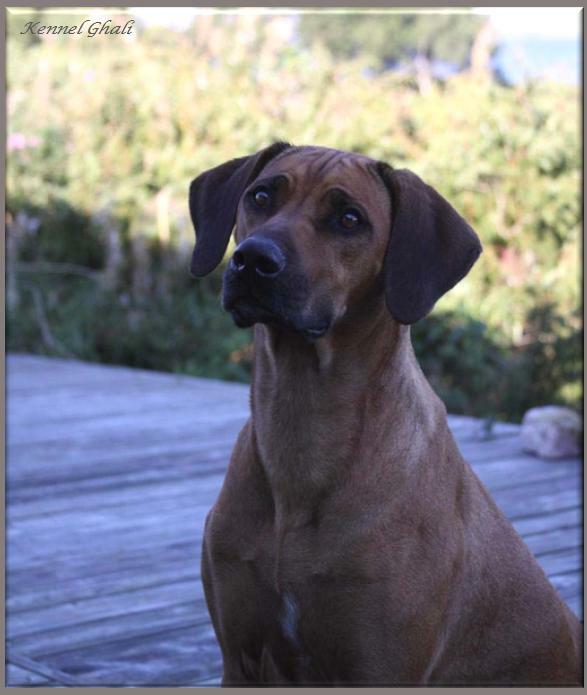 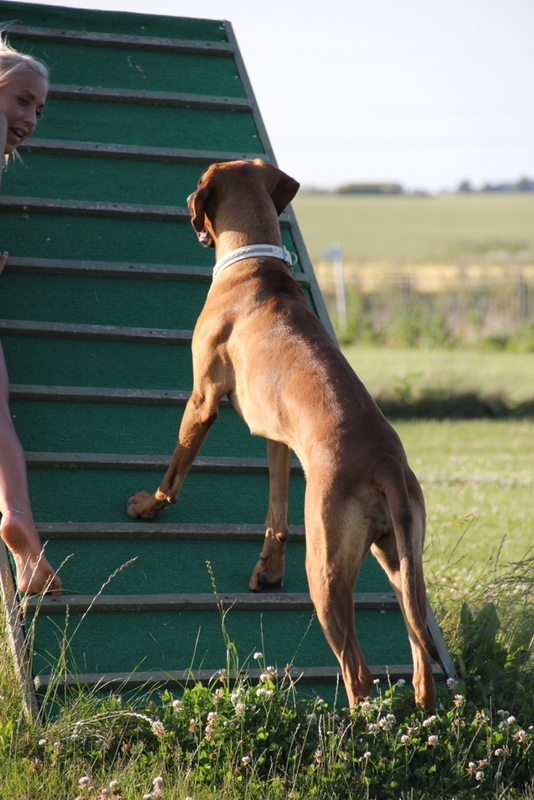 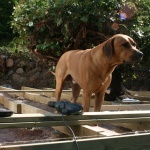 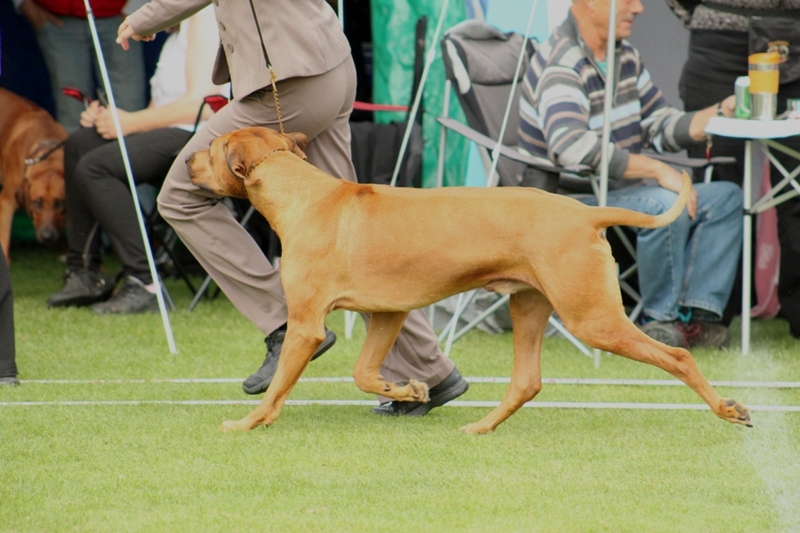 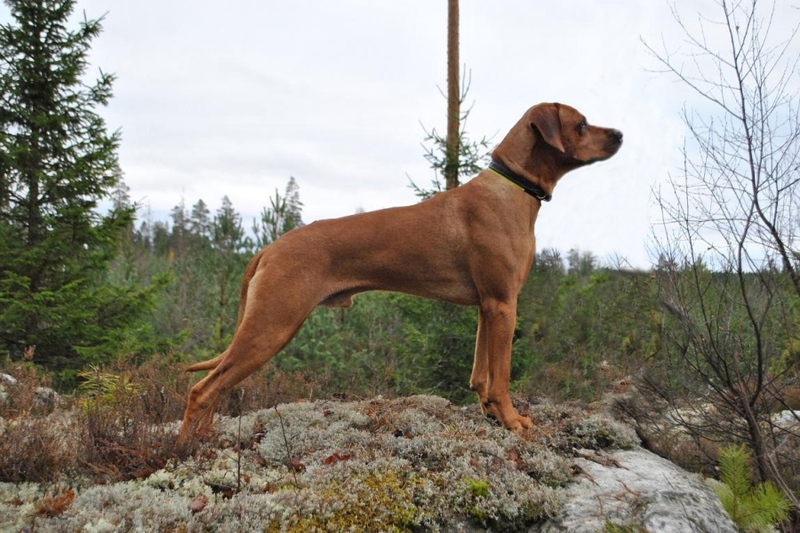 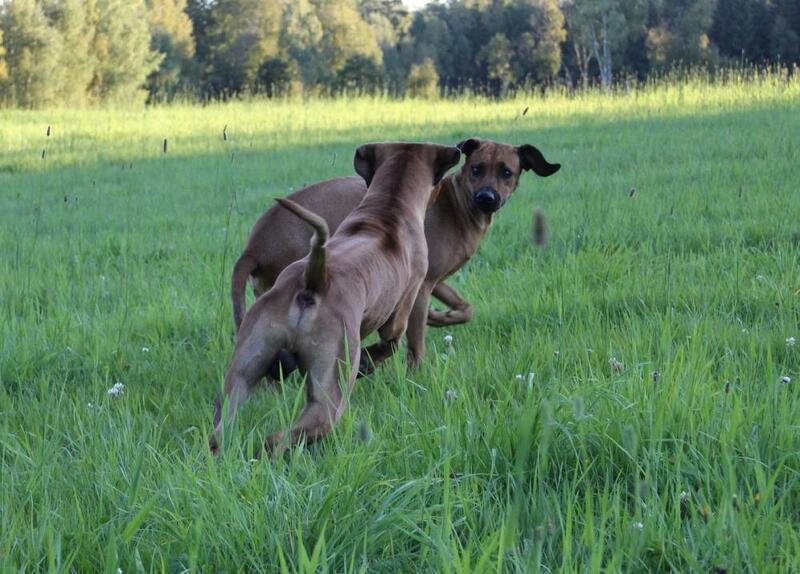 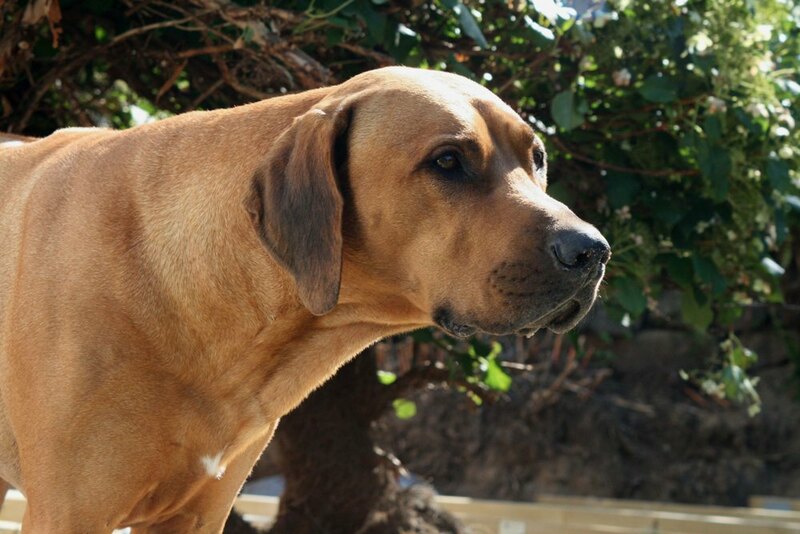 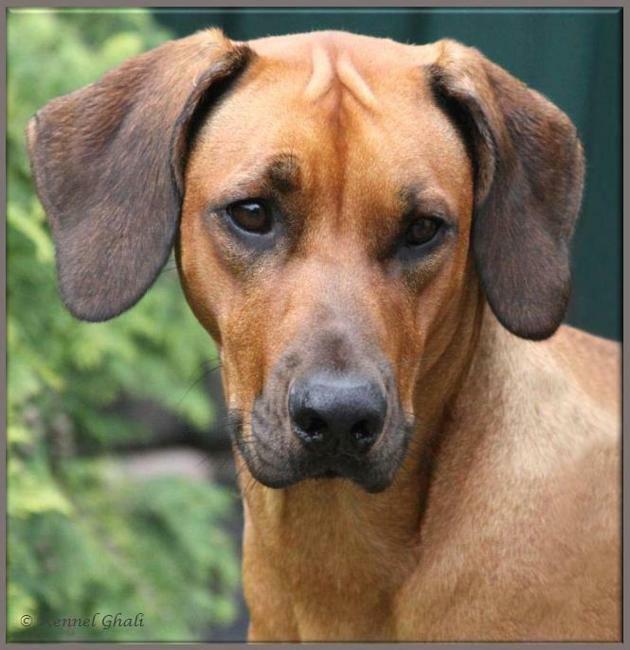 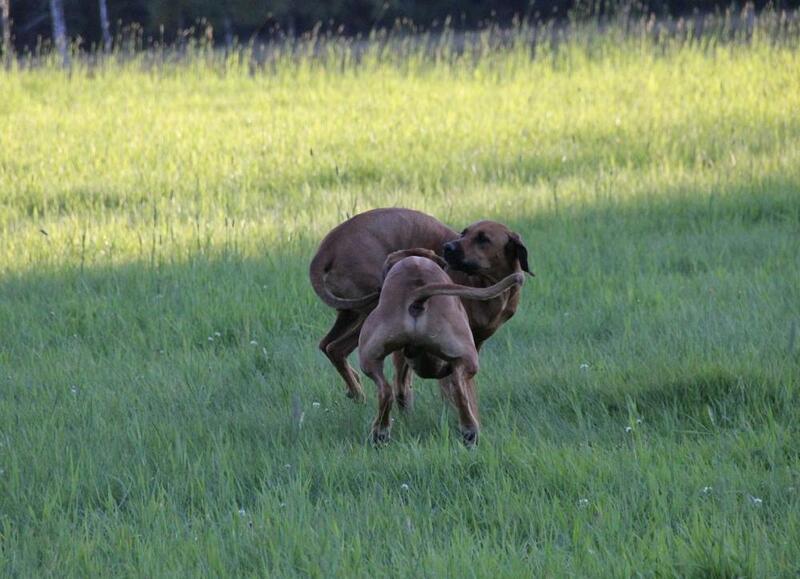 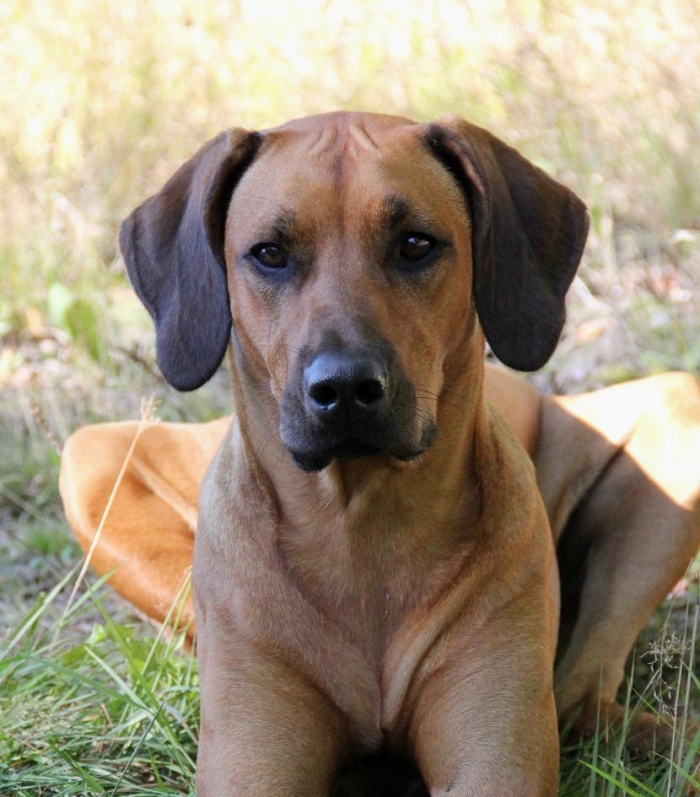 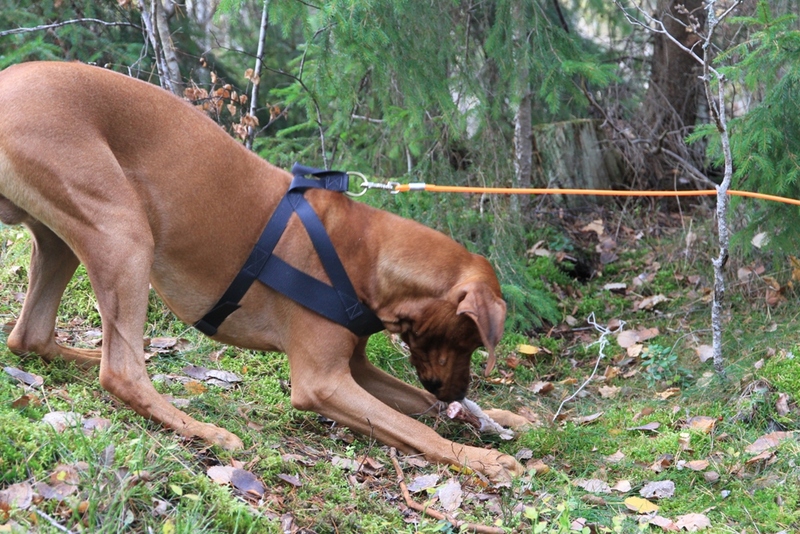 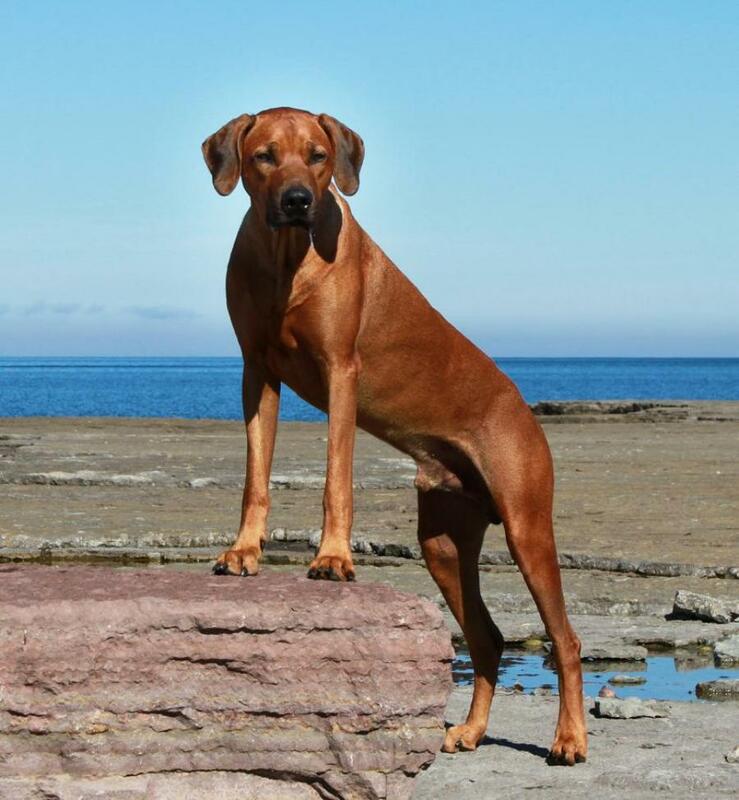 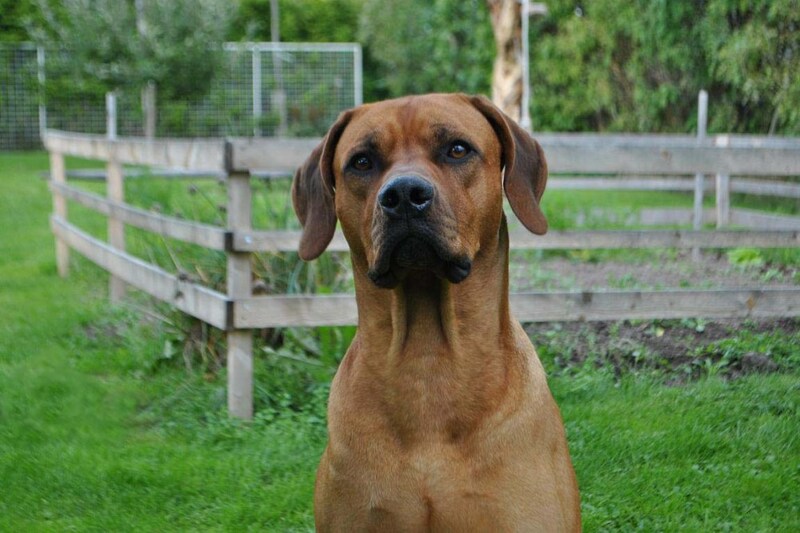 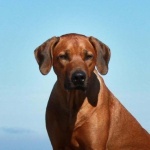 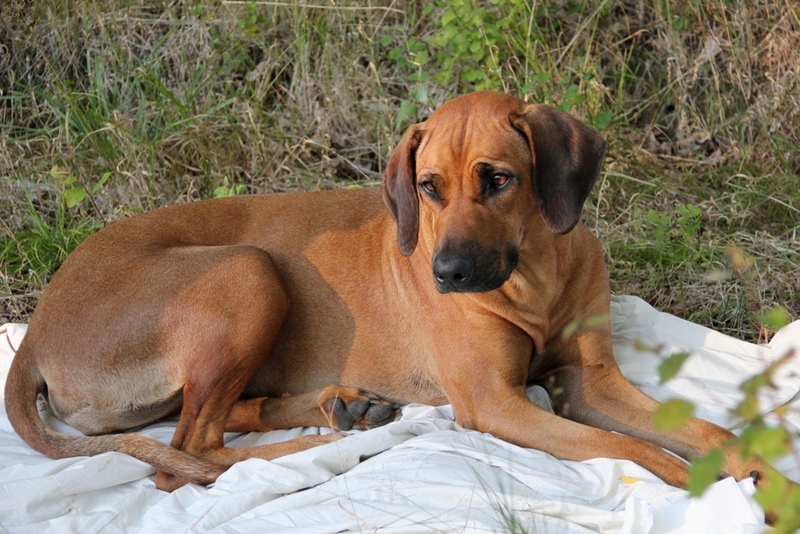 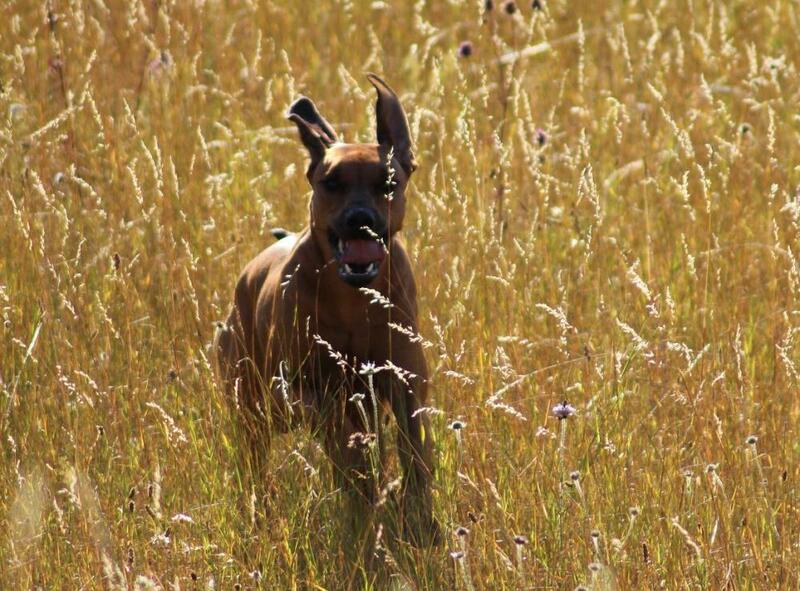 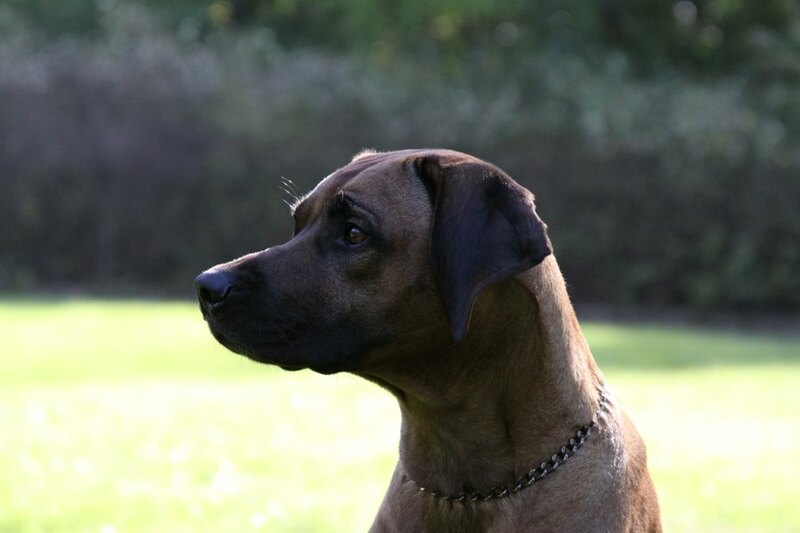 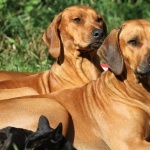 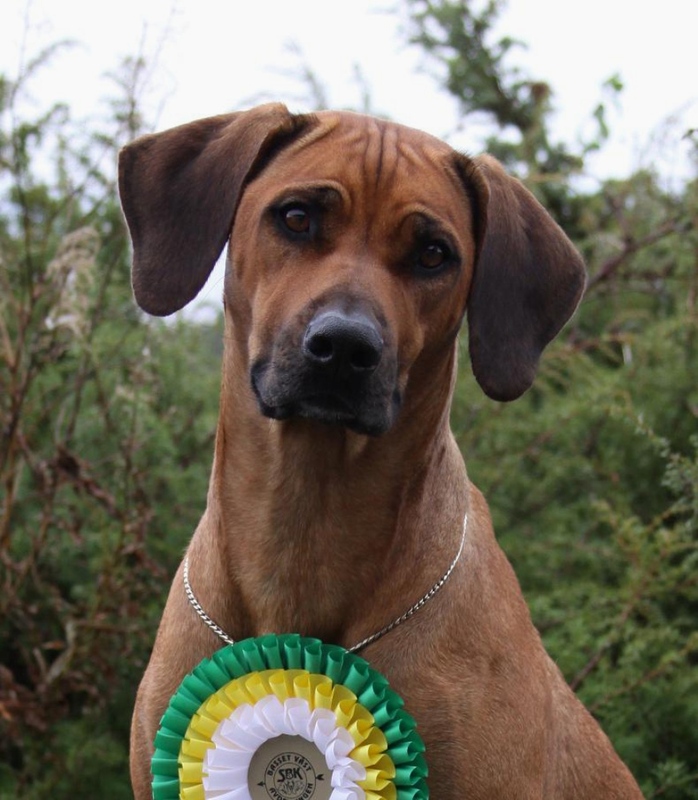 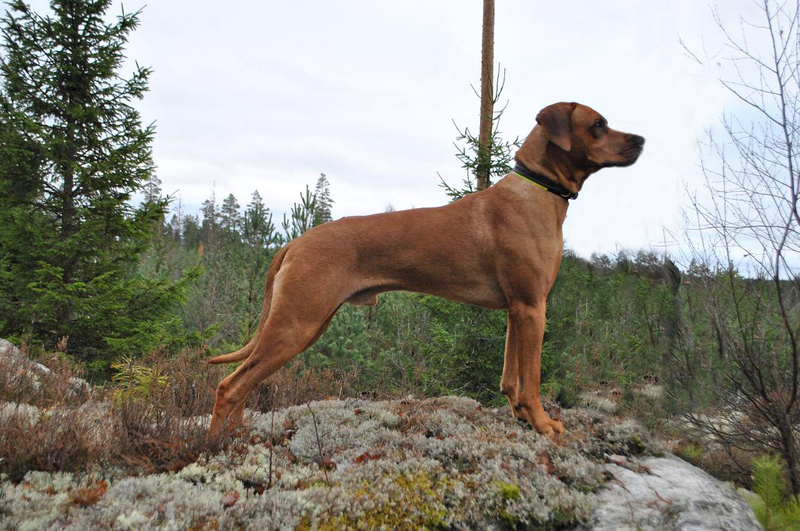 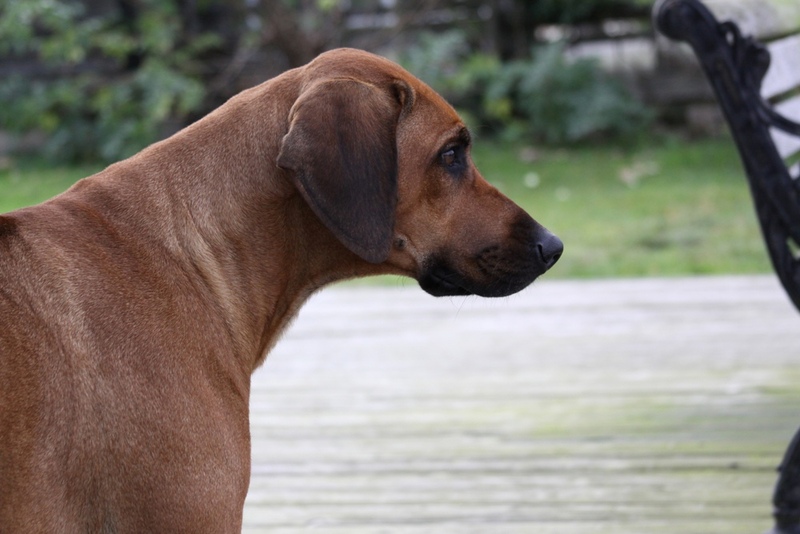 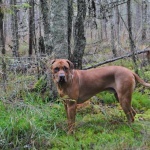 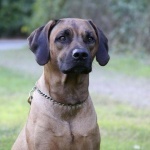 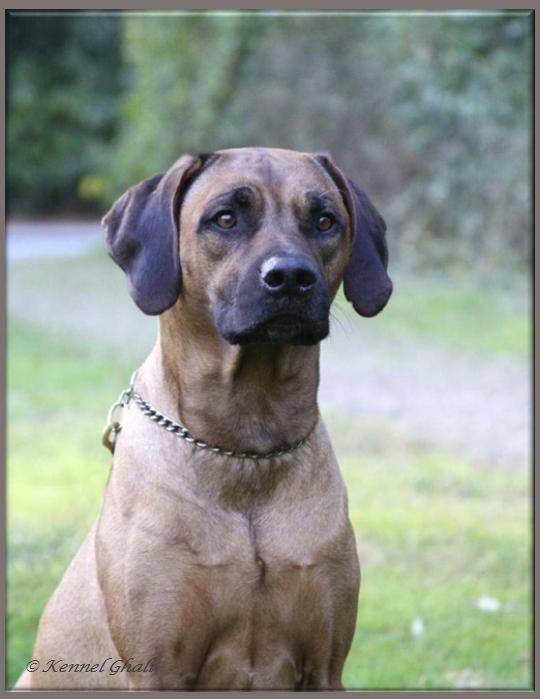 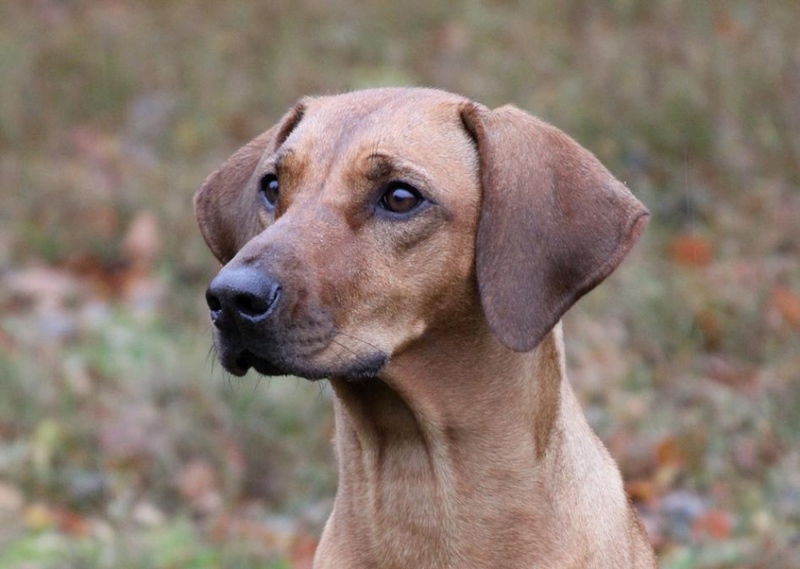 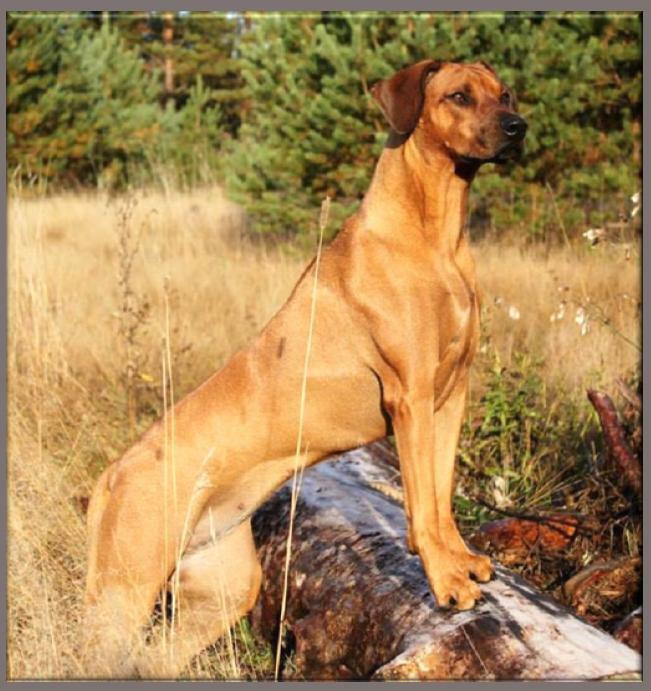 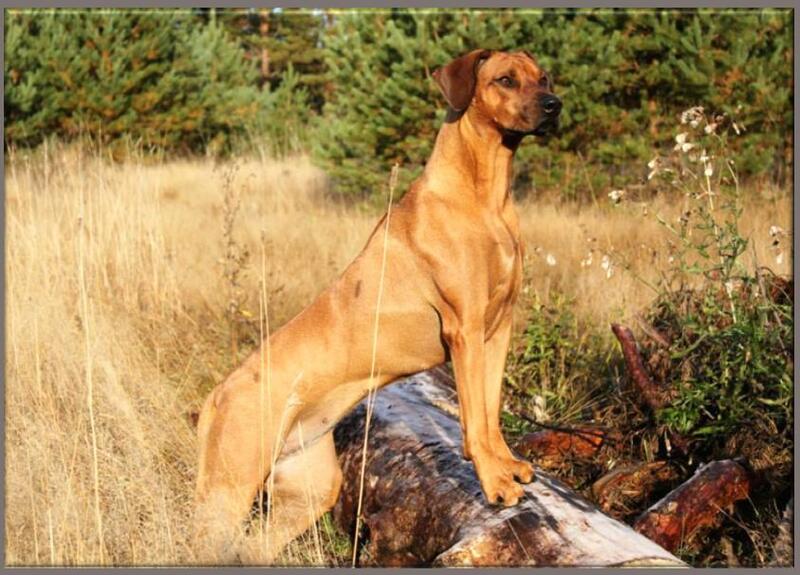 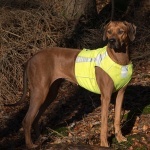 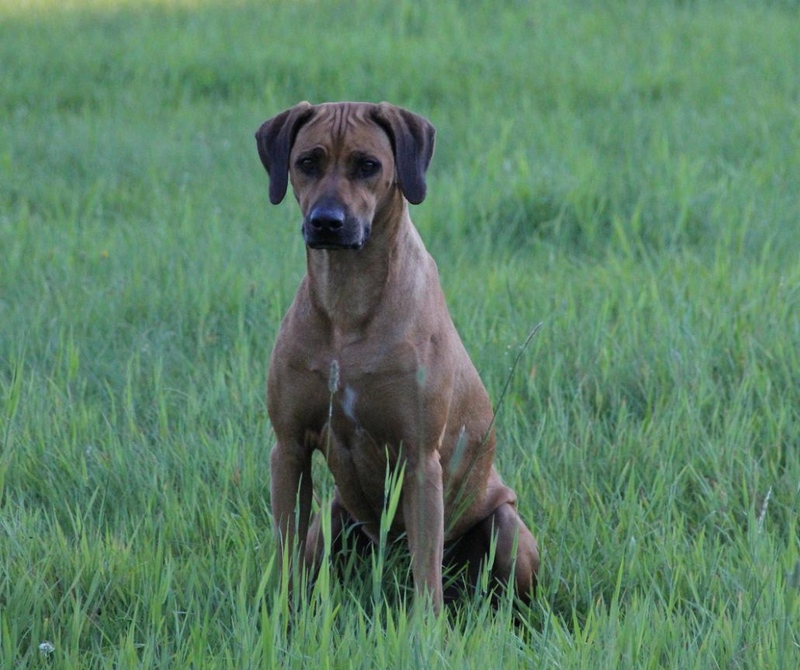 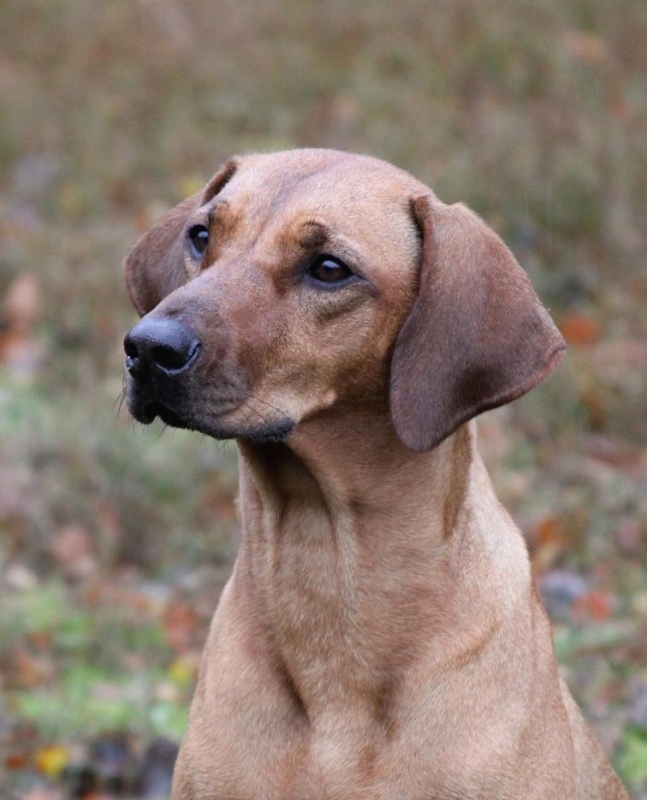 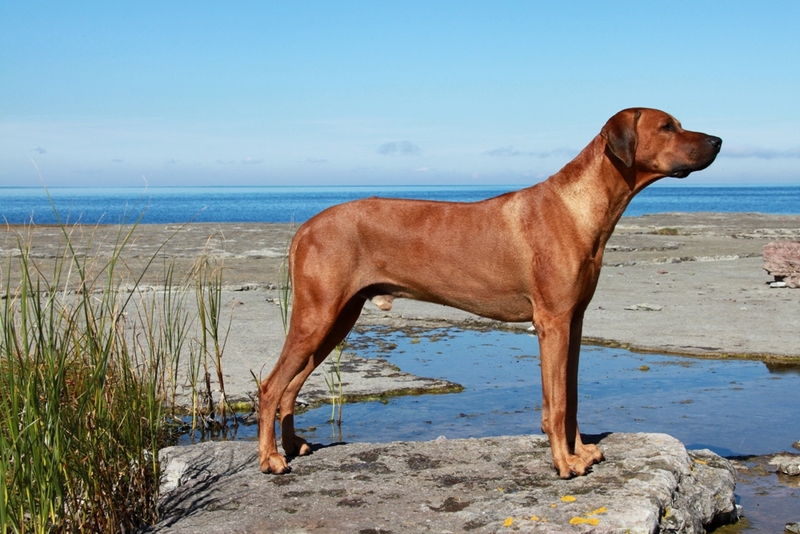 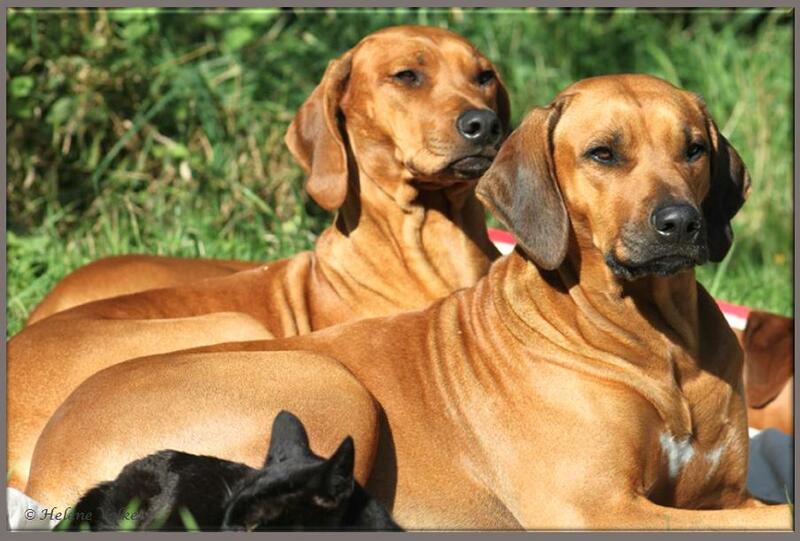 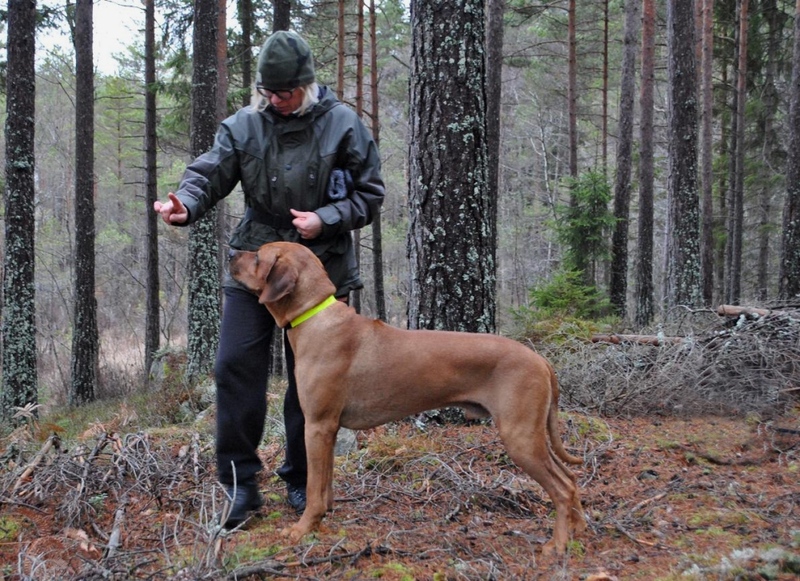 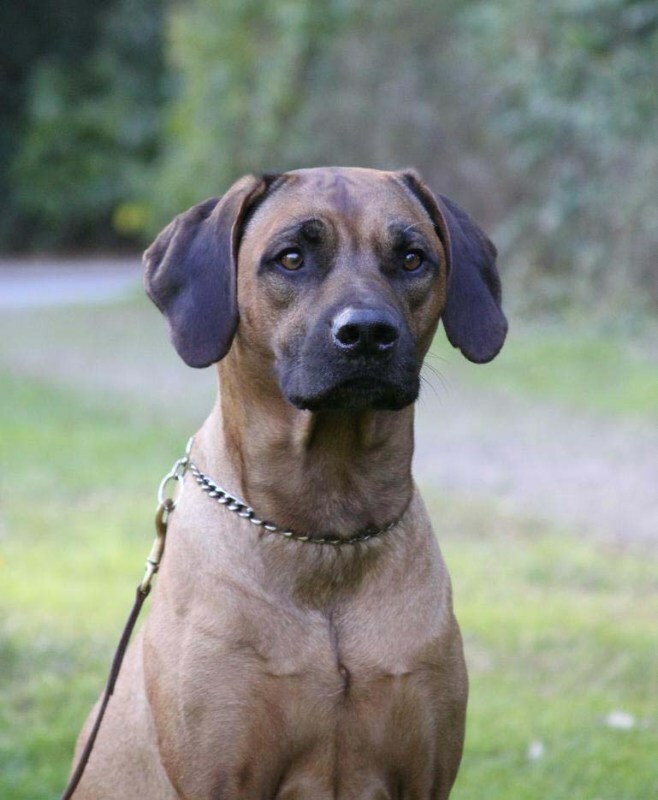 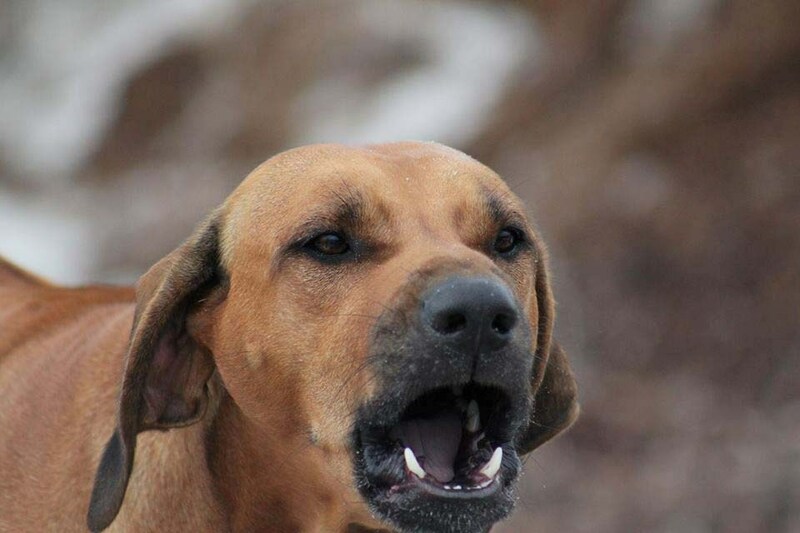 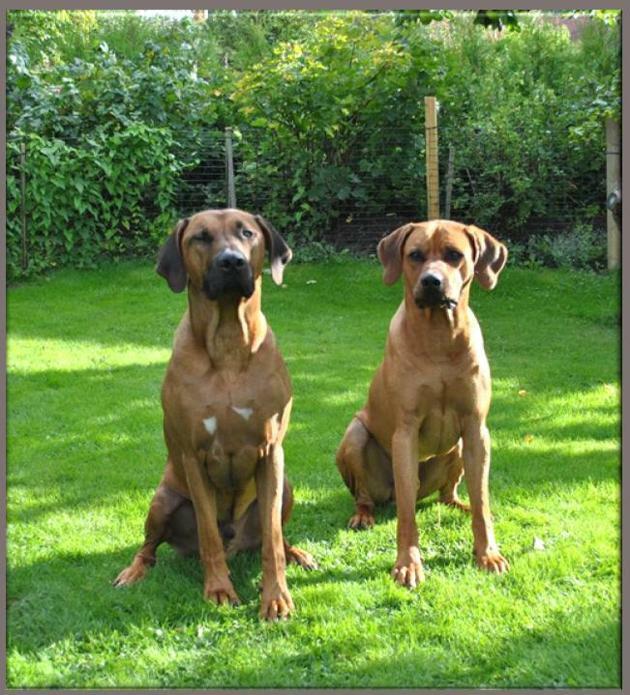 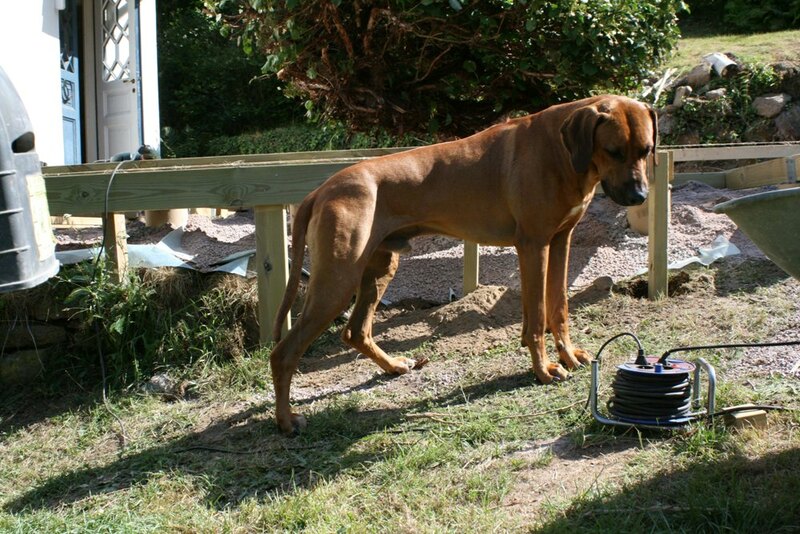 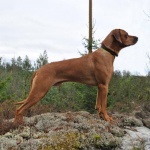 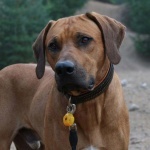 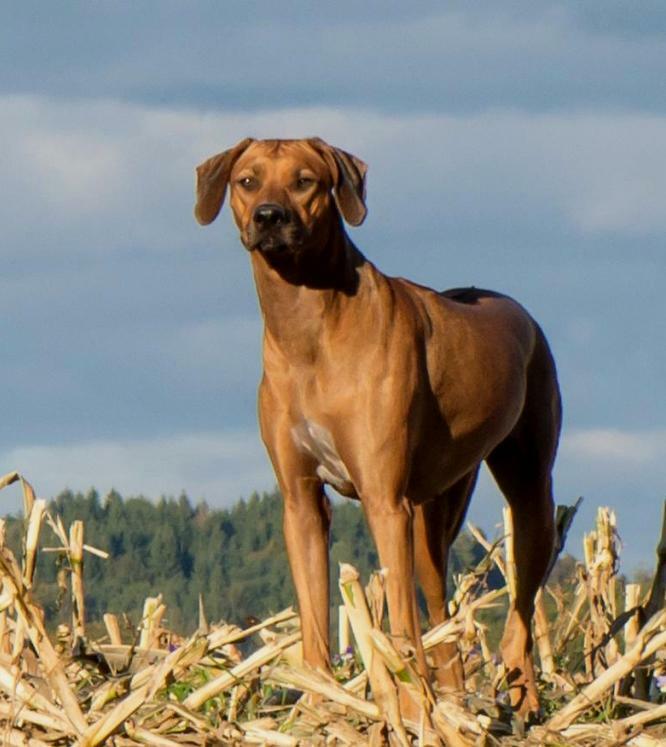 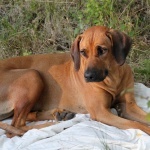 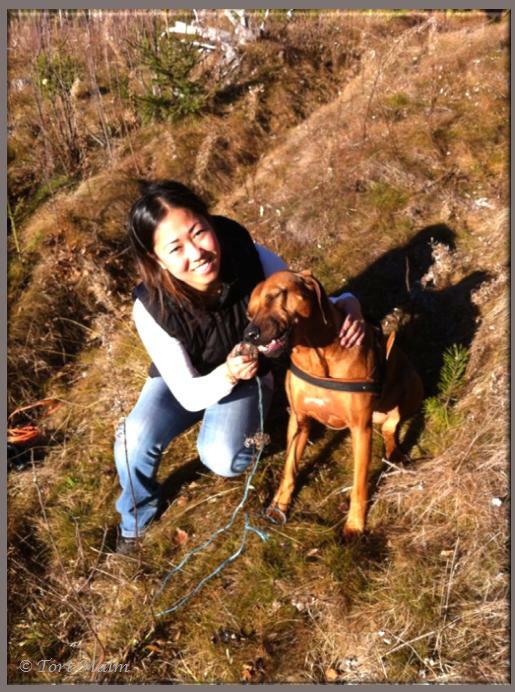 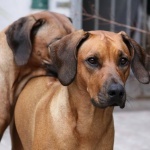 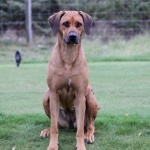 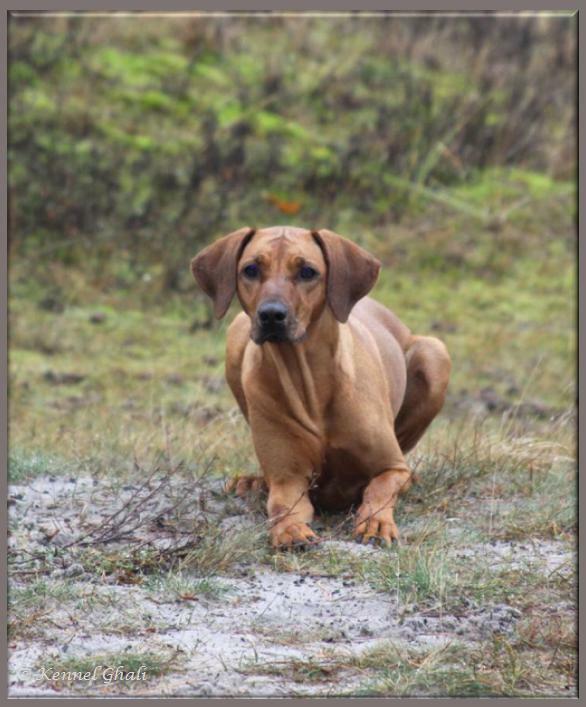 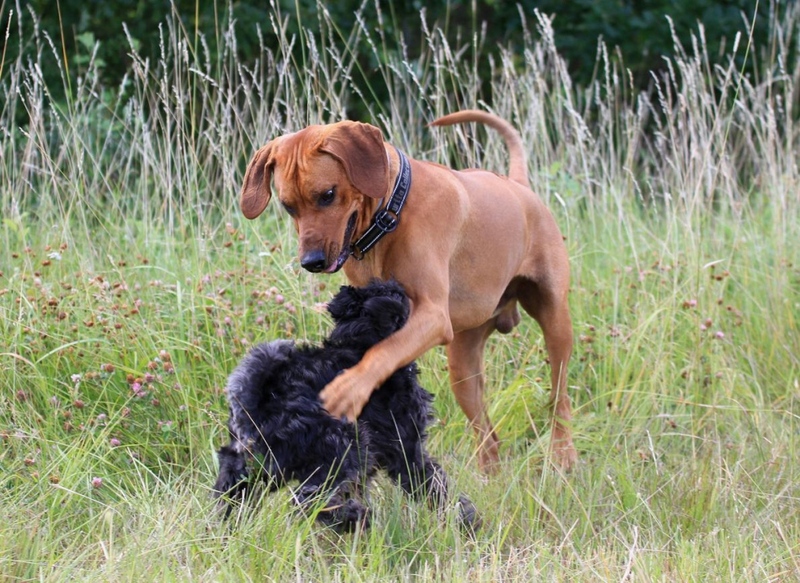 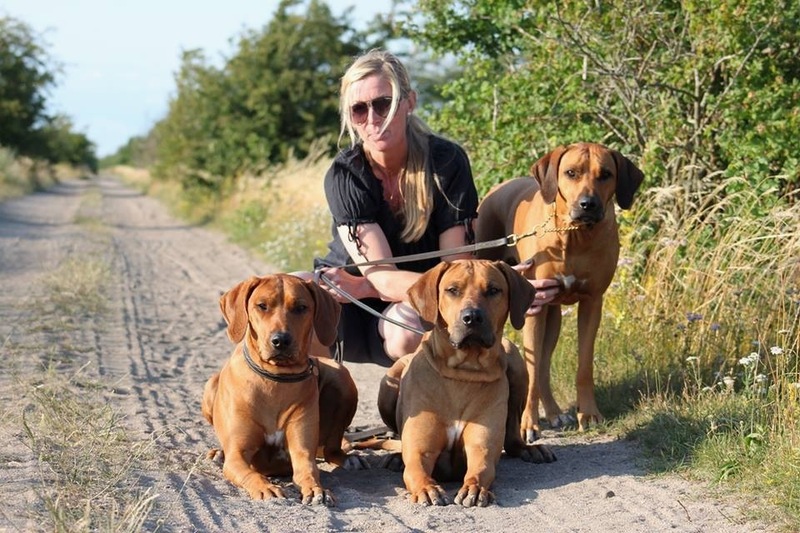 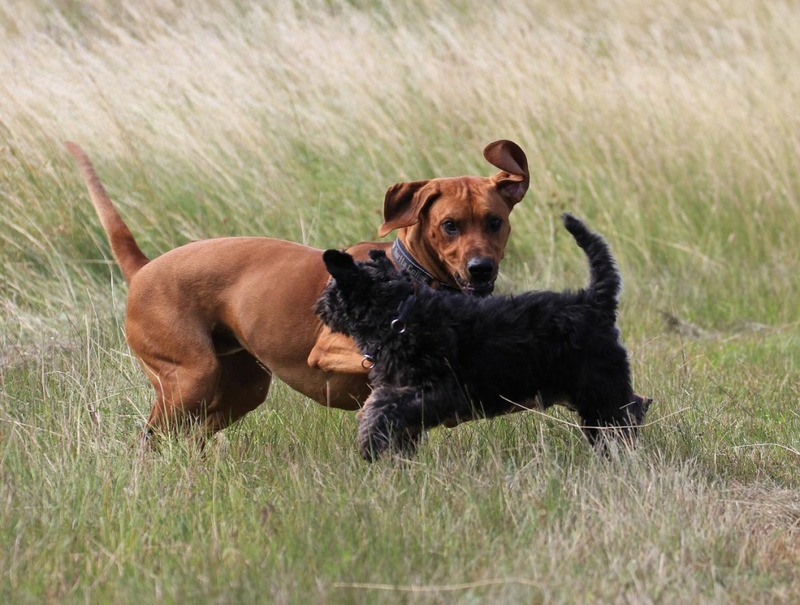 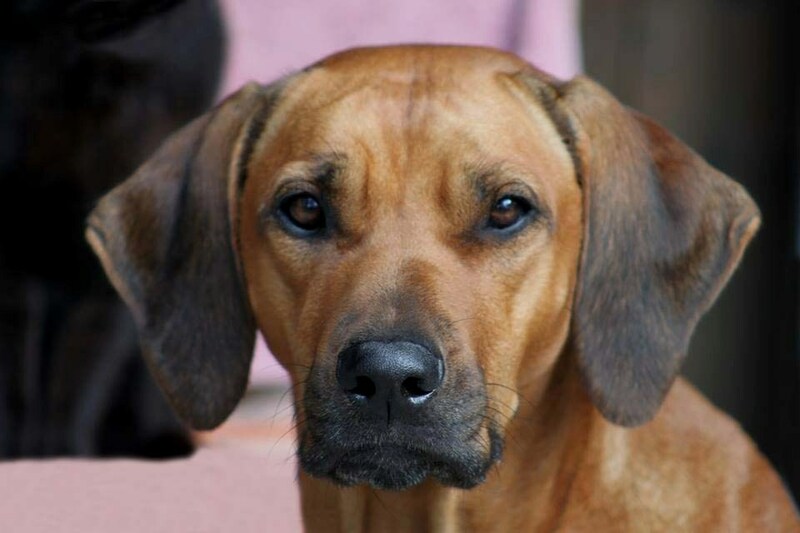 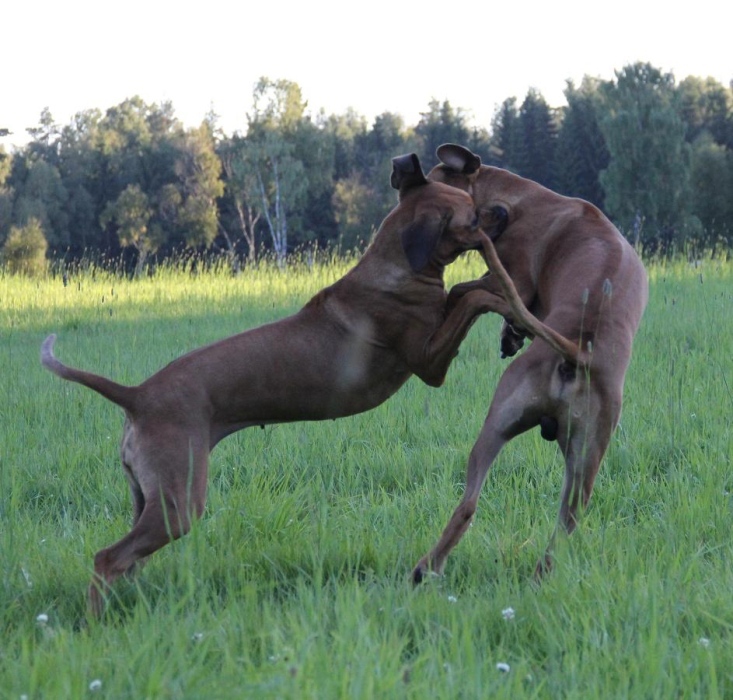 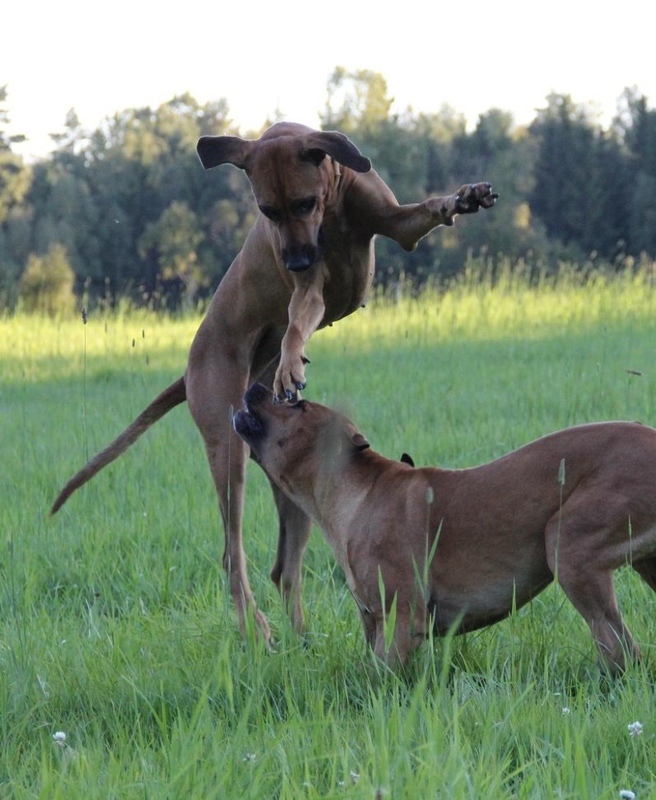 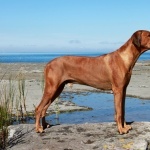 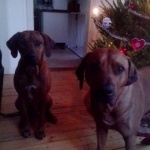 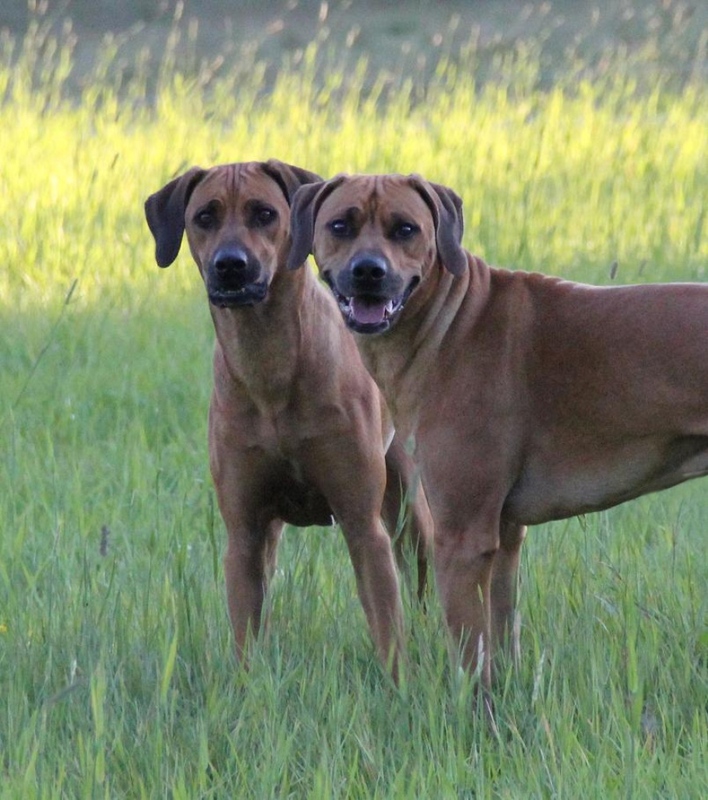 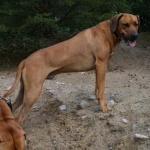 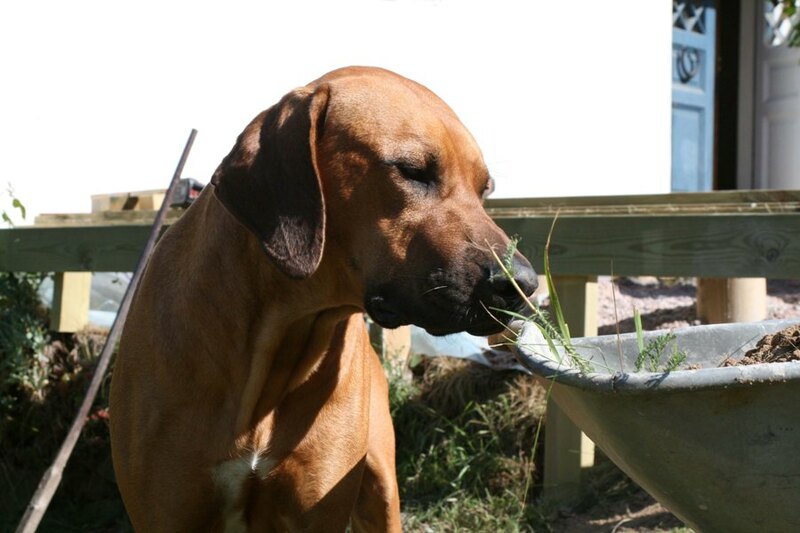 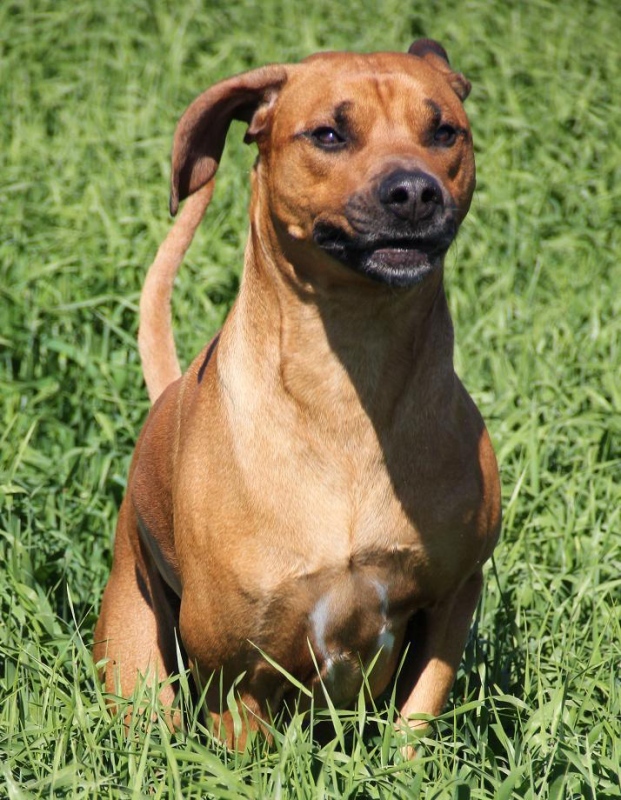 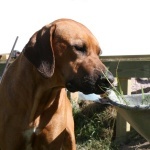 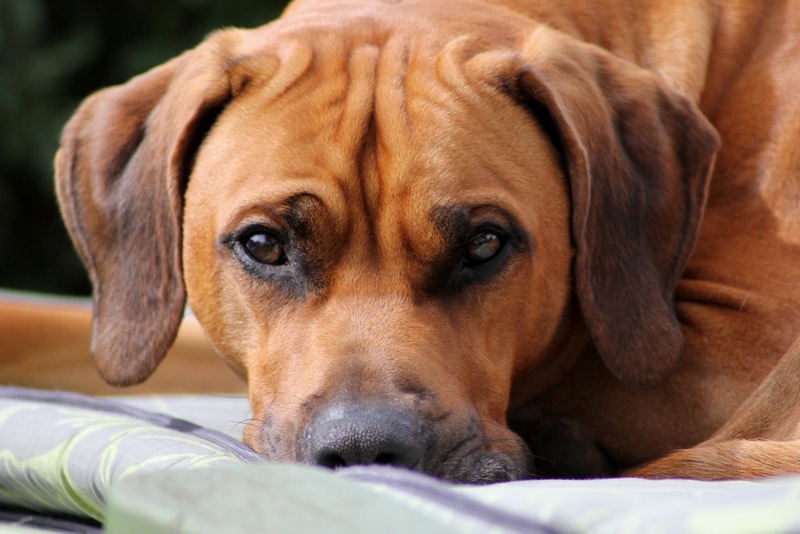 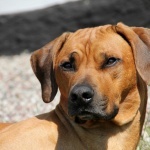 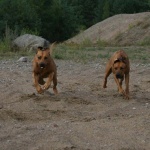 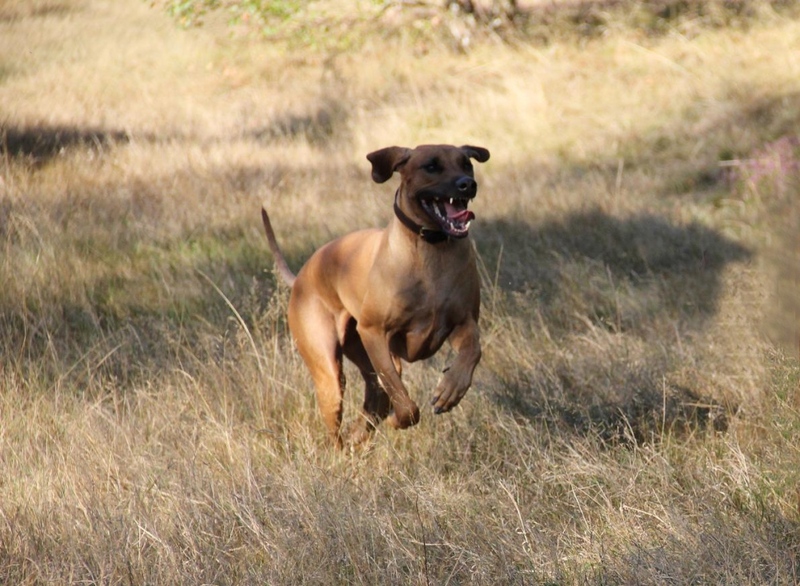 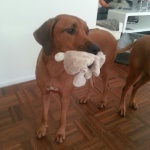 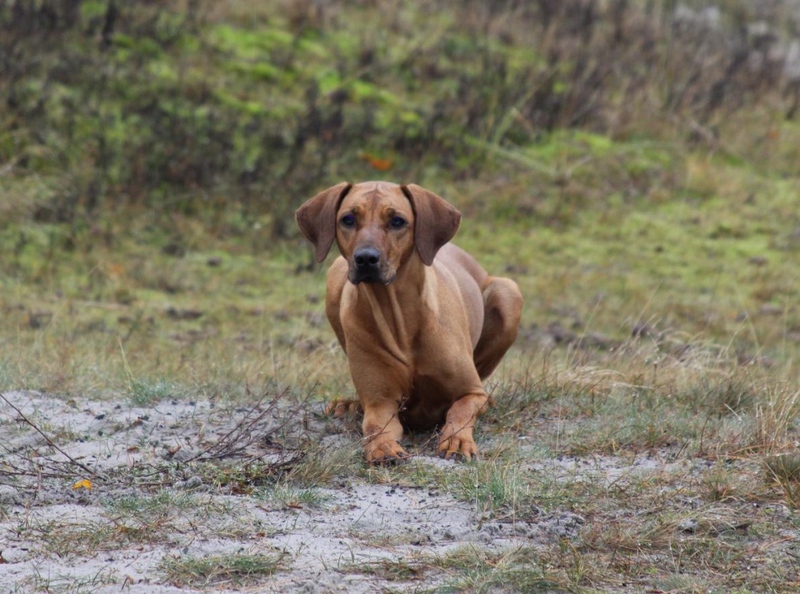 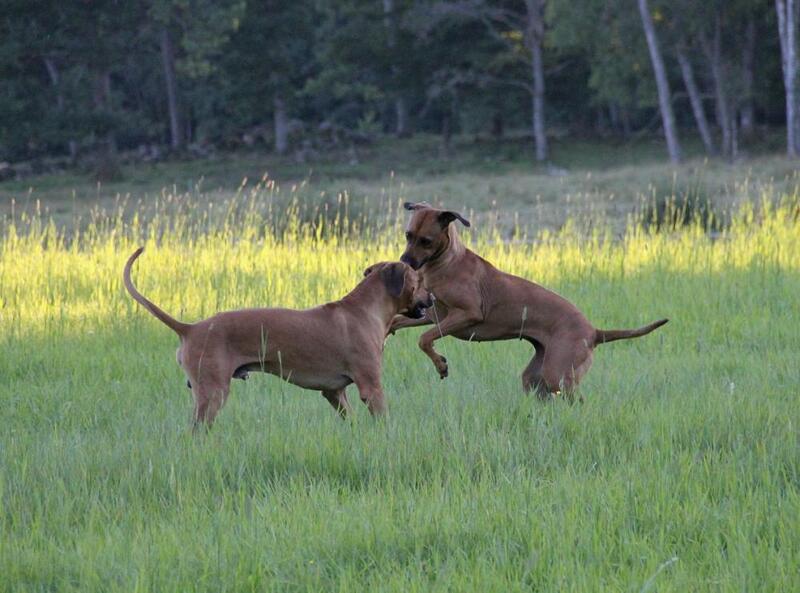 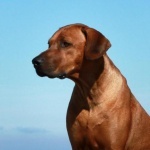 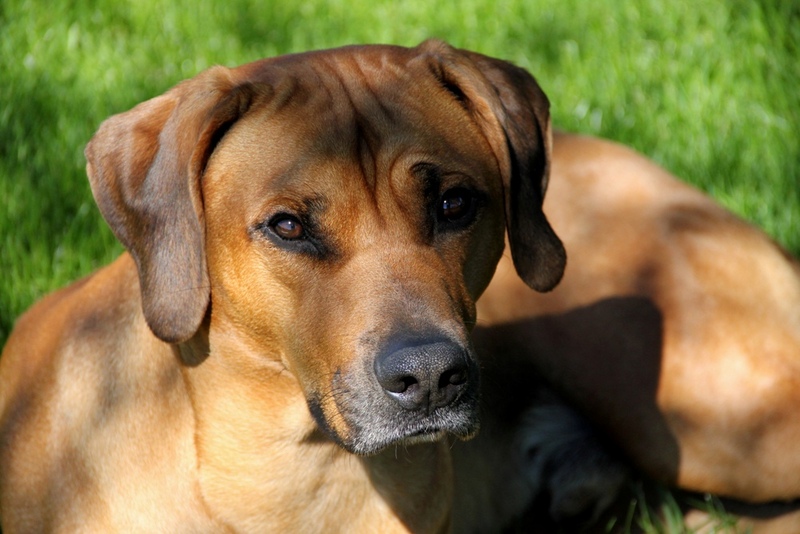 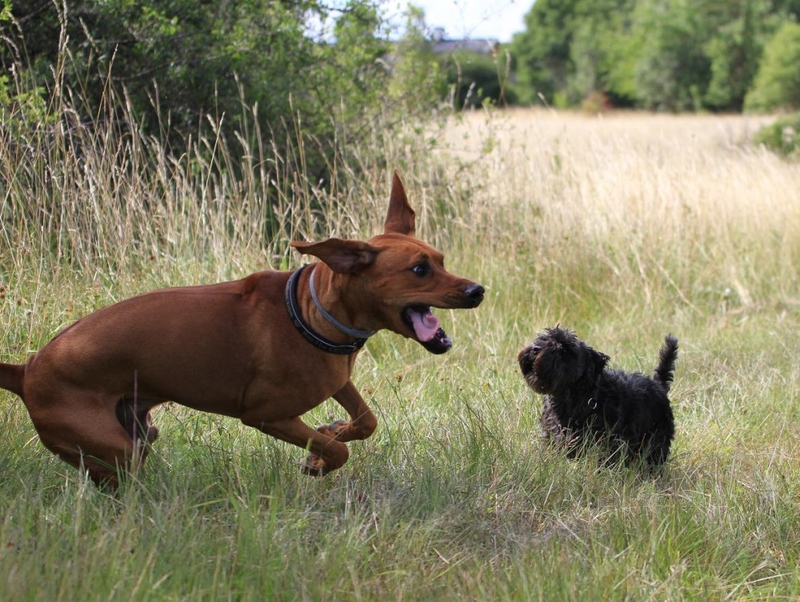 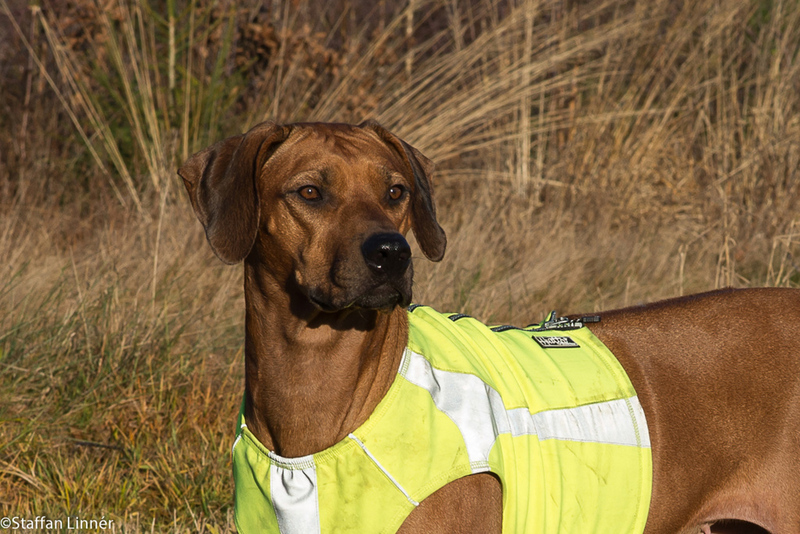 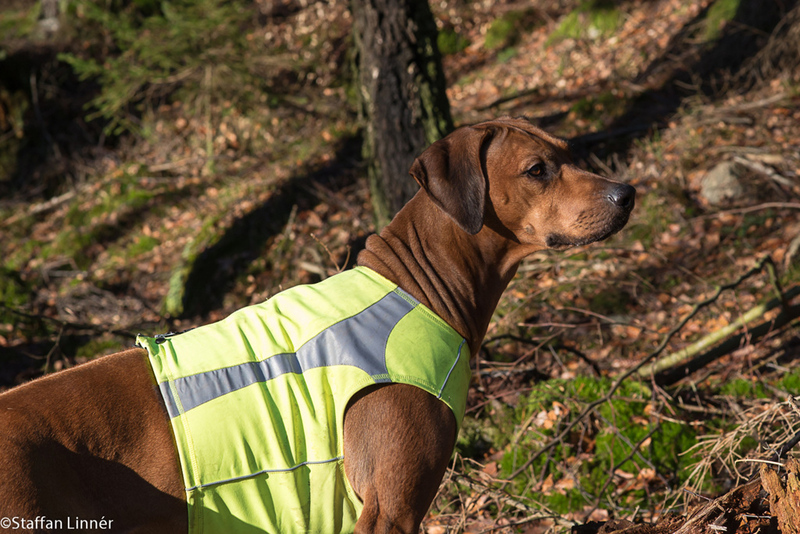 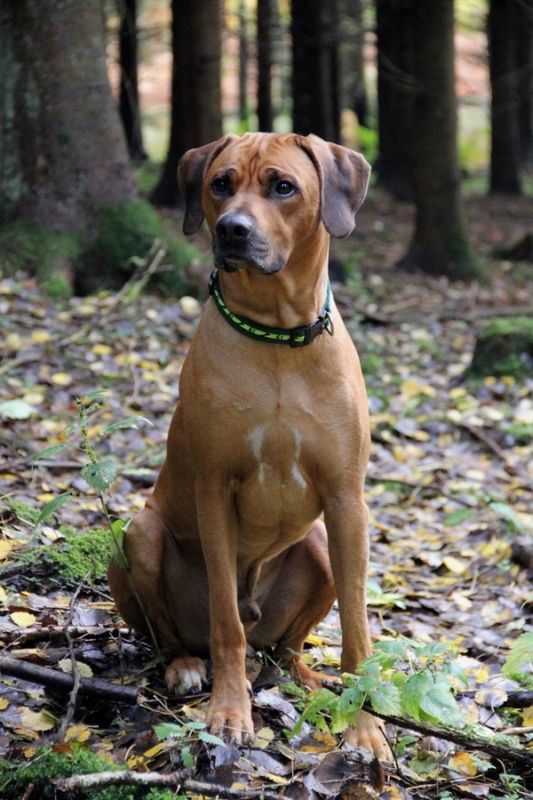 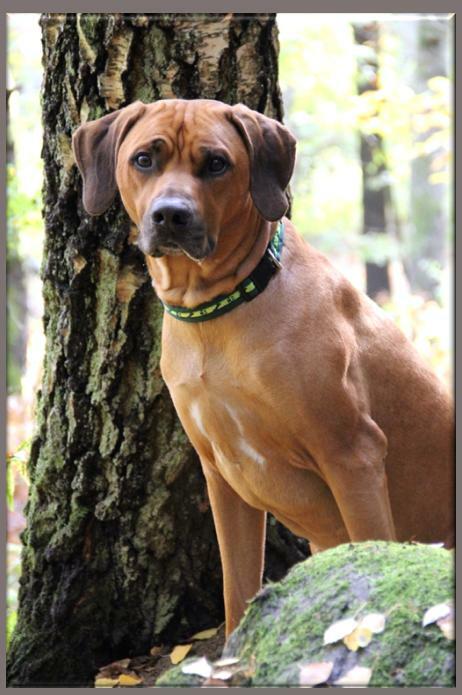 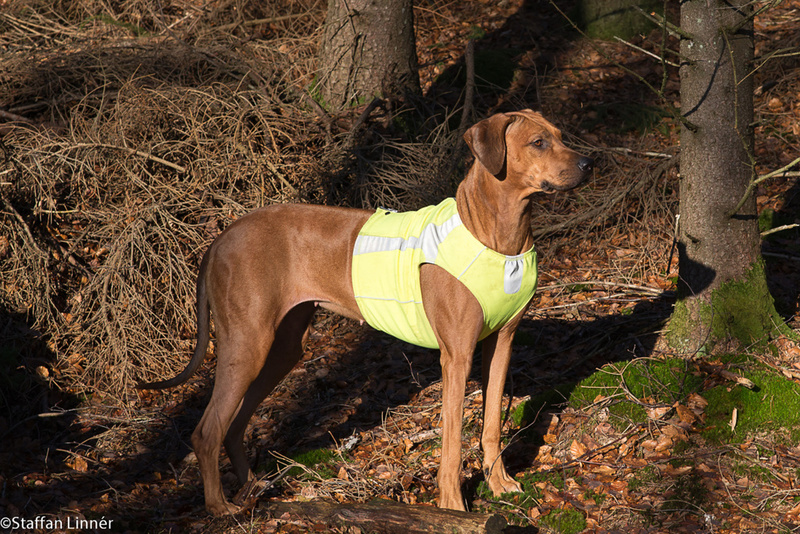 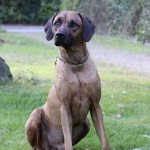 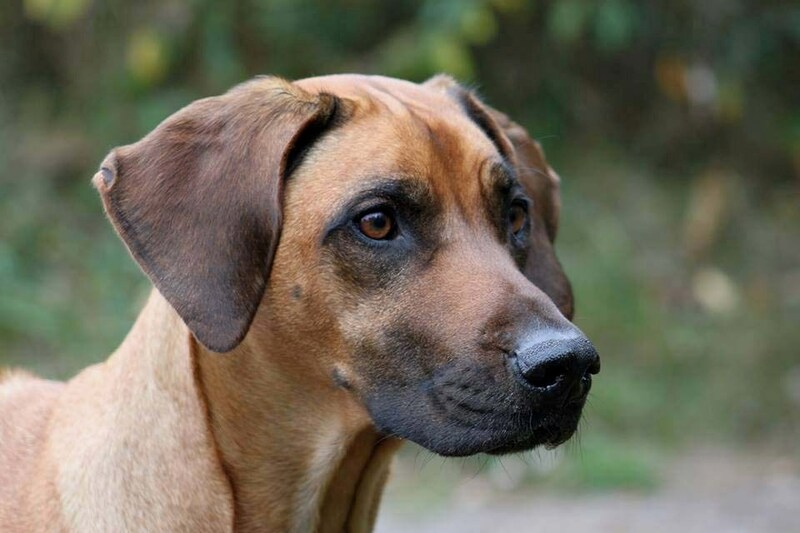 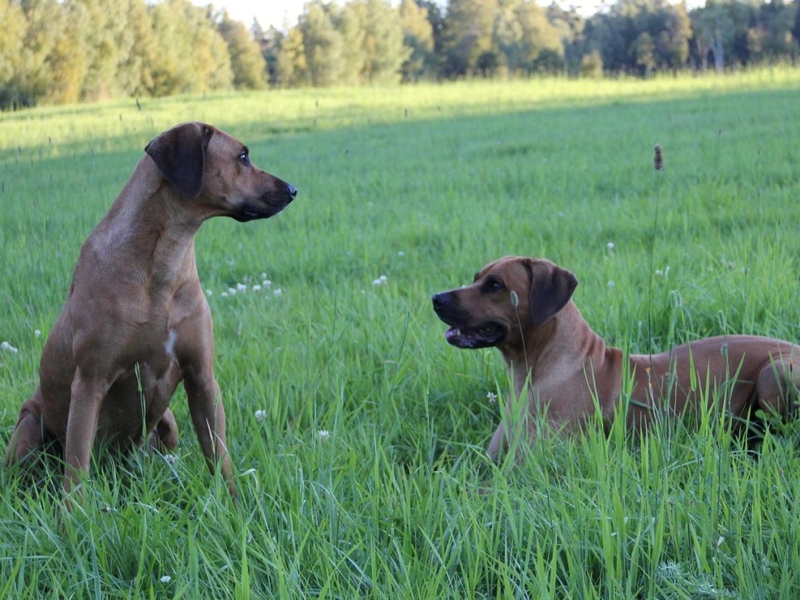 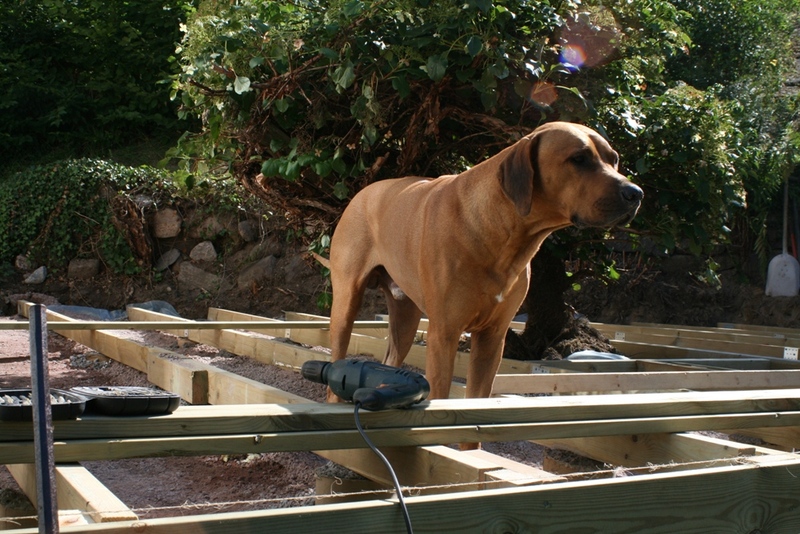 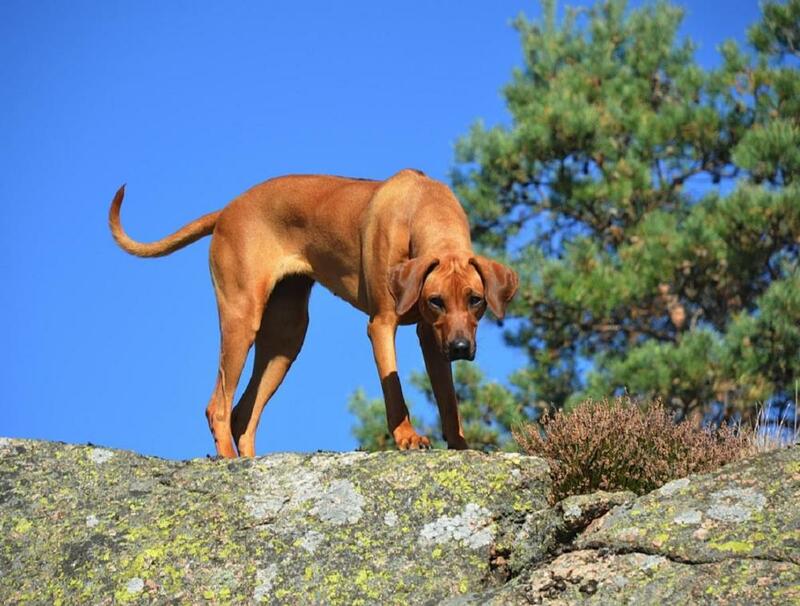 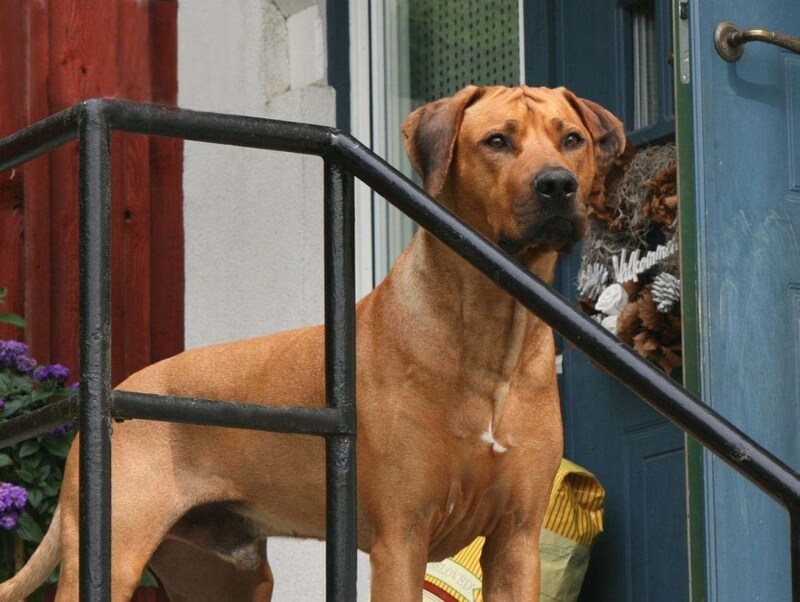 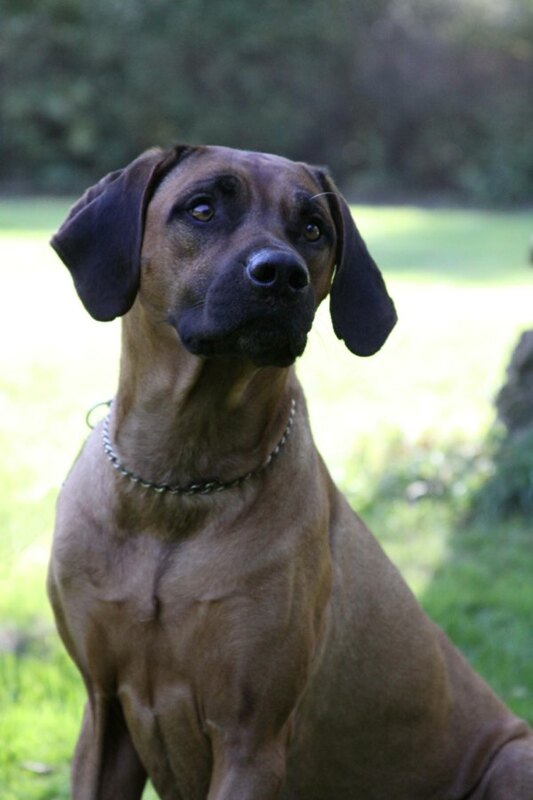 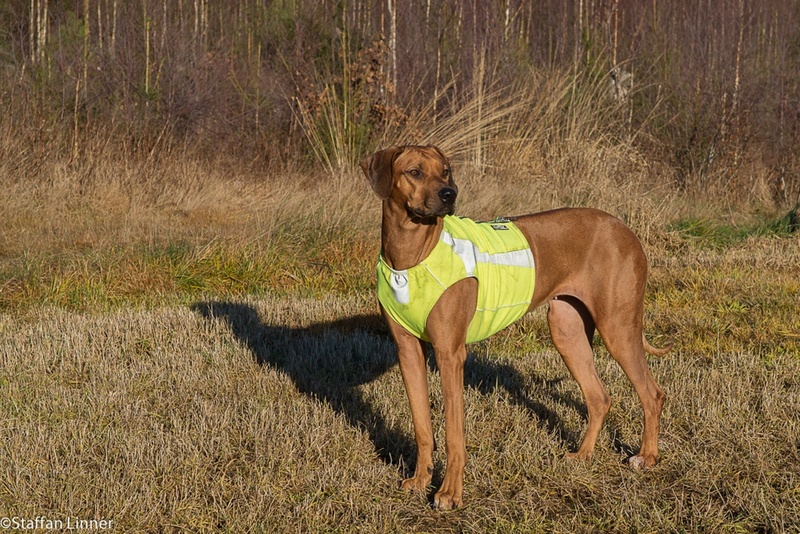 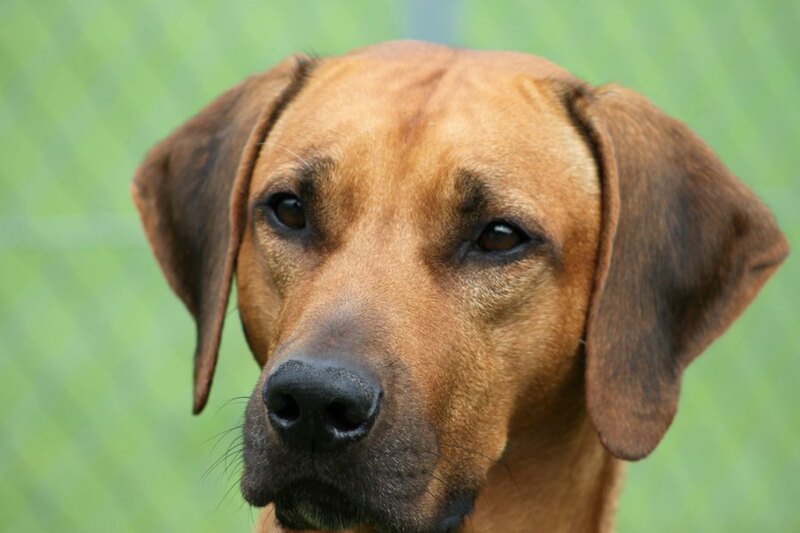 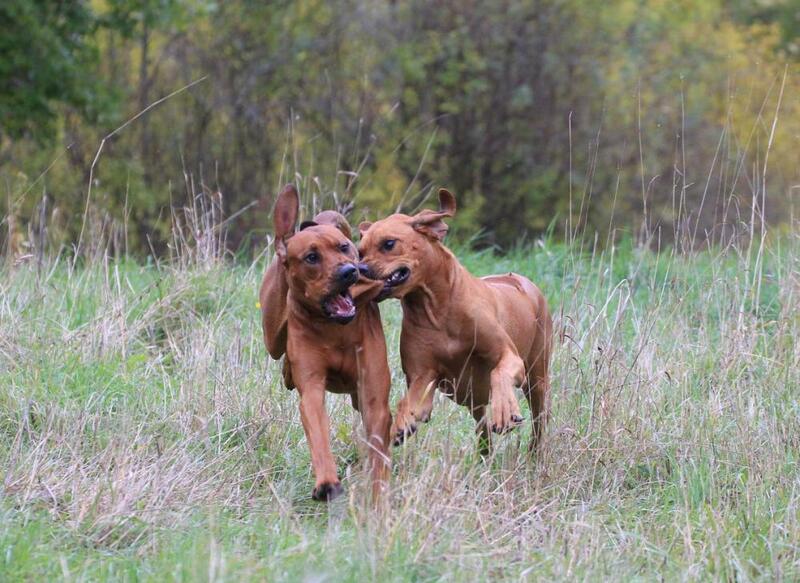 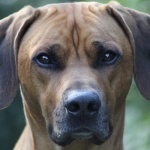 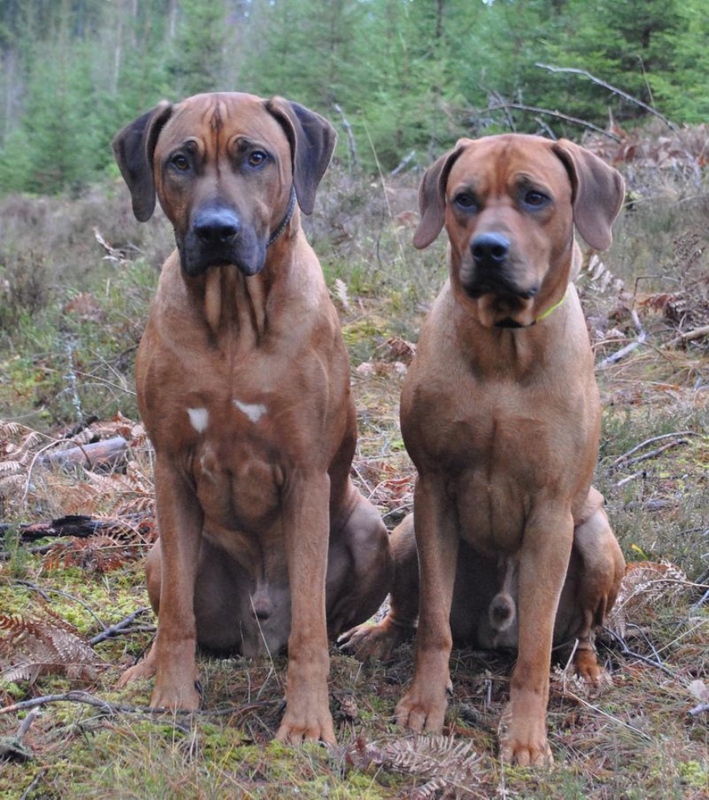 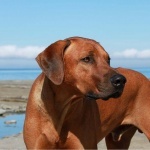 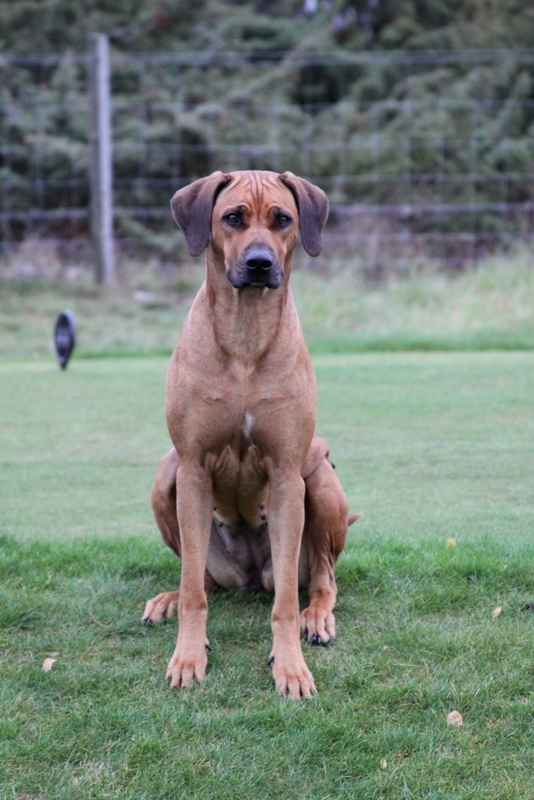 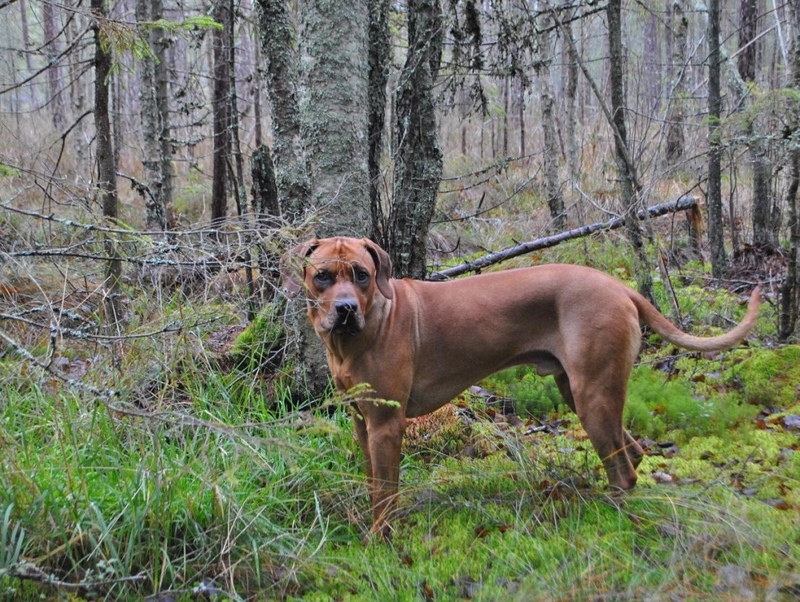 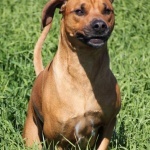 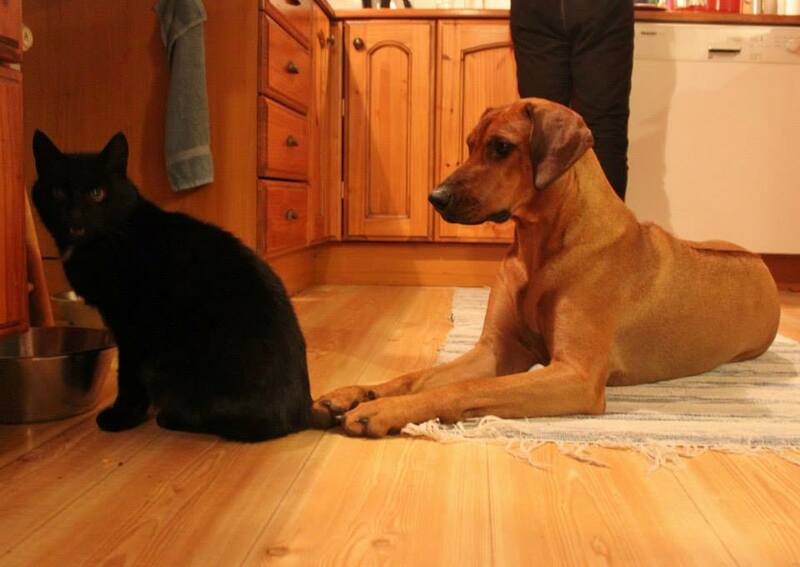 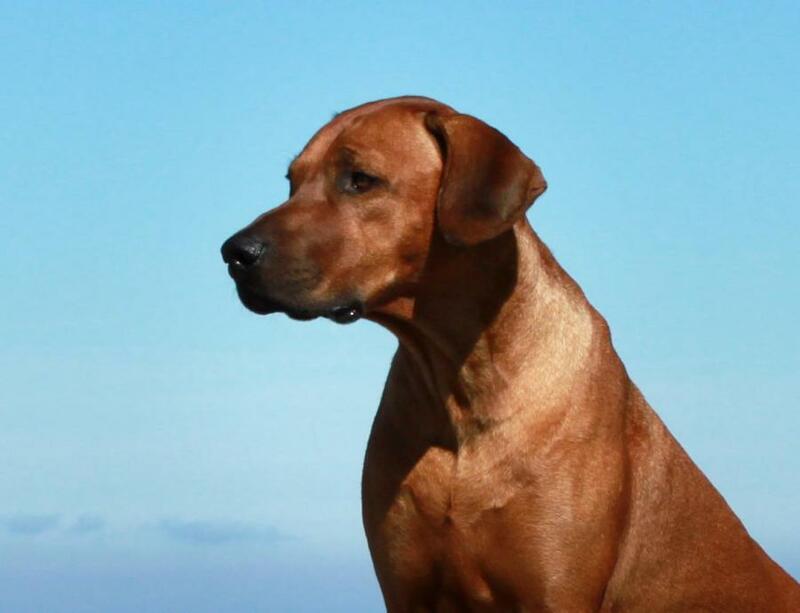 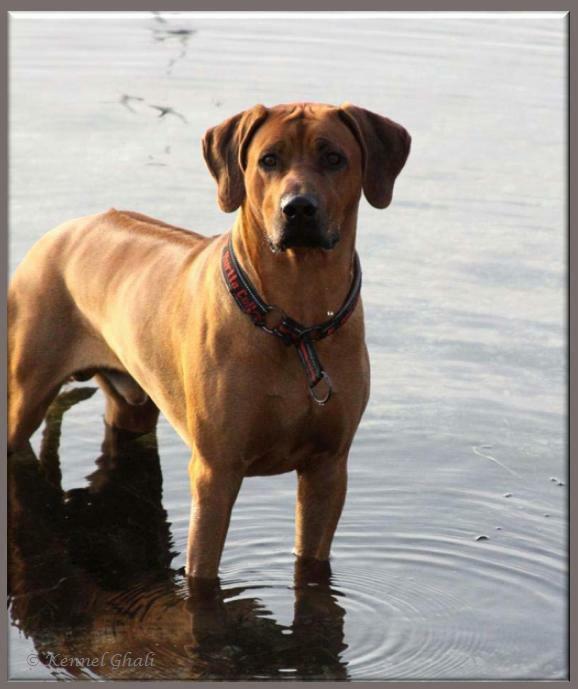 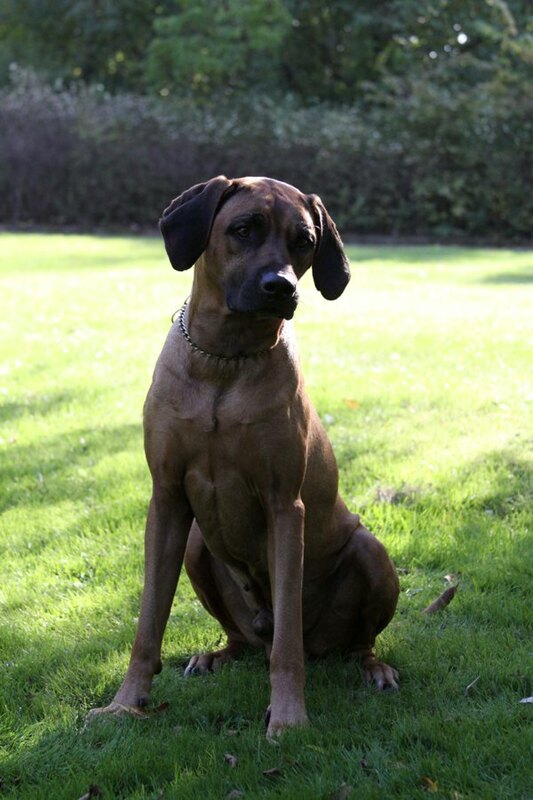 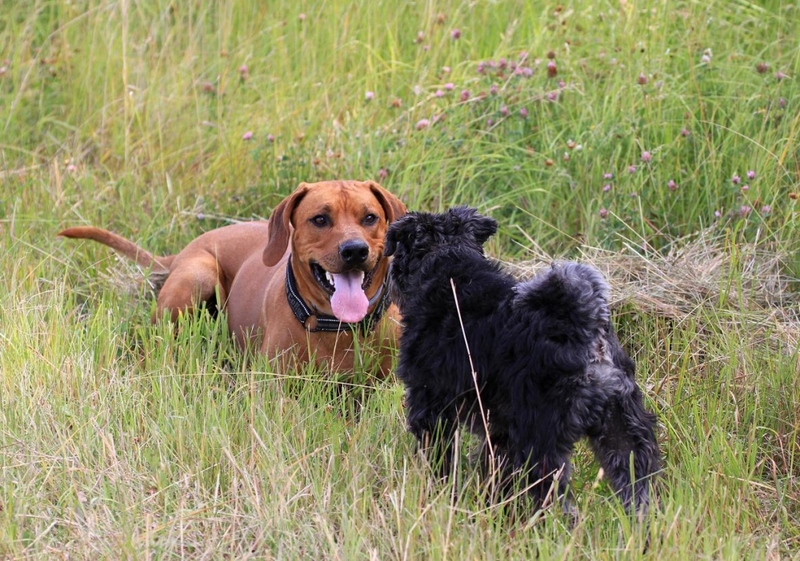 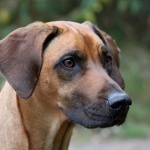 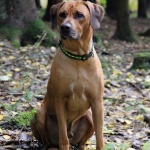 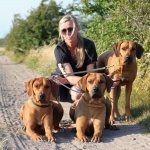 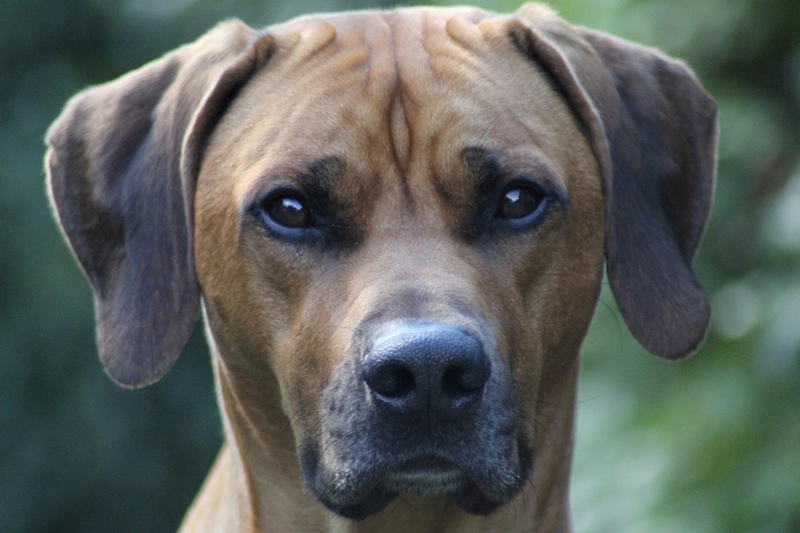 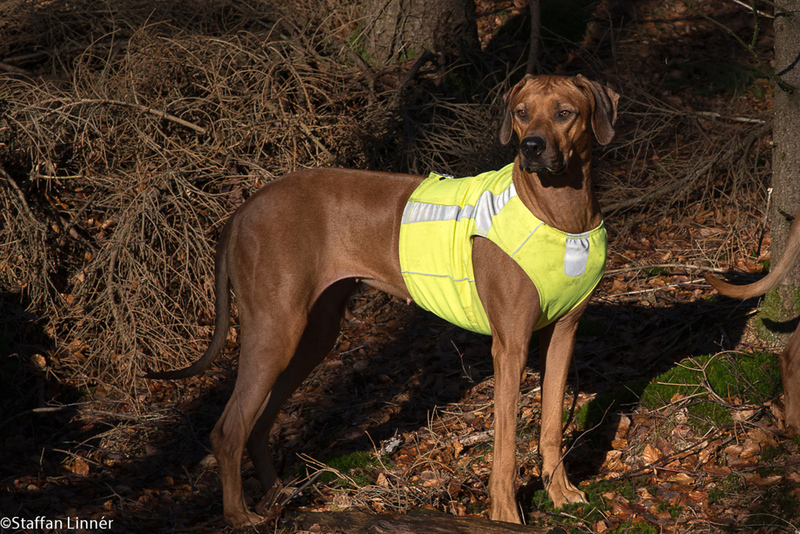 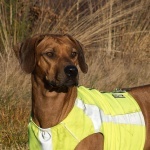 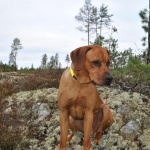 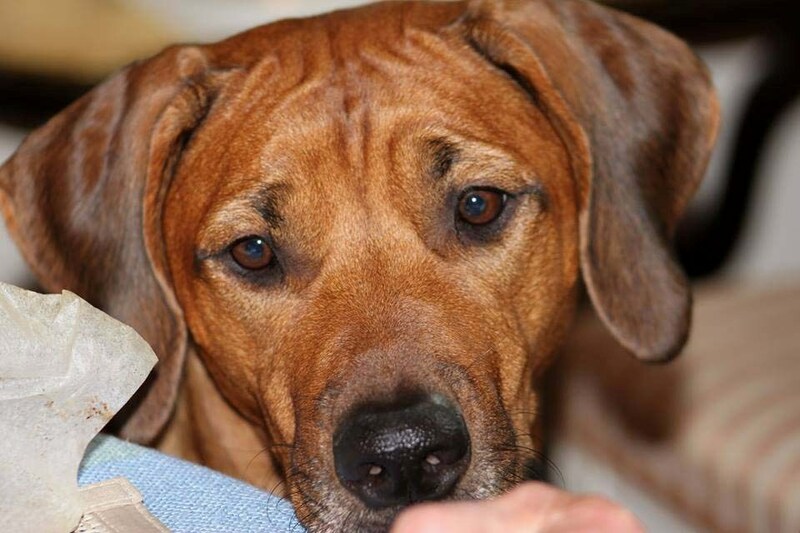 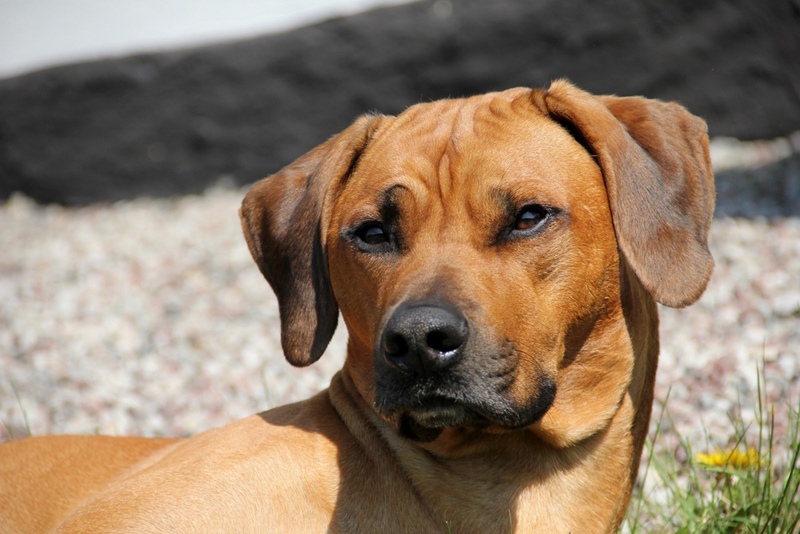 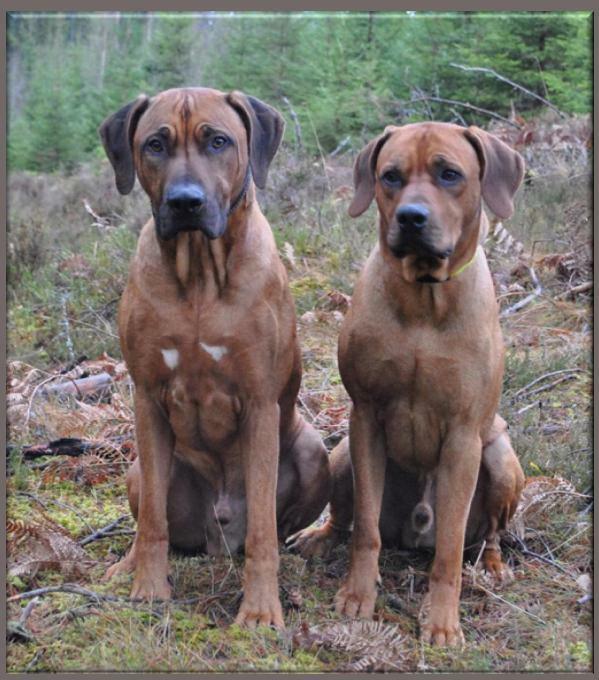 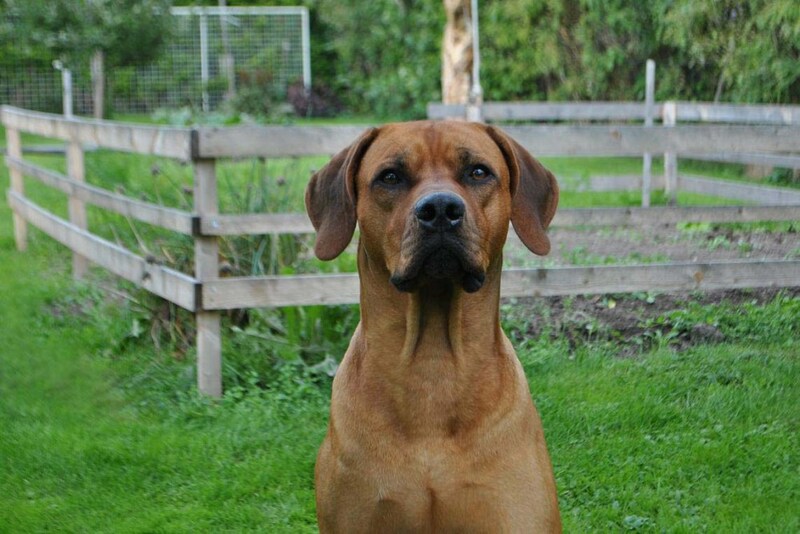 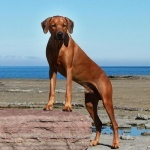 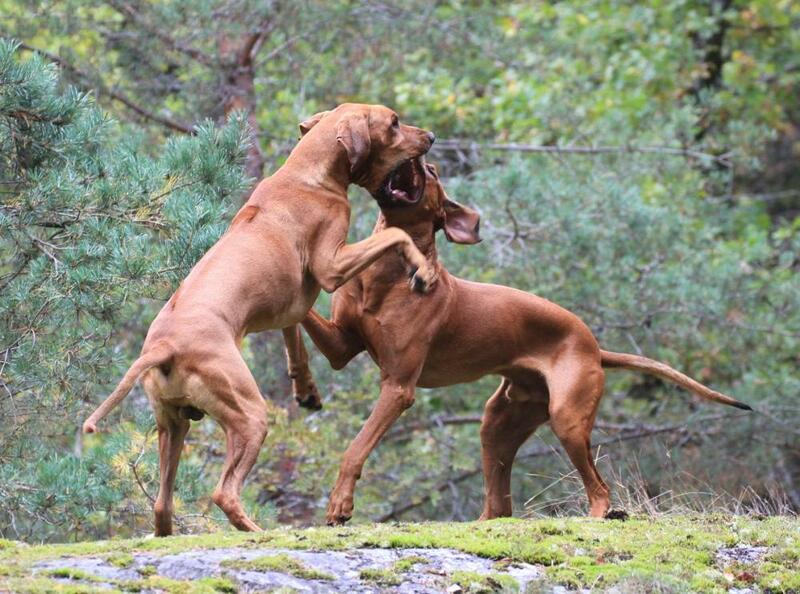 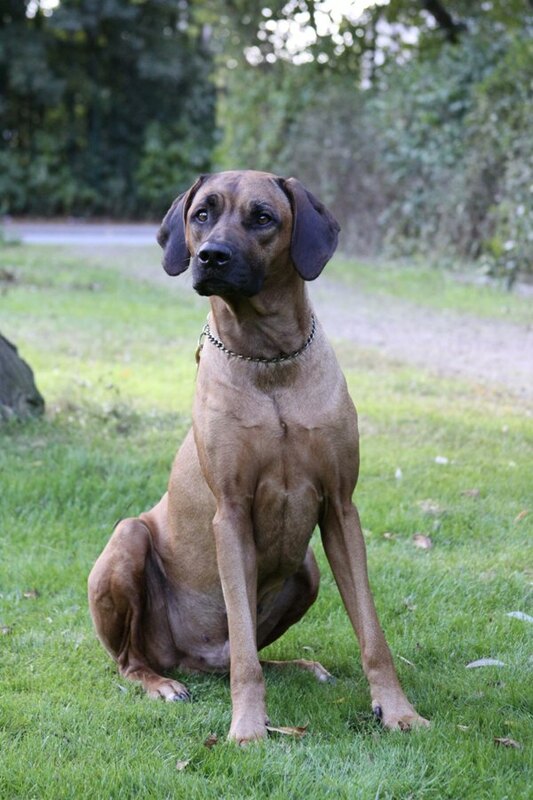 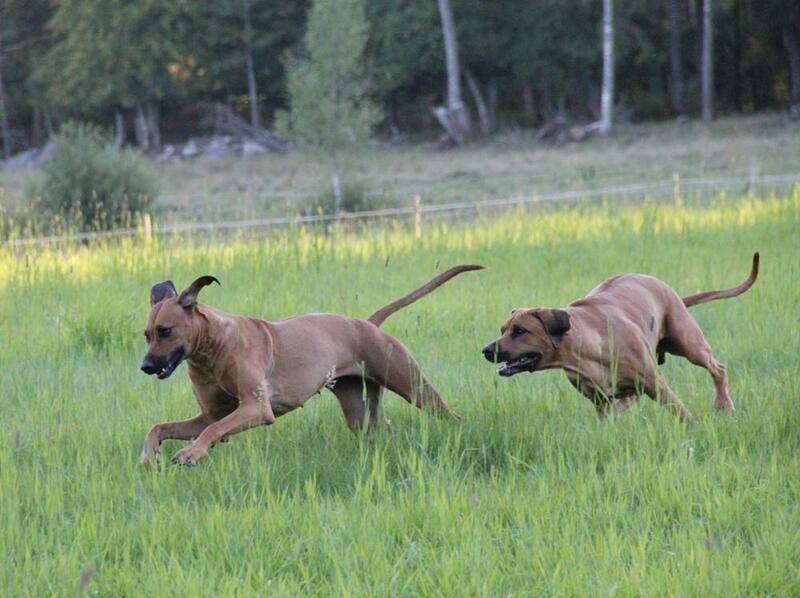 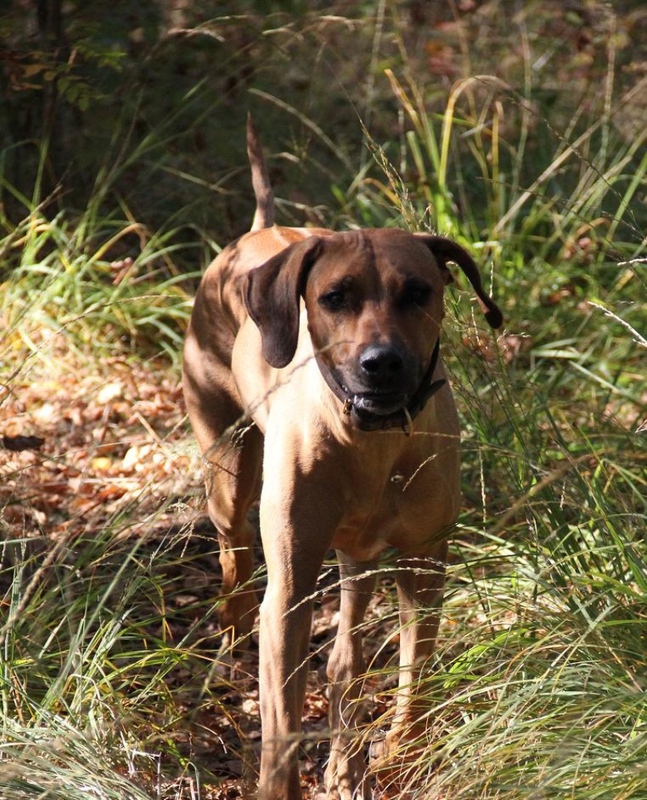 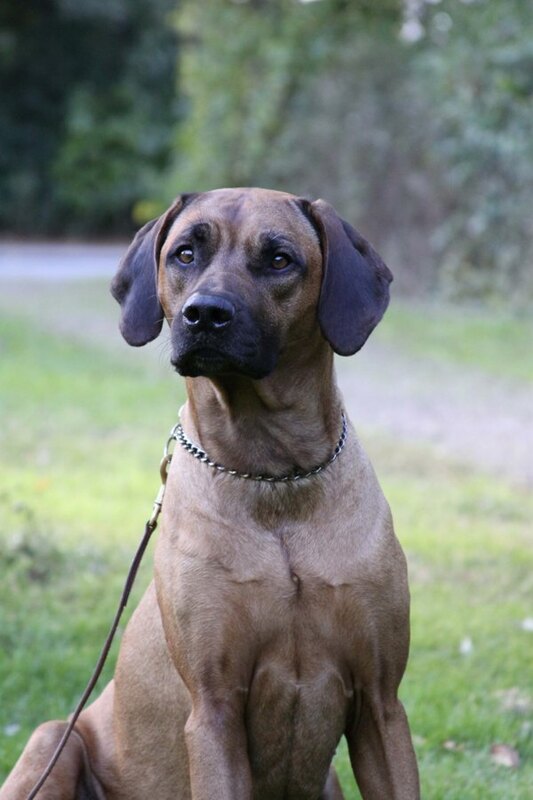 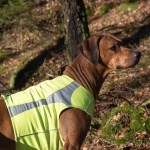 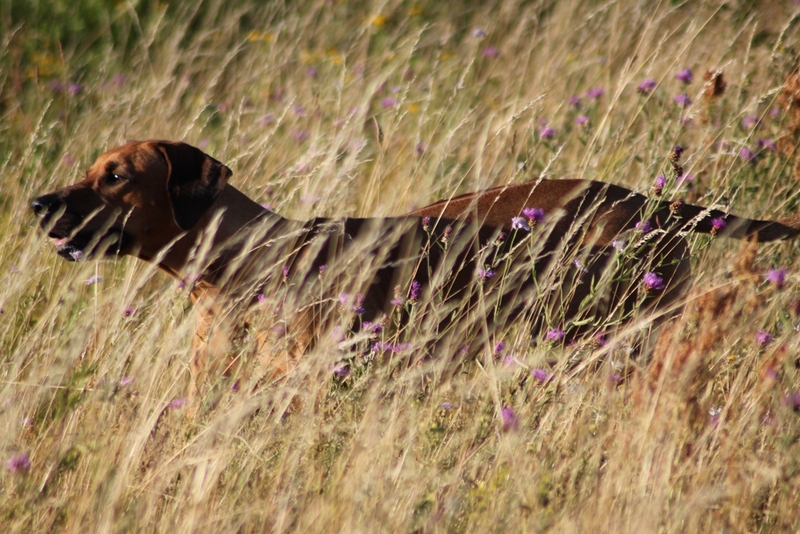 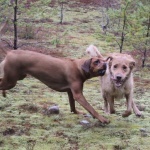 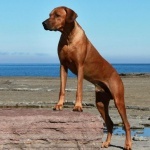 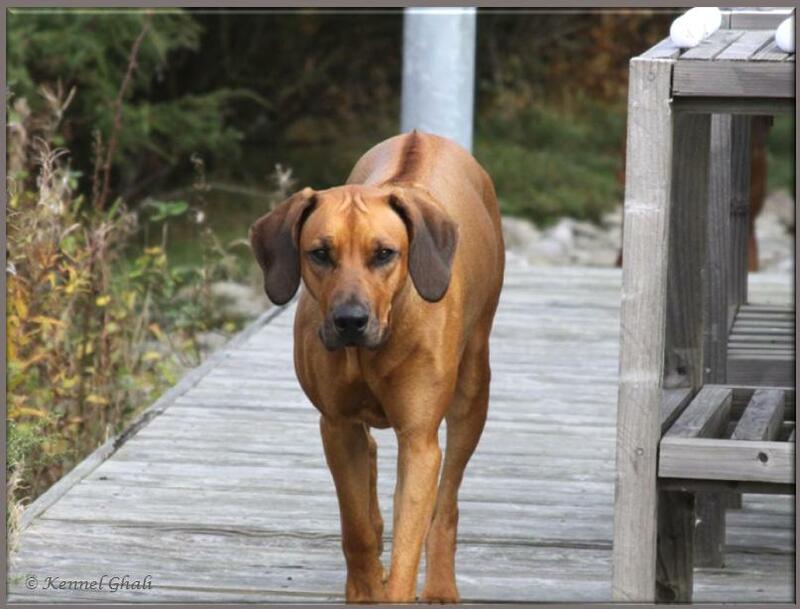 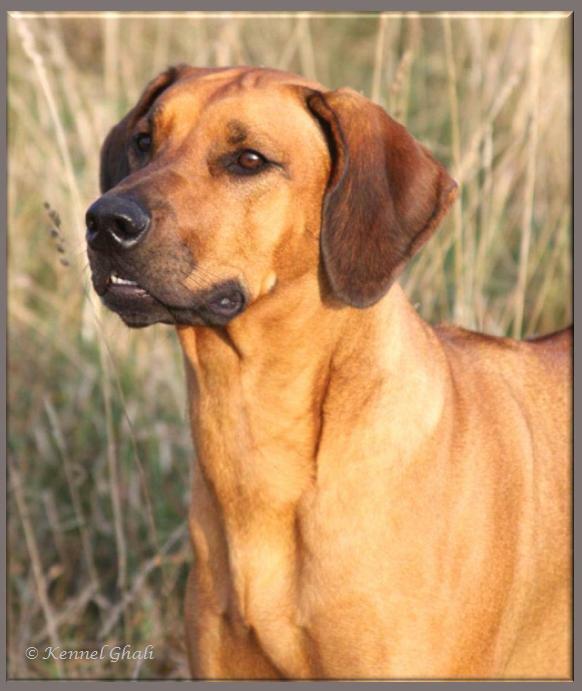 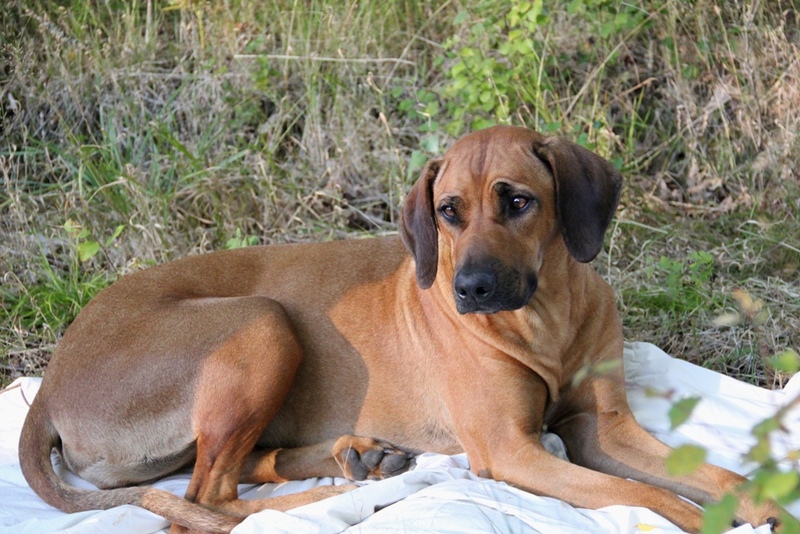 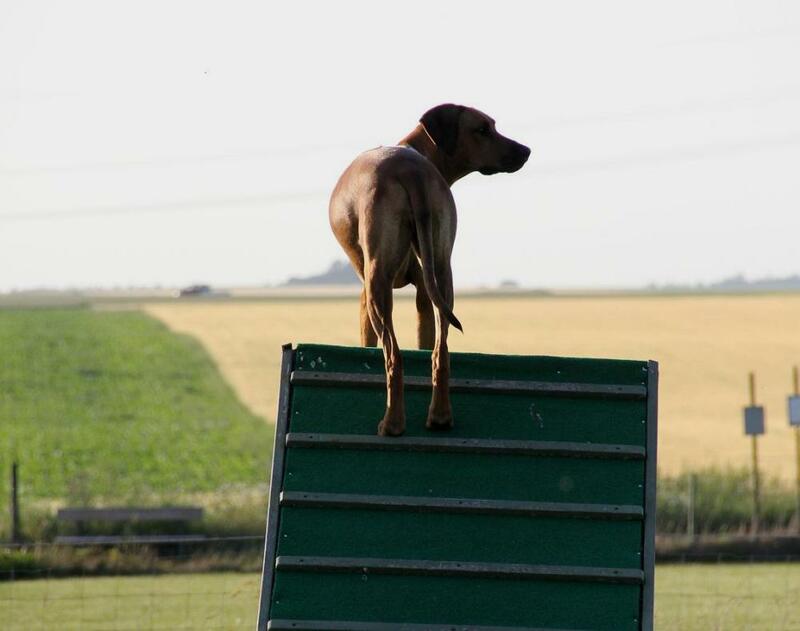 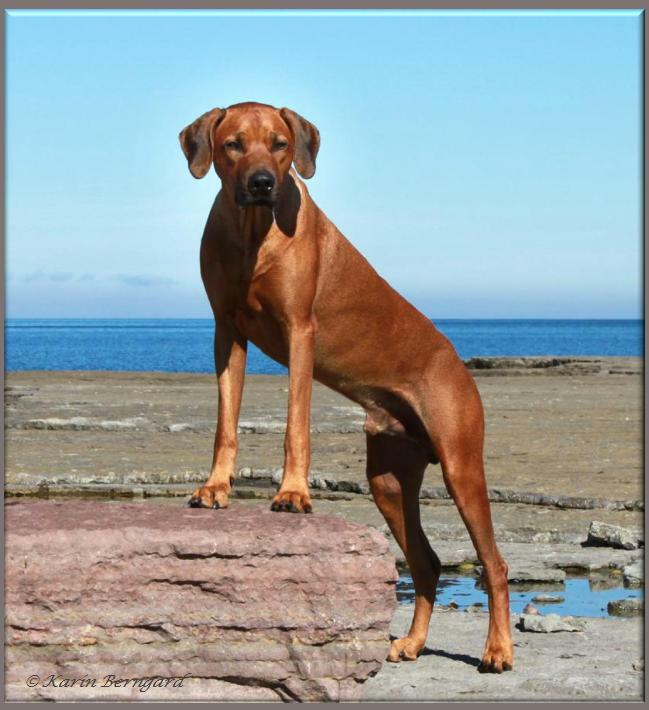 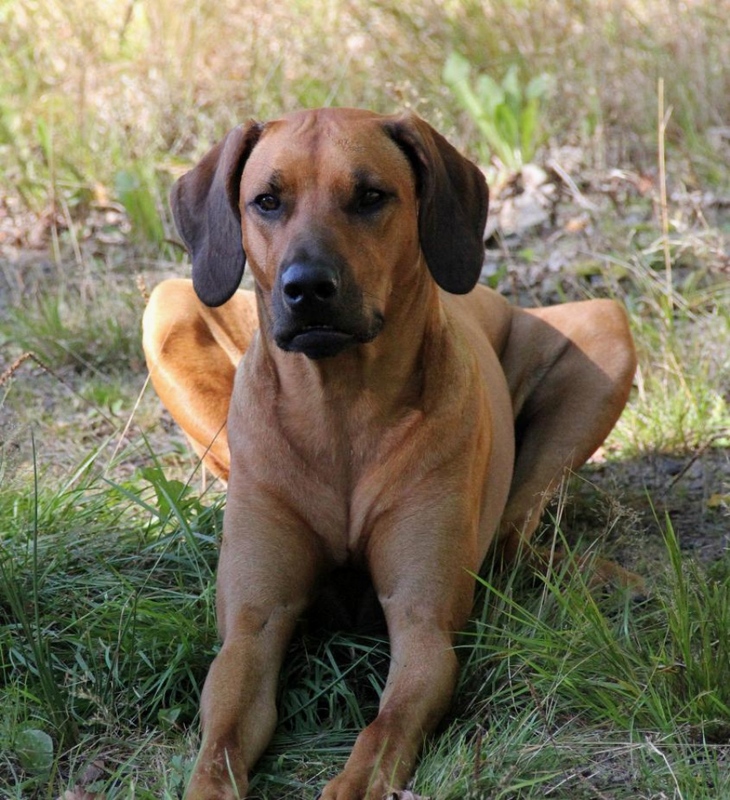 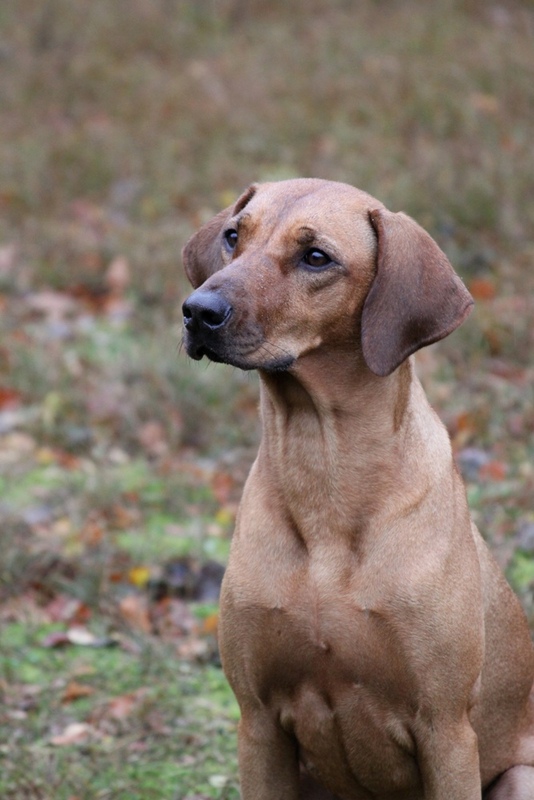 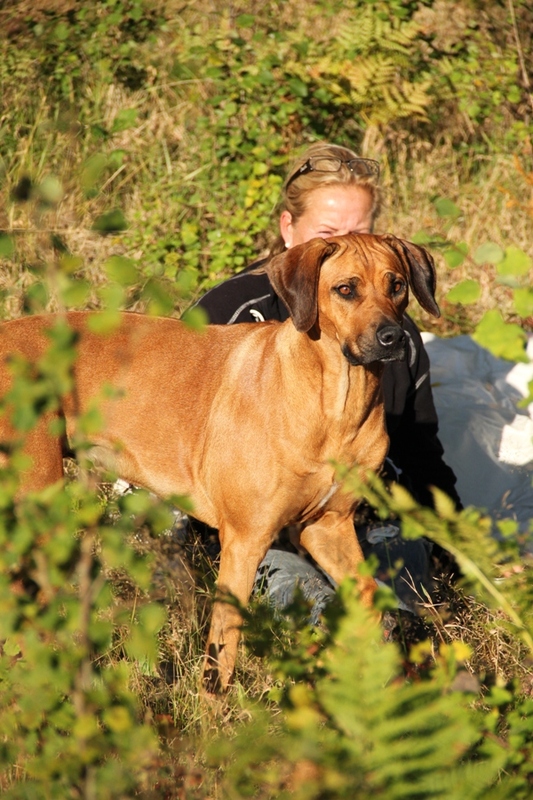 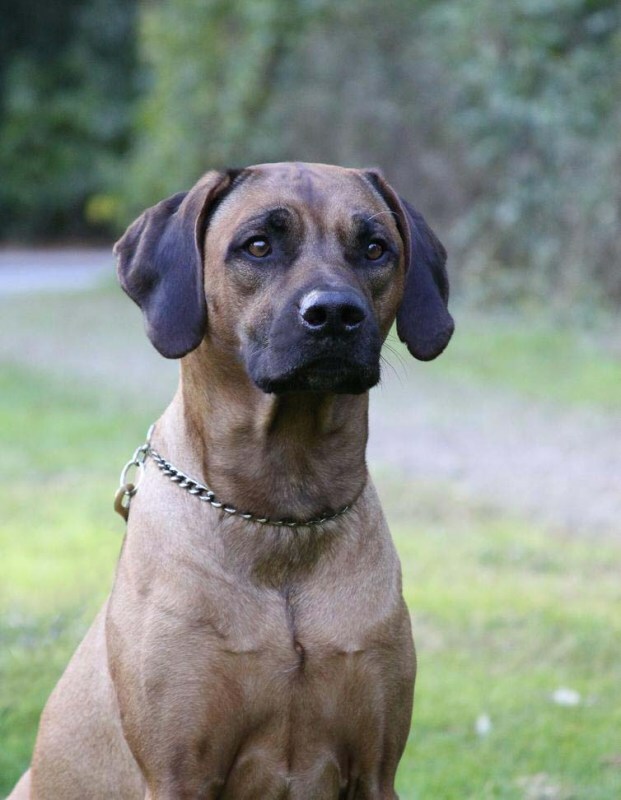 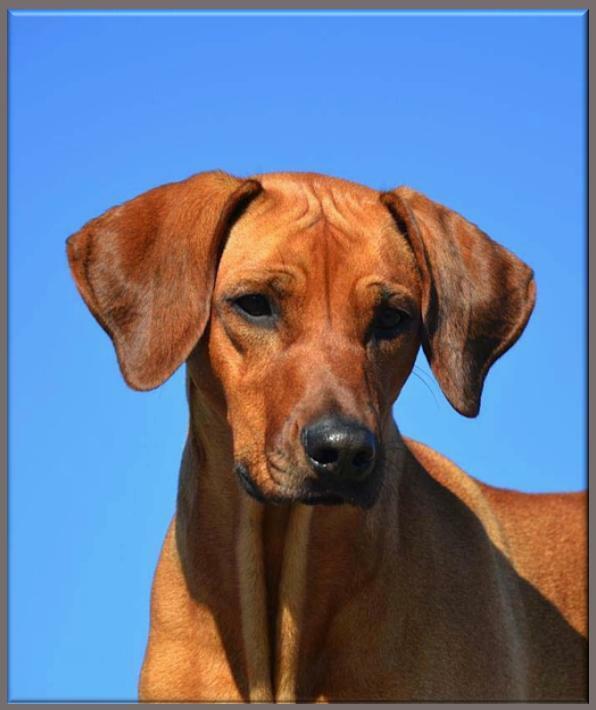 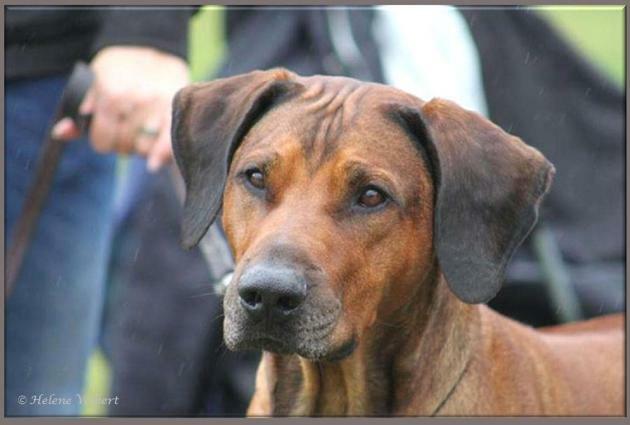 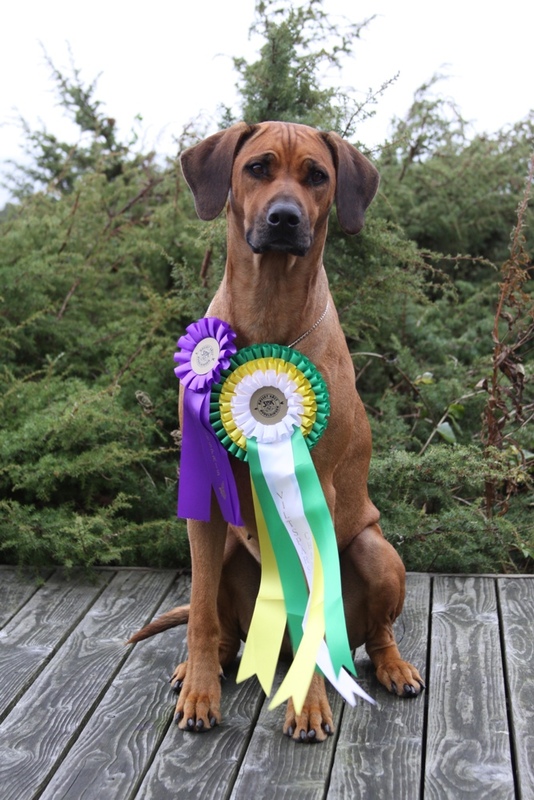 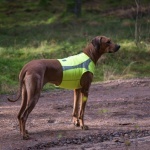 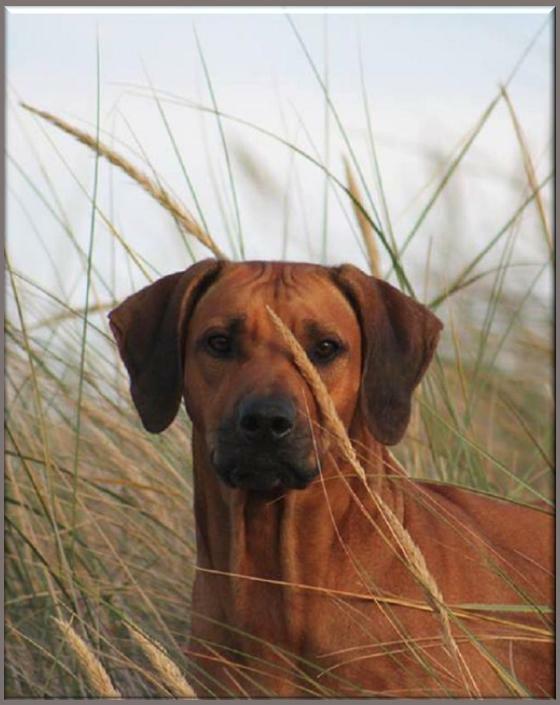 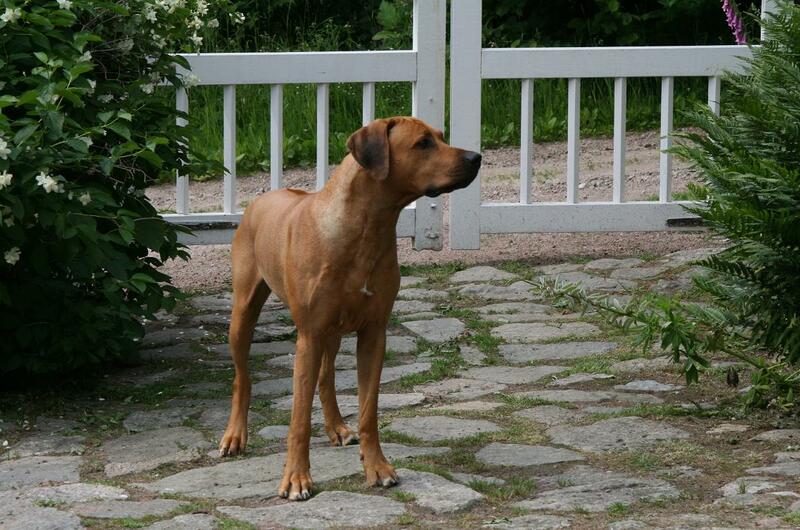 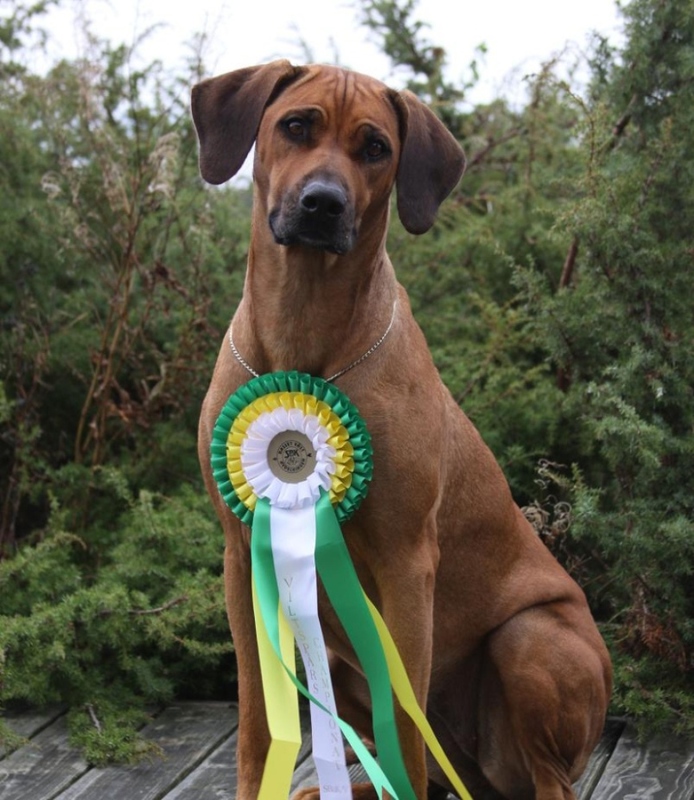 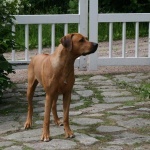 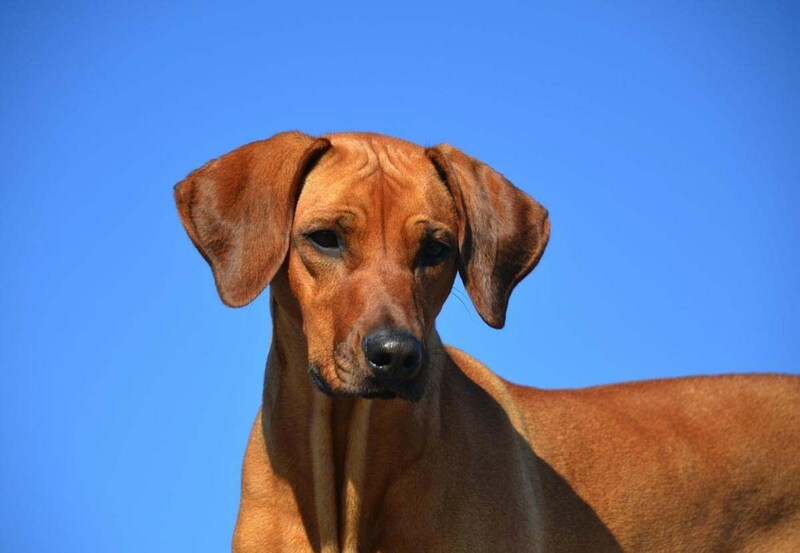 They are both great trackers:) and Chimme is the first and only Ridgeback in Sweden, that has received the title NORDIC BLOODTRACKING CHAMPION! 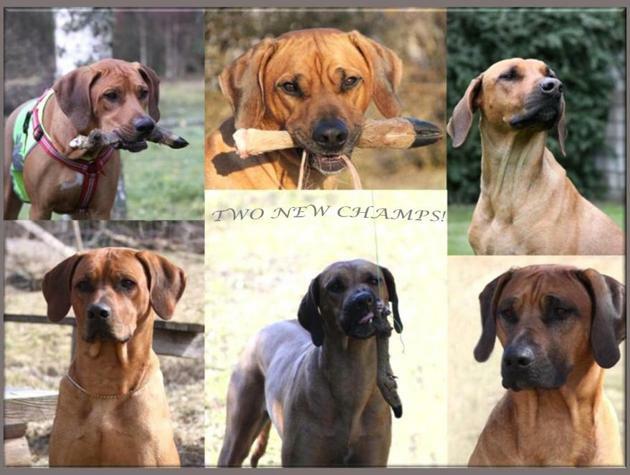 Nordvch Ghali Great Dillon"Chimani" & Sevch Ghali Great Dream"Salma"
Thank you so much Anne:) for sharing all these beautiful pictures with us. 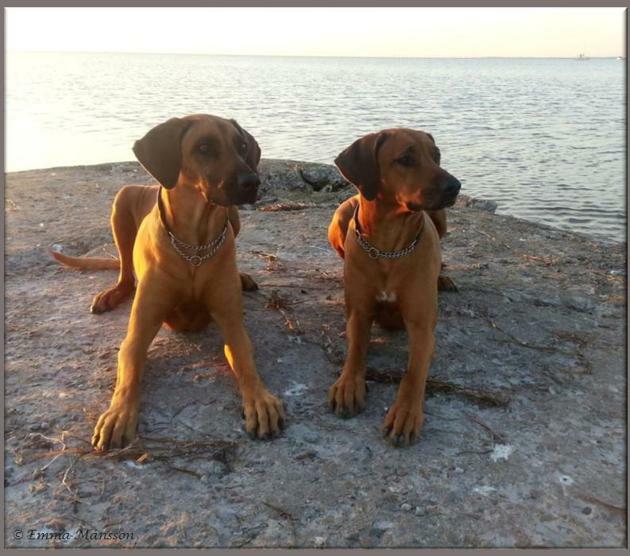 I have updated Salma and Yeba´s gallerypages with some new nice pictures of this two lovely sisters:) both Swedish Bloodtracking Champions! 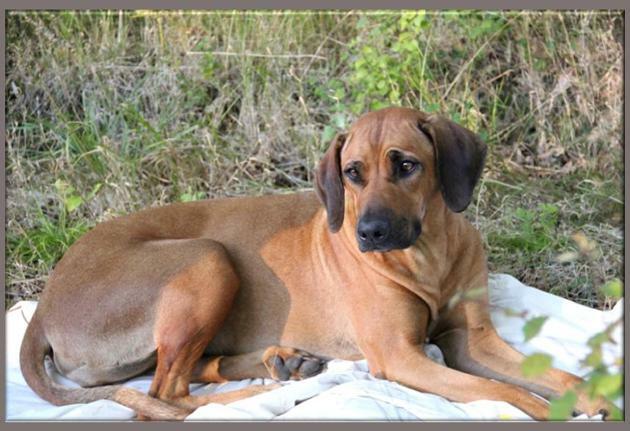 Sevch Ghali Great Dream"Salma" & Sevch Ghali Great Dawn"Yeba"
First out is Salma, to see more pictures of her, click on the picture below! 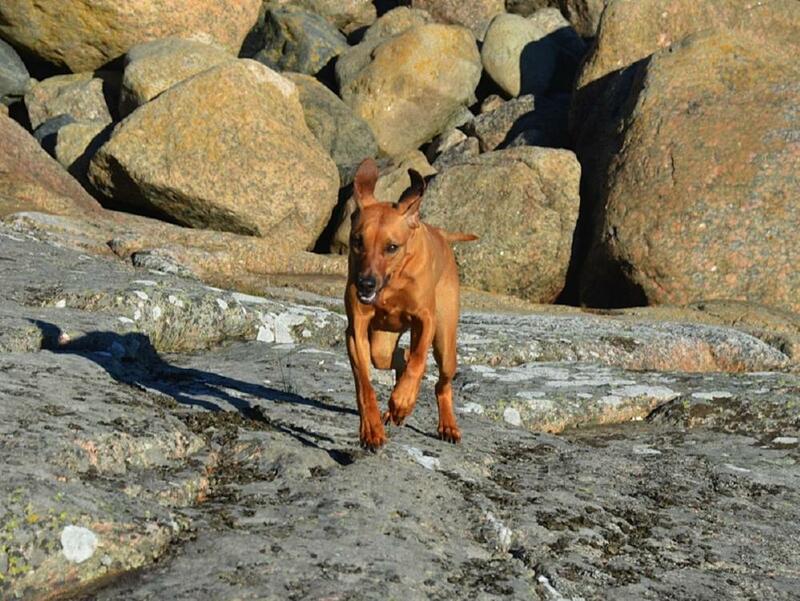 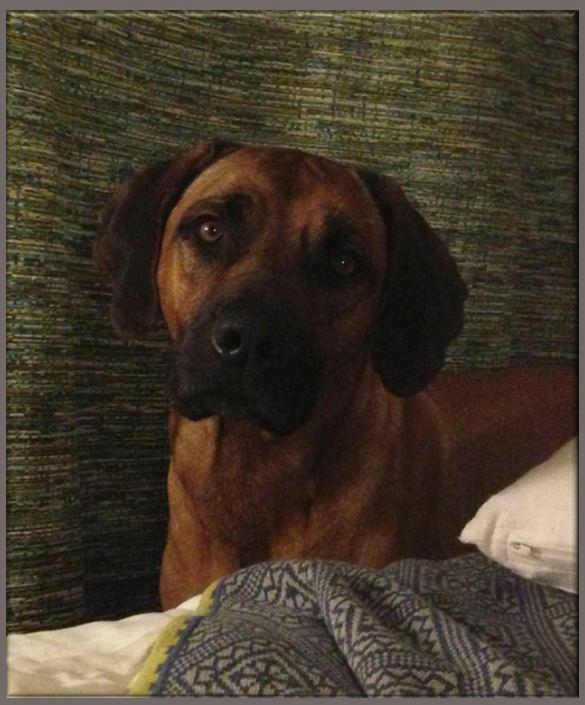 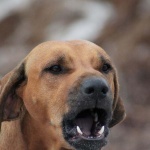 To see more pictures of Yeba, click on the picture below! 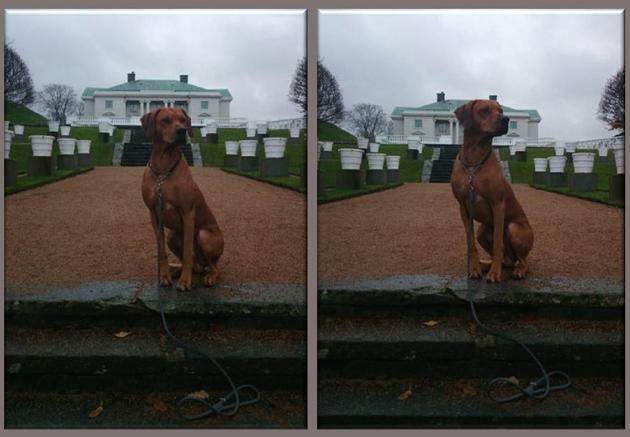 Pappa till Awena´s första kull vår C-kull, har somnat in. 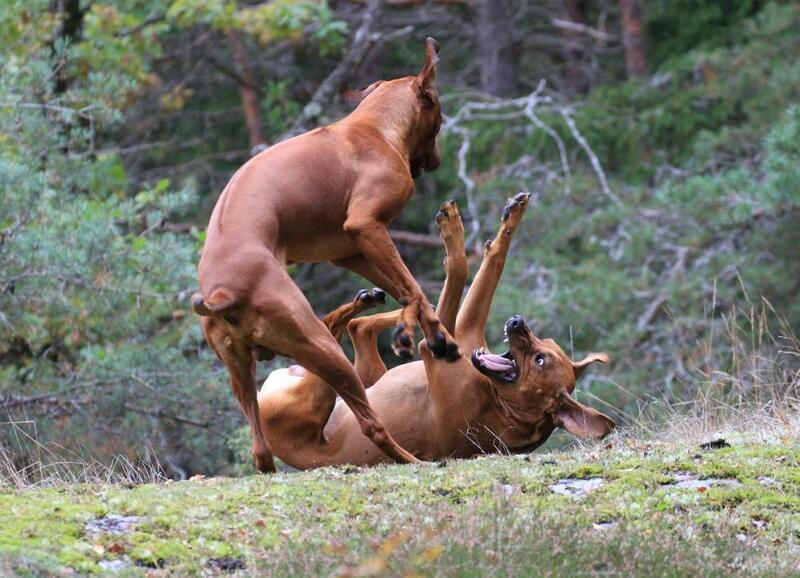 En ståtlig och vacker herre, som lämnar ett stort tomrum efter sig. 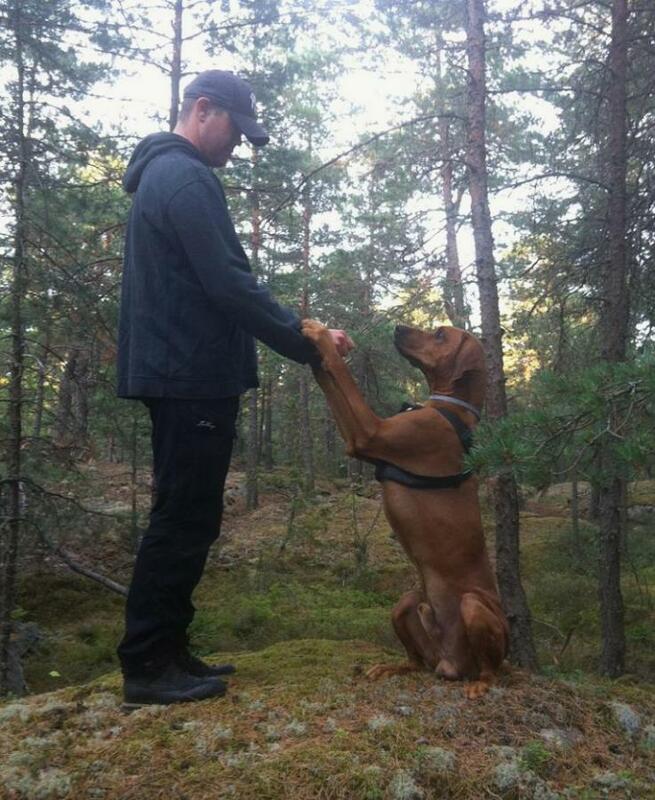 Lex levde ett långt och lyckligt hundliv. 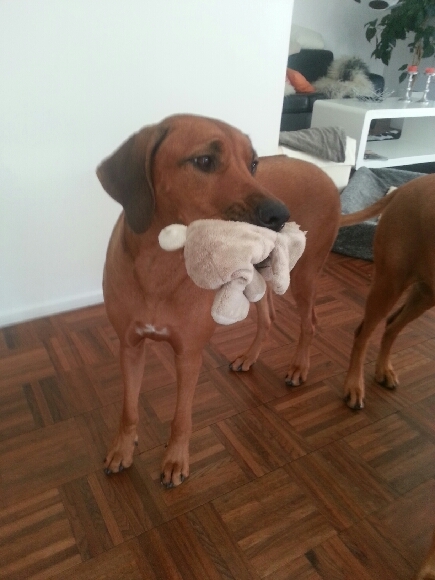 Me, Ulf and the girls are spending our days in Torekov:) at Lotta and Yebas place. 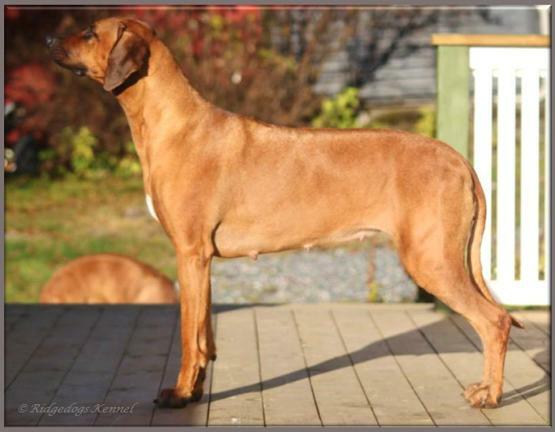 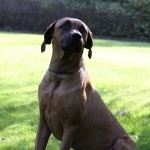 Yeba is from our D-litter, (Asla x Minos) Sevch Ghali Great Dawn. 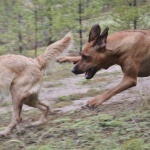 I think that Tolouse will be very happy to meet her sister for a playdate. 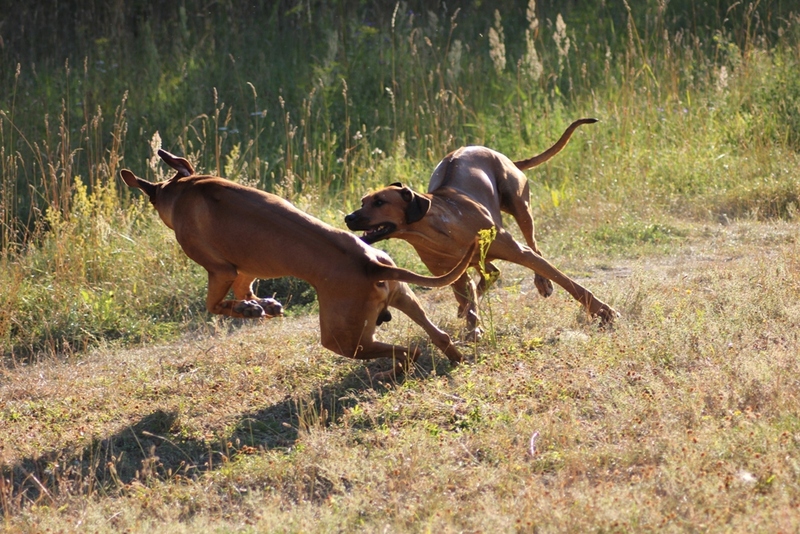 I have finally updated october gallery, with a lot of pictures from Tolouse and Texas playdate! 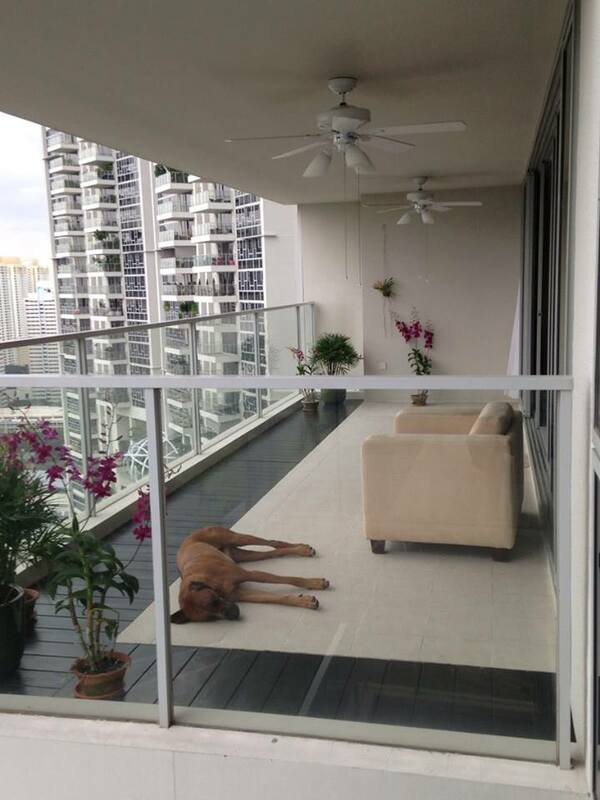 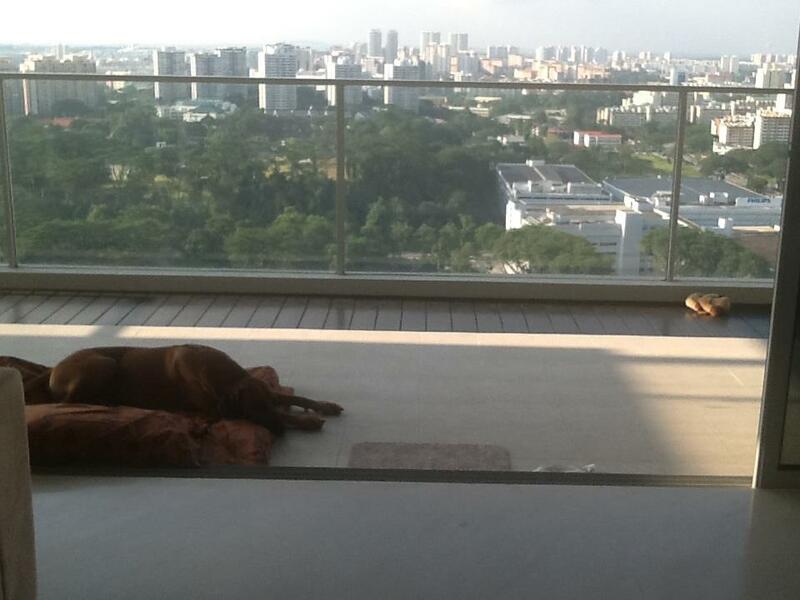 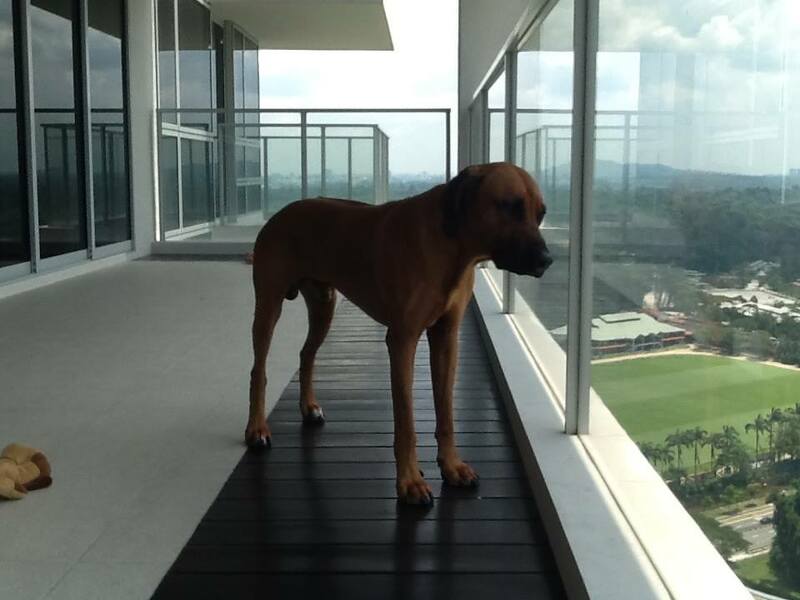 When others (mortals) are trying to find a place under a fan and have already showered 13 times today, goes the King of Singapore and settles on the only balcony with sun .... 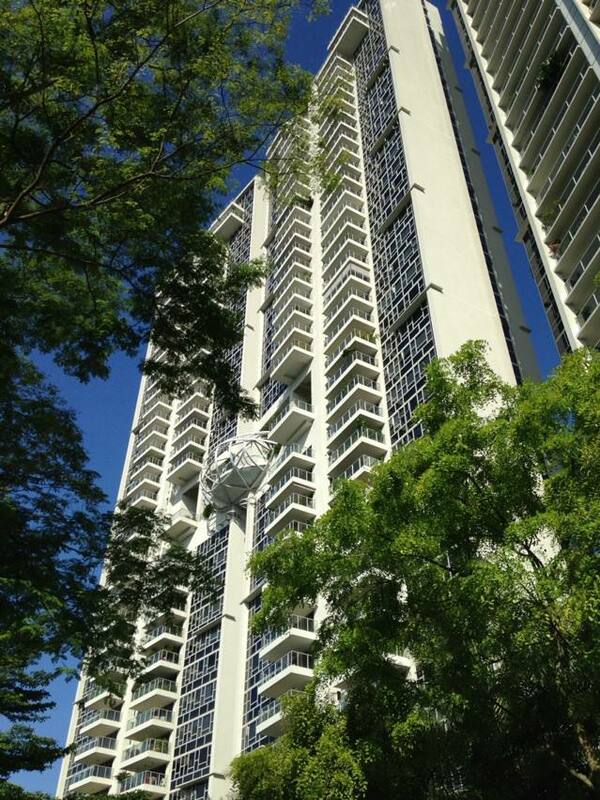 This is no spring sun, it´s tropical heat and clear blue sky ; feels like150 degrees .... 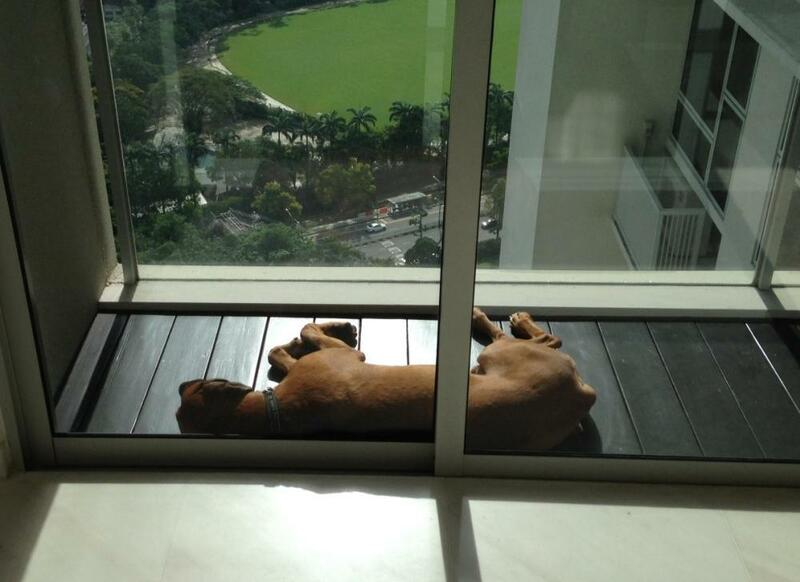 Need I say that he is the one who has adapted best to the climate. 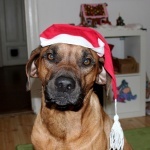 Thank you all for keeping me informed:)! 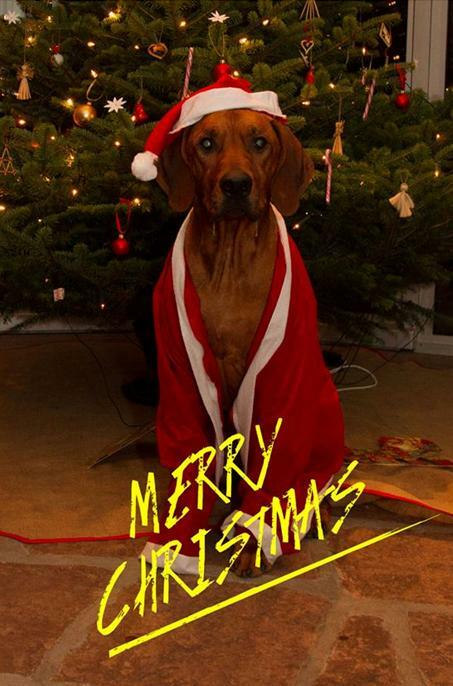 Keep on sending me pictures. 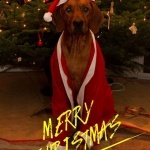 I like it:)! Eldar hade en bra dag i älgskogen! 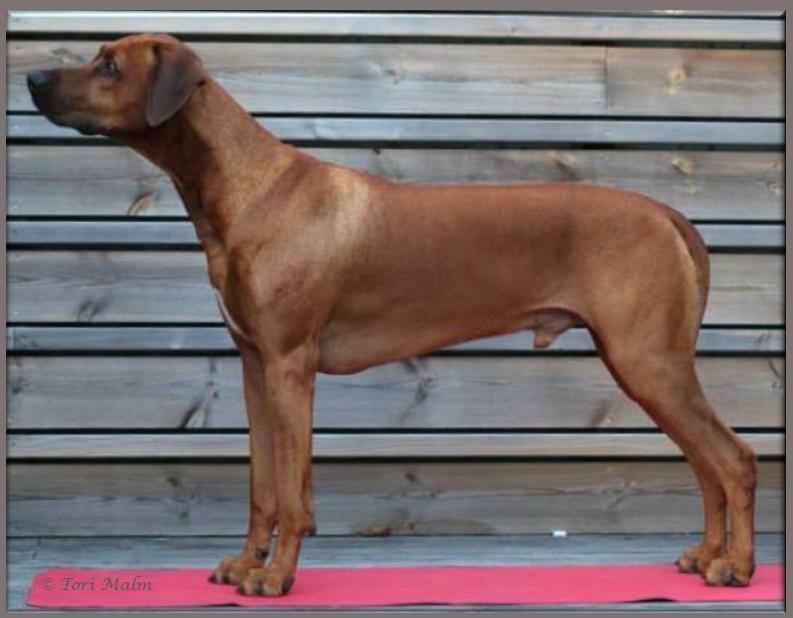 I helgen var Awena´s son Sevch Ghali Excellent Nassak” Eldar” med på sitt första riktiga eftersök. 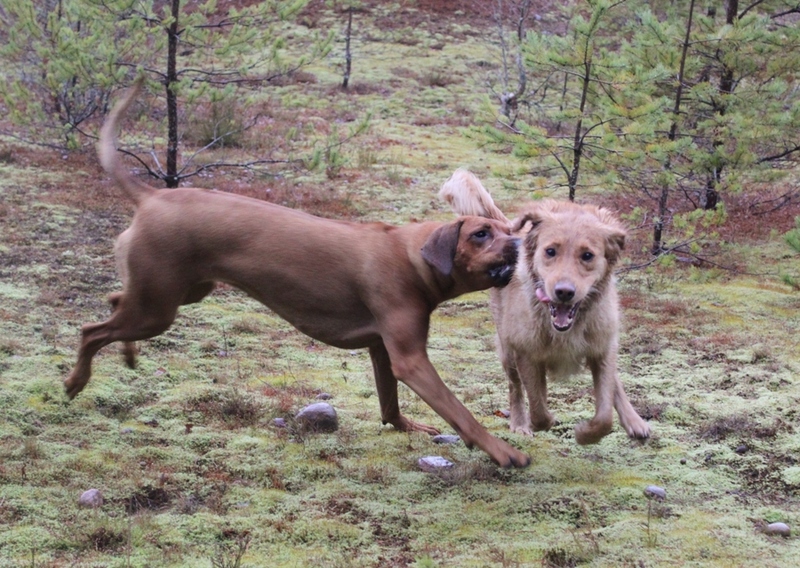 Han spårade en skadeskjuten ungtjur ca 400 m.
Lugnt och metodiskt spårande, och sen en undersökning av hela älgen under tiden som jägarna tog hand om den. 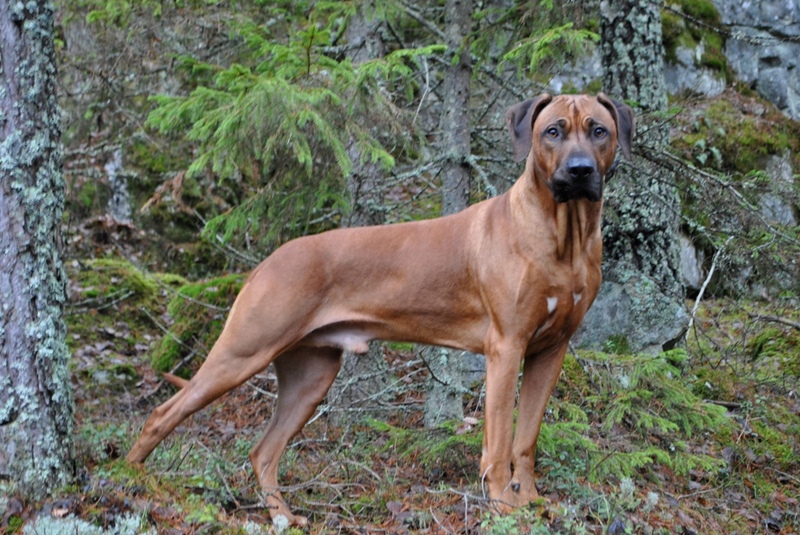 Och Safir sonen ”Anton” Ghali For I`M Floyd, var ute i helgen med matte och husse i skogen och spårade. 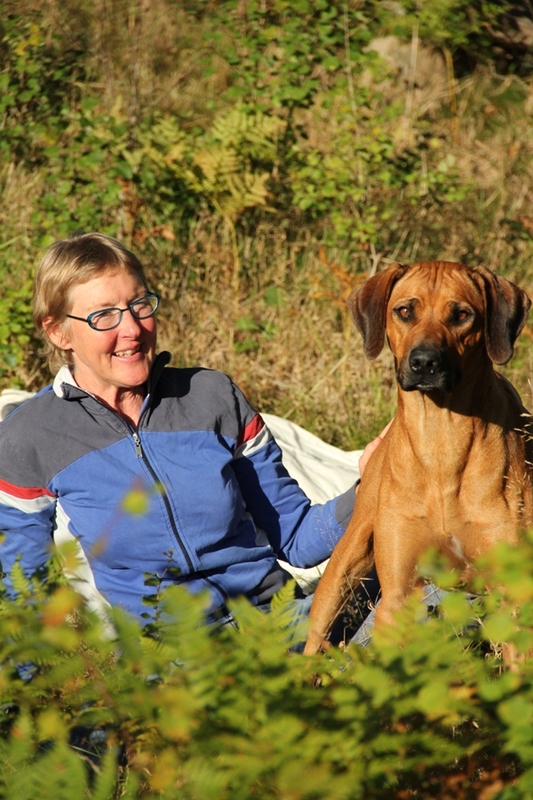 Själv kommer vi snart att ha lite höstlov i paradiset:)! 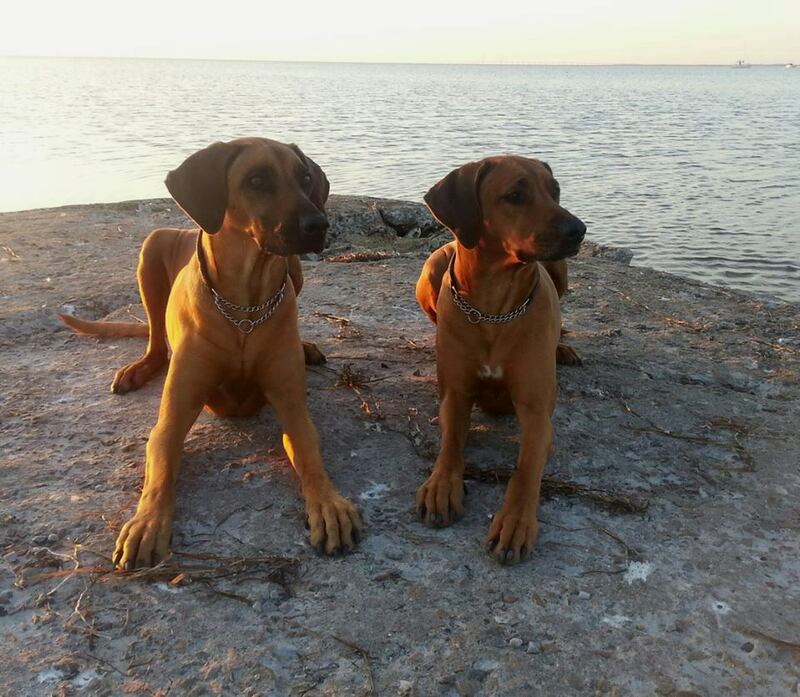 Jag Ulf och tjejerna kommer åka till Torekov och passa Asla dottern Yeba:)! 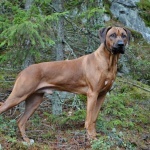 Sevch Ghali Great Dawn, som är från vår D-kull. 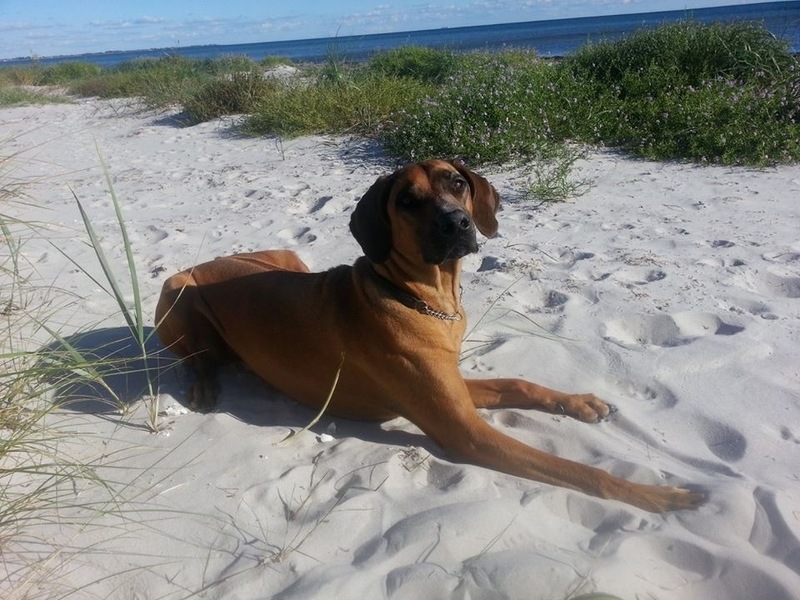 Medans matte Lotta njuter av lite ledighet och semester på varmare breddgrader. "Enza” Ghali For I`M Fancy med familj:)! 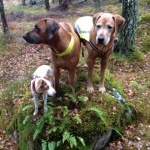 Bilden nedan är från Älgskogen! 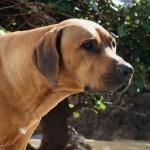 I have updated "Tolouse" Ghali For I`M Farika gallery page! 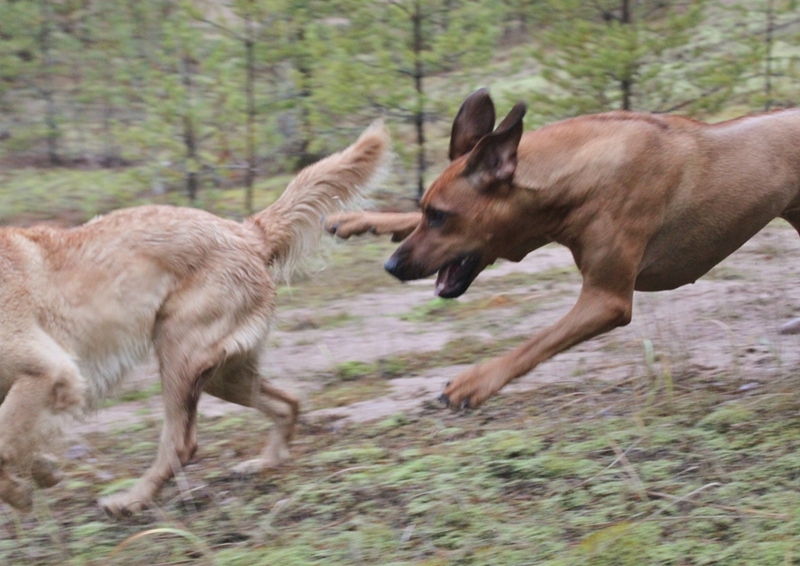 She joined our pack 3 months ago. 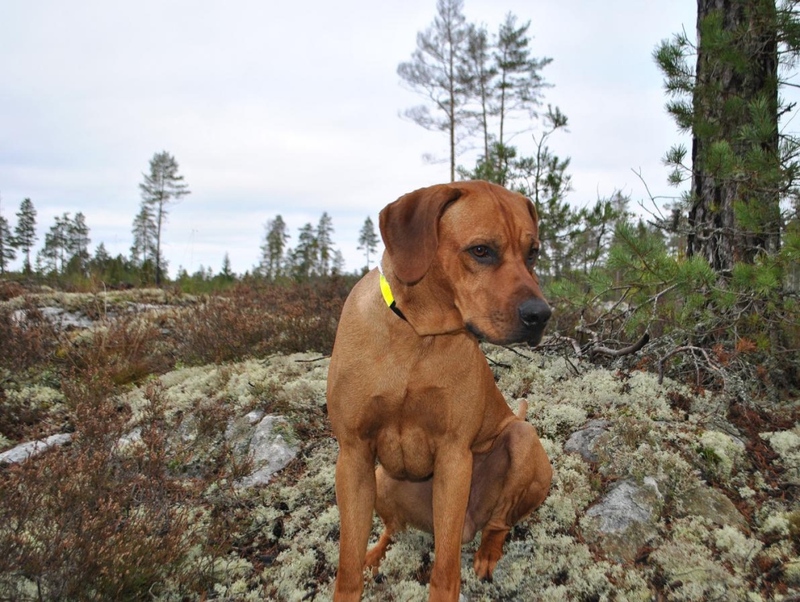 She is a girl with a lot of speed and energy, loves to hunt and track. 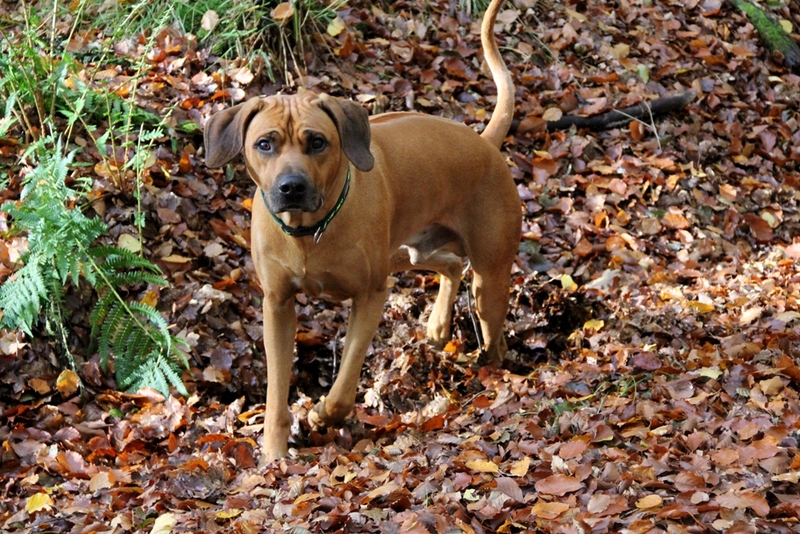 She has a heart of gold and is a confident little lady. 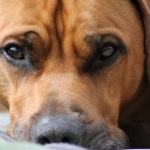 She loooooves her mother, and like sleeping with her either in the bed or couch. 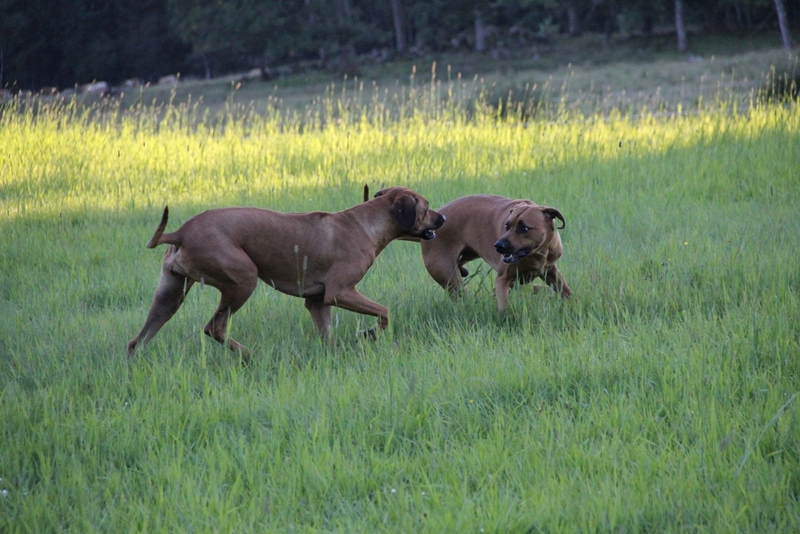 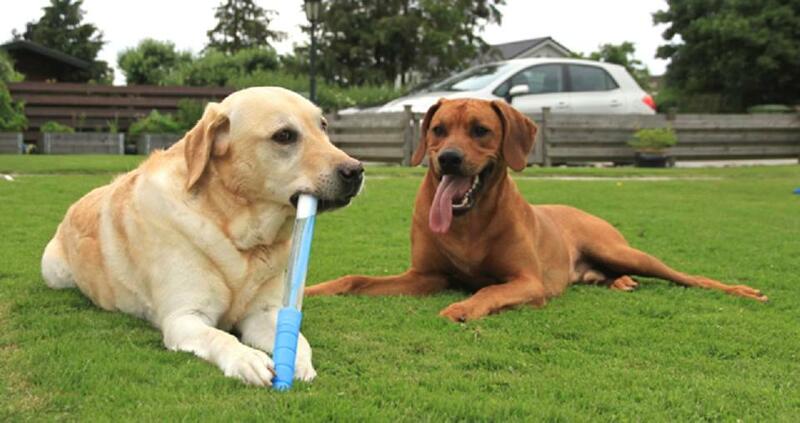 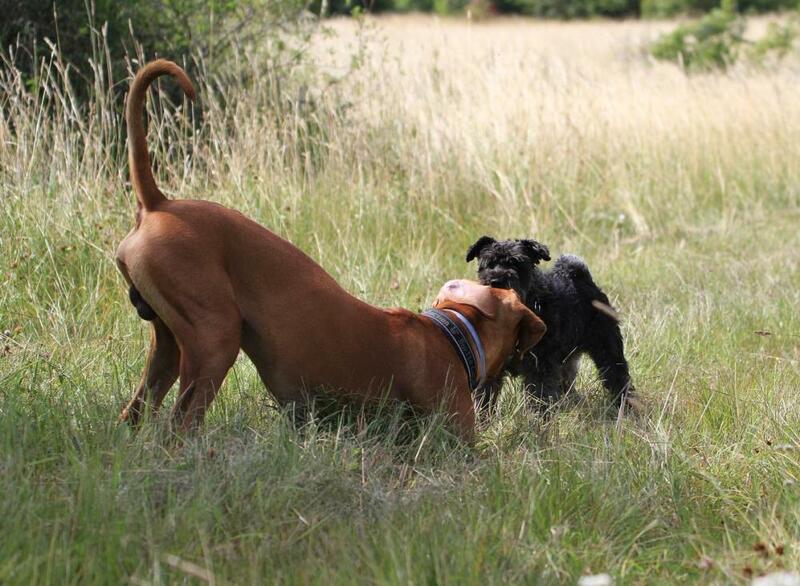 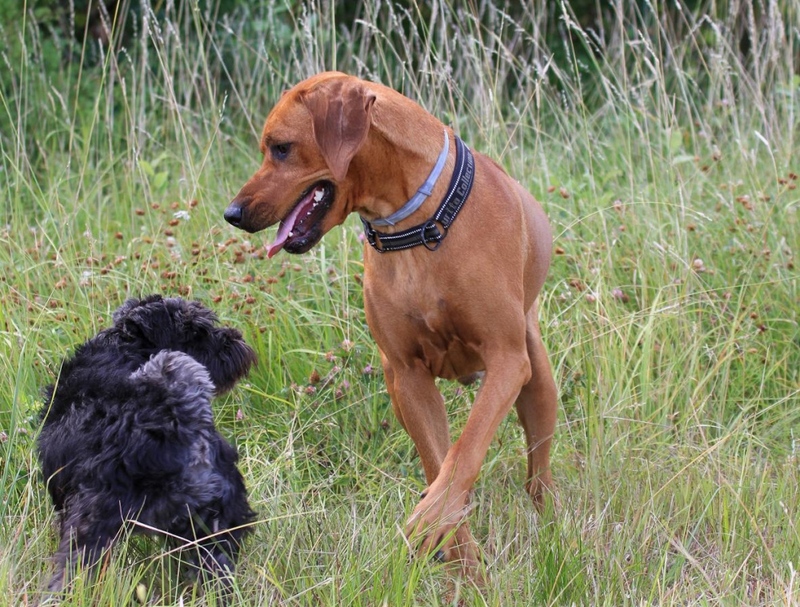 A couple of days ago, she met her brother "Texas" Ghali For I`M Fennan for a playdate:)! 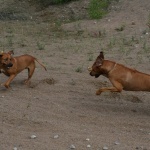 Pictures from their playdate, coming up as soon as I had time to go through all. 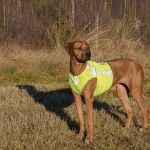 I have updated Keniya´s gallery page! 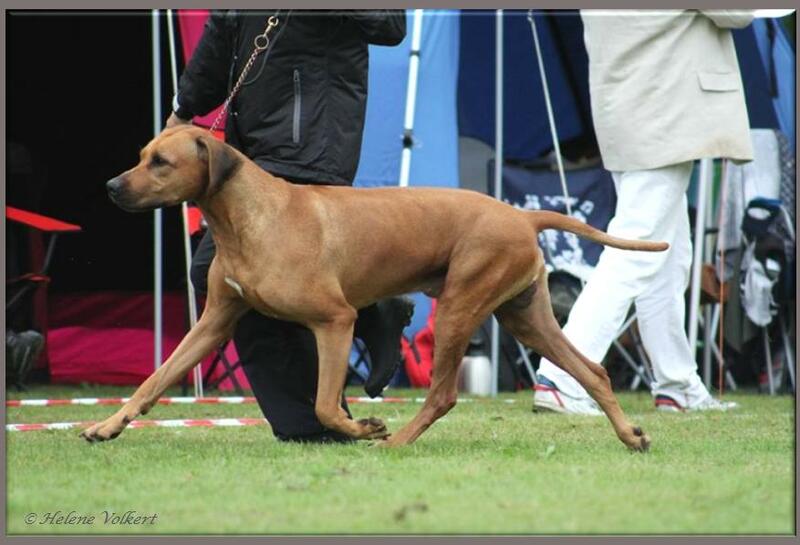 from the F-litter (Safir x Lloyd). 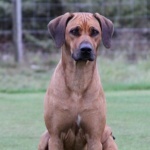 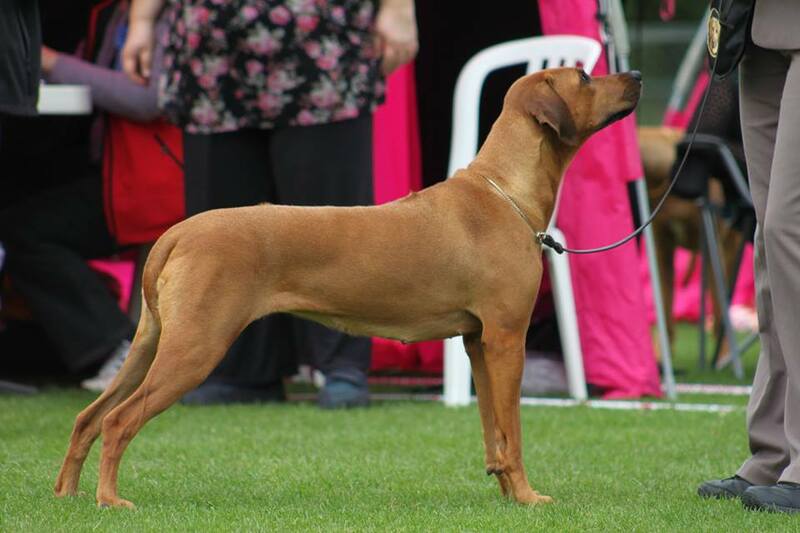 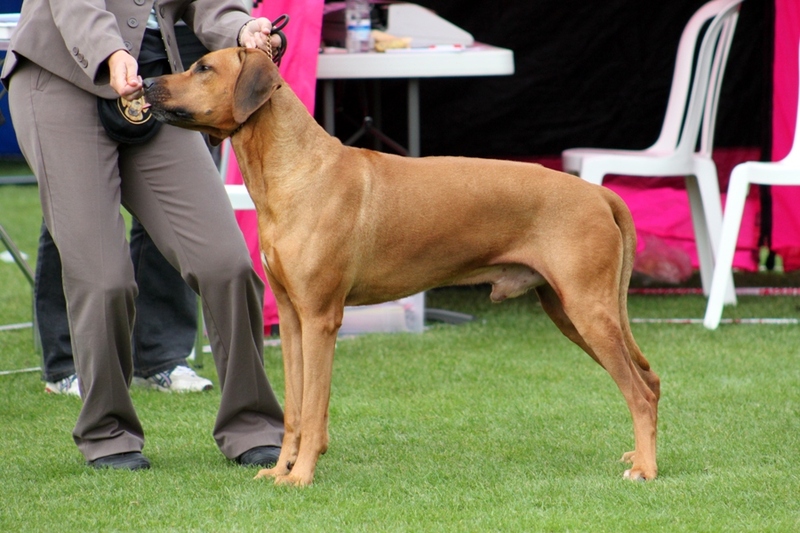 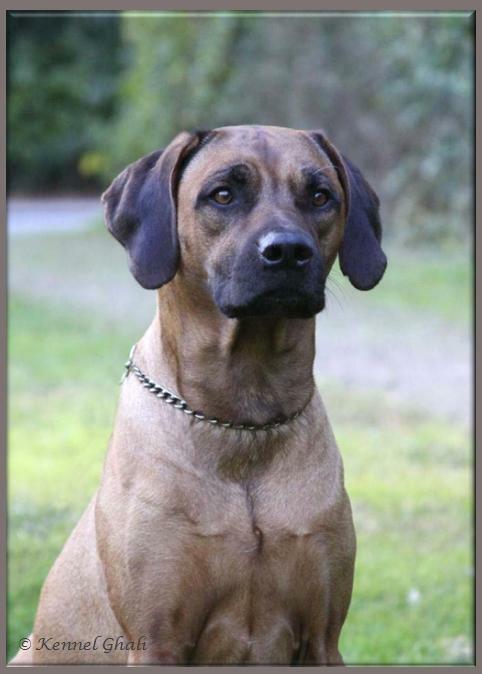 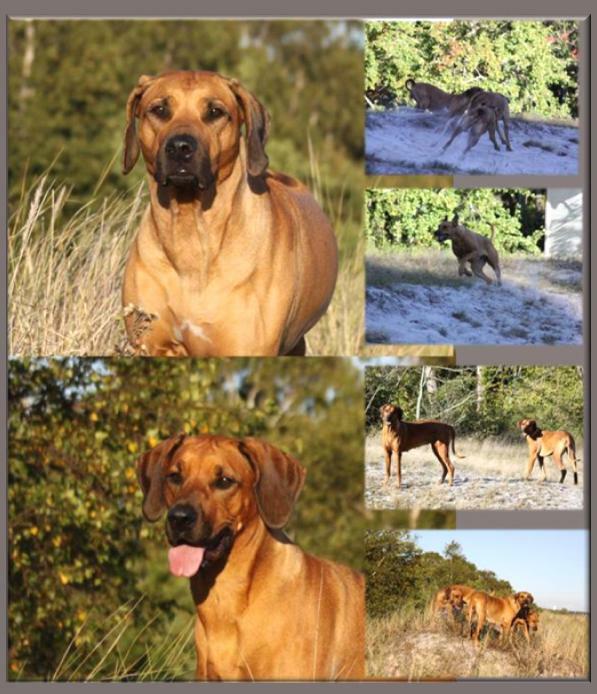 (Ghali For I`M Fancy) from the F-litter (Safir x Lloyd). 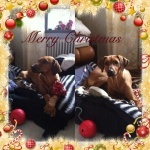 Thank you Isabelle for the lovely photos:)! 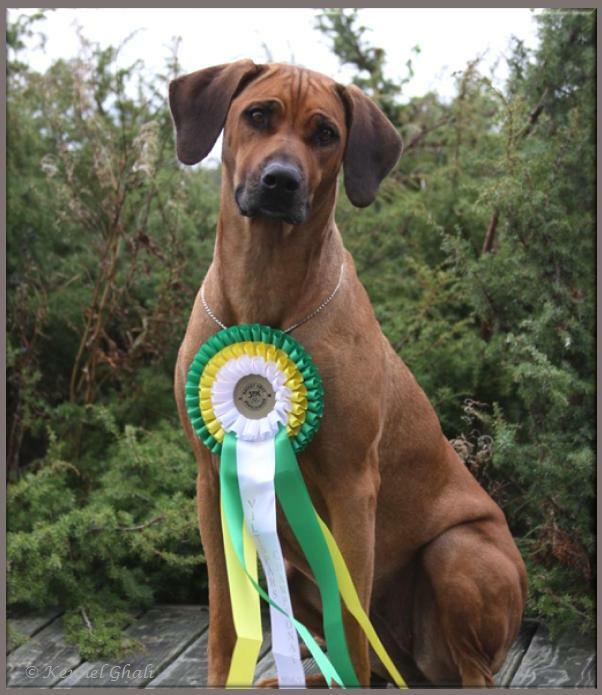 Brisamar Meville”Memphis” is new SWEDISH SHOW CHAMPION! 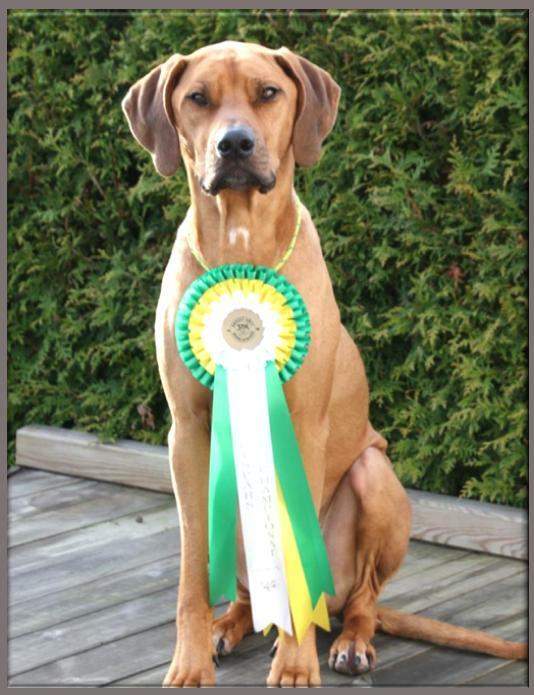 Memphis winner in Openclass, 3rd BEST MALE with his third and last CAC and became Swedish Champion!!! 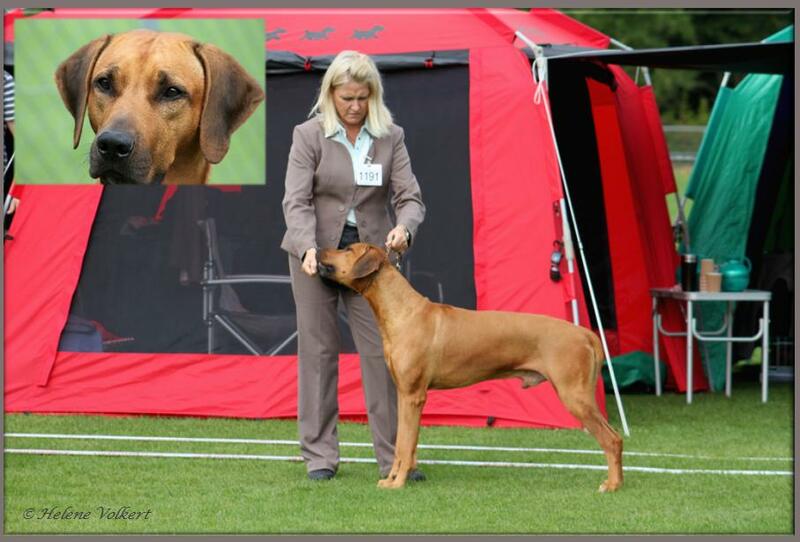 Handsome halfbrother Waytogo Nimbus who also competed in openclass finished as second with CQ in his class, just after his halfbrother Memphis, but later not placed in Best Male. 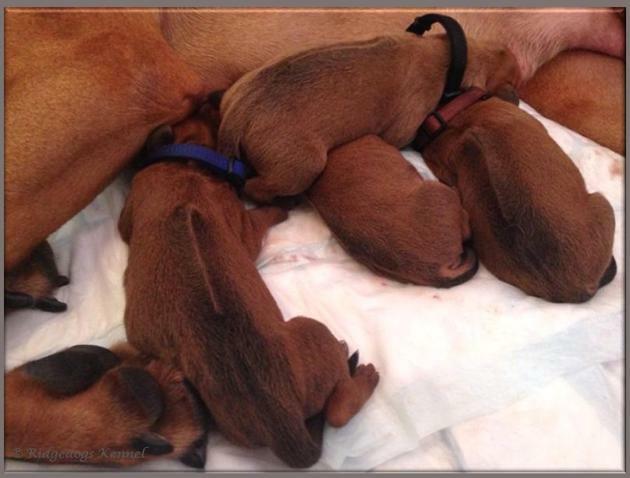 Huge congratulations to owner and breeder! 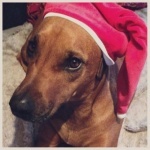 I have a lot of pages to update! Great tracking & show results, new titles and a lot of pictures:)! 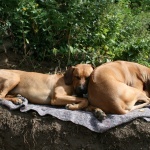 I will also do a lot of changes on the website. 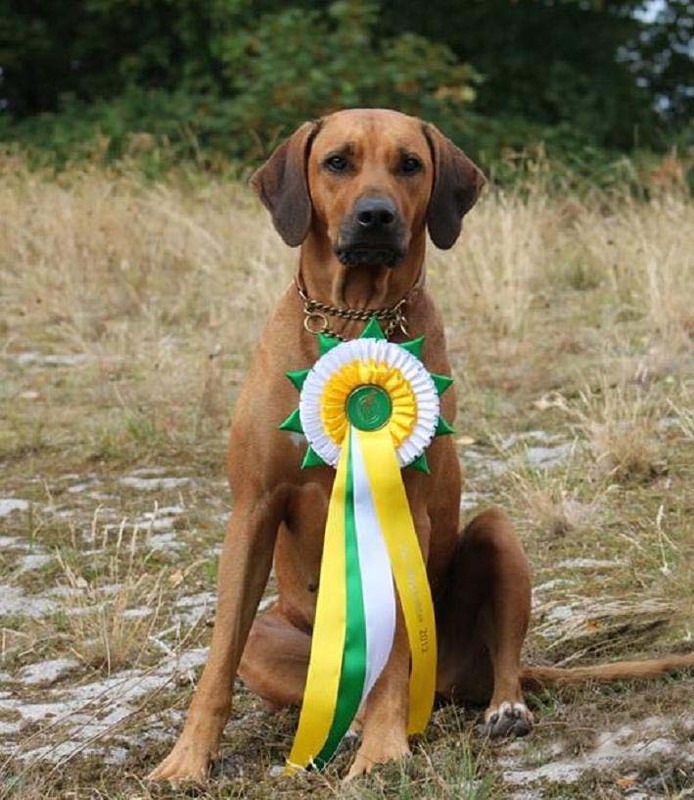 There is no way that I can keep up of everyone's results, placements, dates and judges. 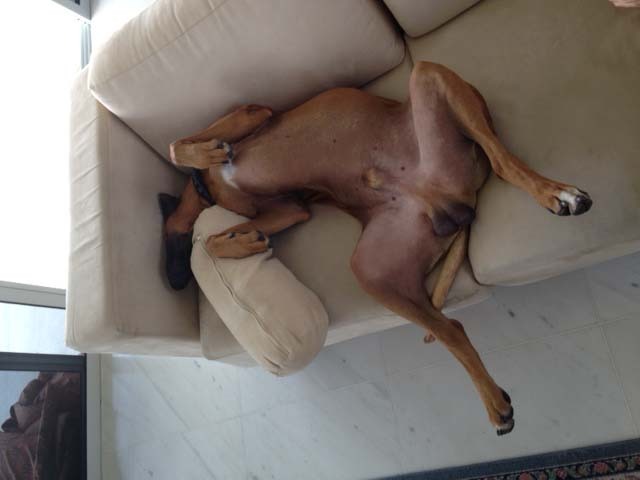 So please if you want me to update your dog's results, send an SMS or an e-mail. 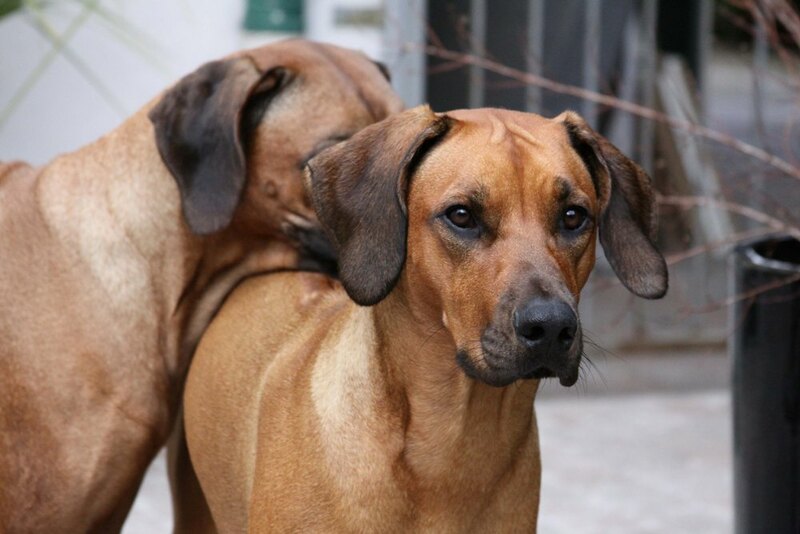 Perhaps this is an explanation of why certain results are not up here. 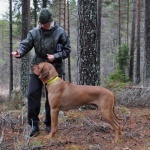 TWO NEW SWEDISH BLOODTRACKING CHAMPIONS! 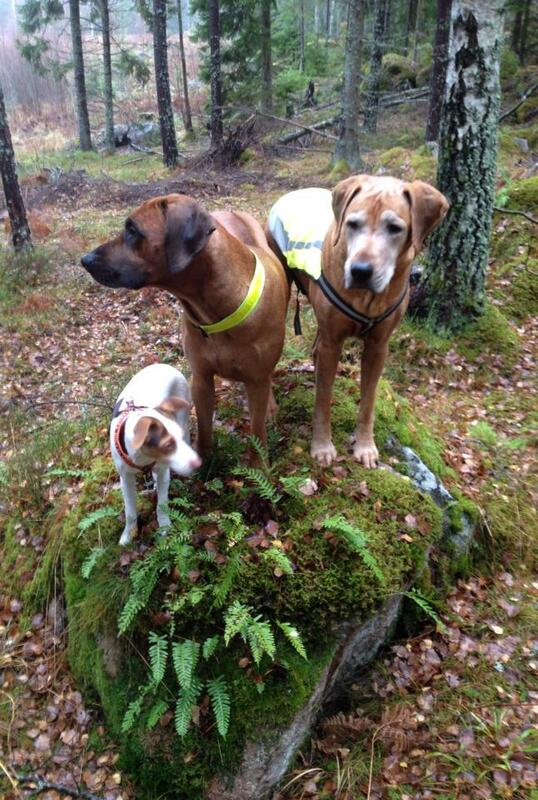 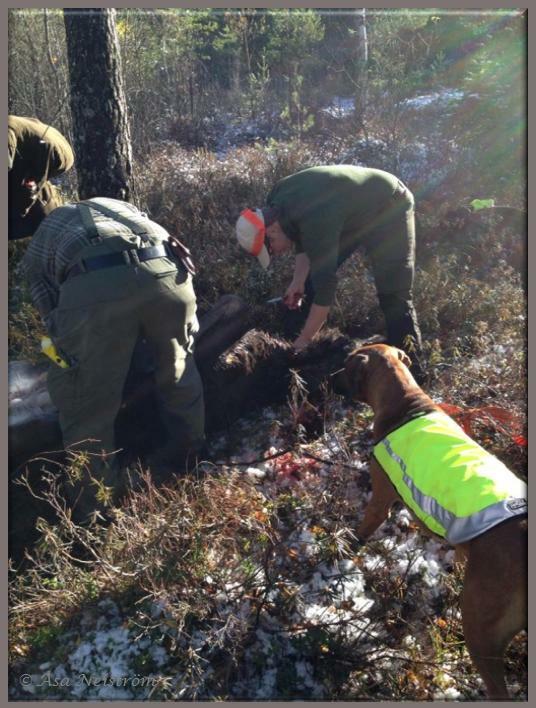 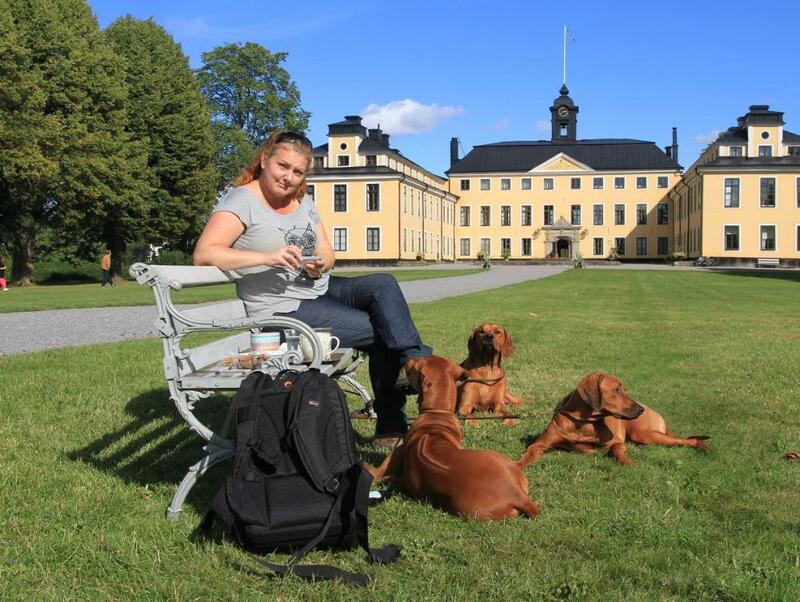 This weekend some of our Ghalidogs went to Vänersborg to participate in a blood tracking competition! 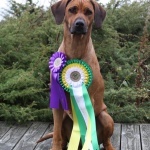 Chimme has the blood tracking champion title in three Nordic countries:)! 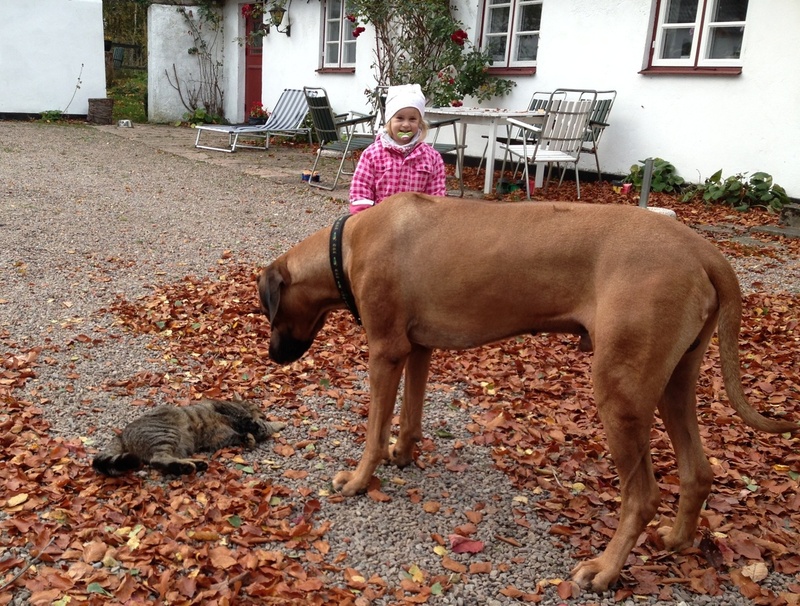 Sweden, Norway and Denmark! 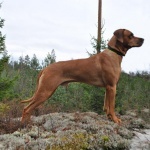 And can call himself Nordic Tracking Champion:)!!! Ghali Excellent Dresden"Houdini" from our E-litter, took his third first prize in openclass bloodtracking and that made him CHAMPION!!! 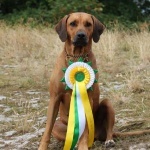 Just one more to go for this boys first title! 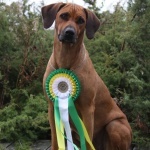 received a 1st prize in her openclasstrack with HP (Honors’ prize)!!!! 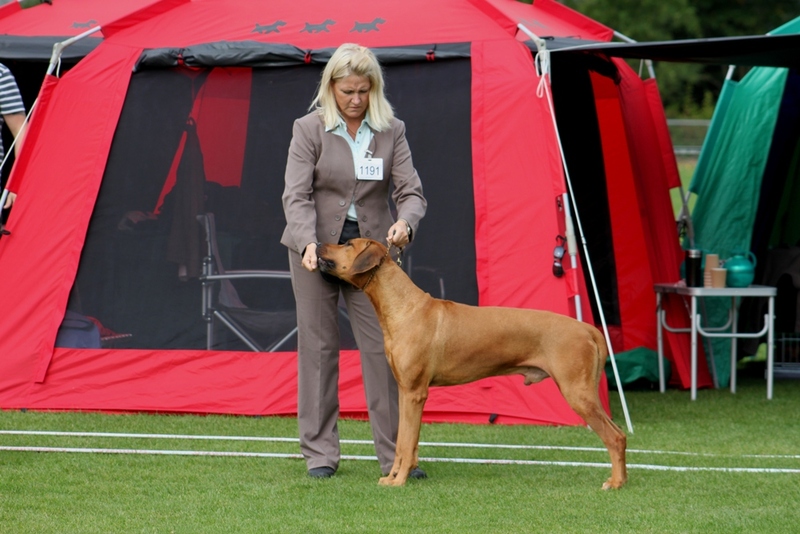 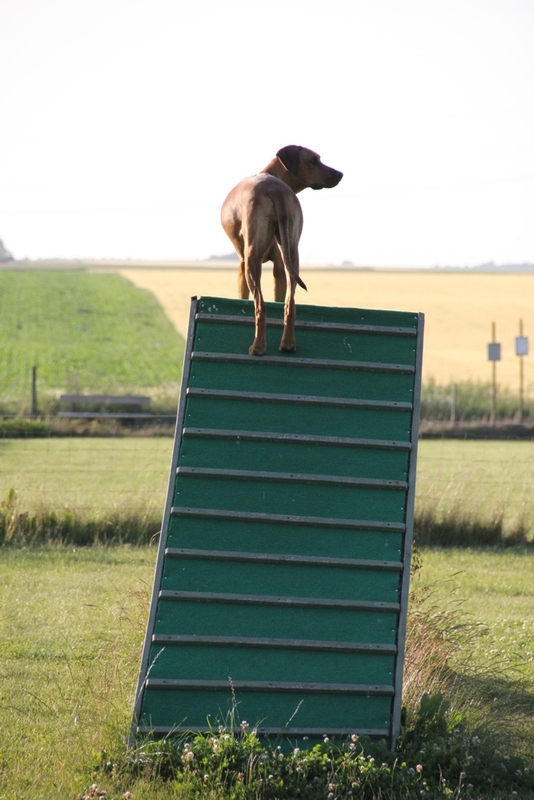 So proud of these talented dogs and happy that their owners take the time to activate and compete with them. 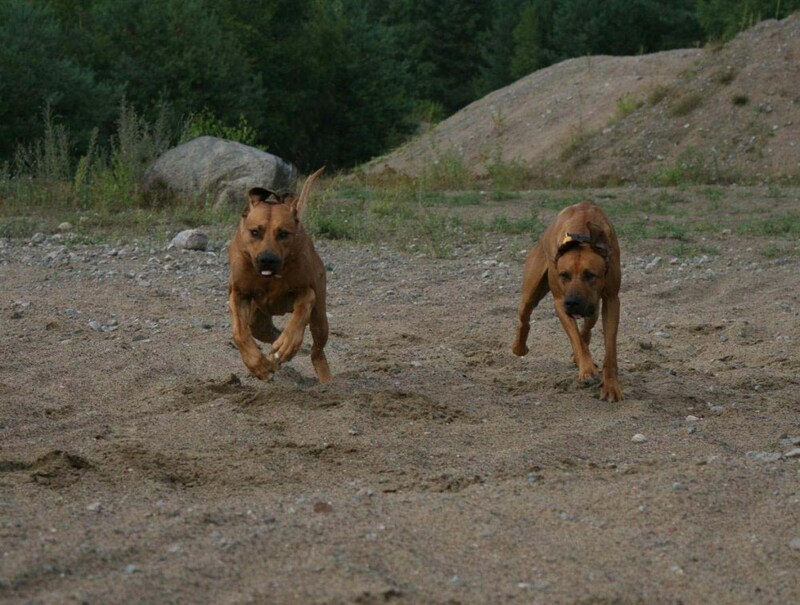 The dogs love tracking:)! 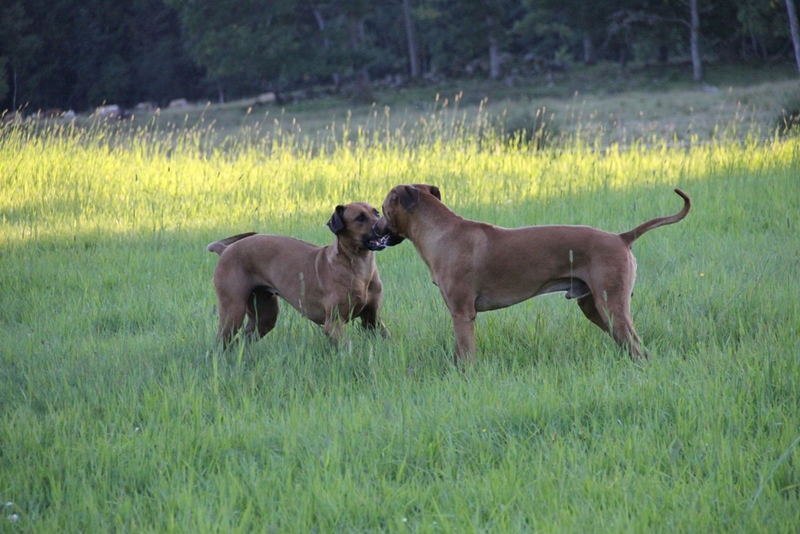 Me and our youngster” Toulouse” Ghali For I`M Farika stayed home this time, since we are looking for a new family to sweet Dex. 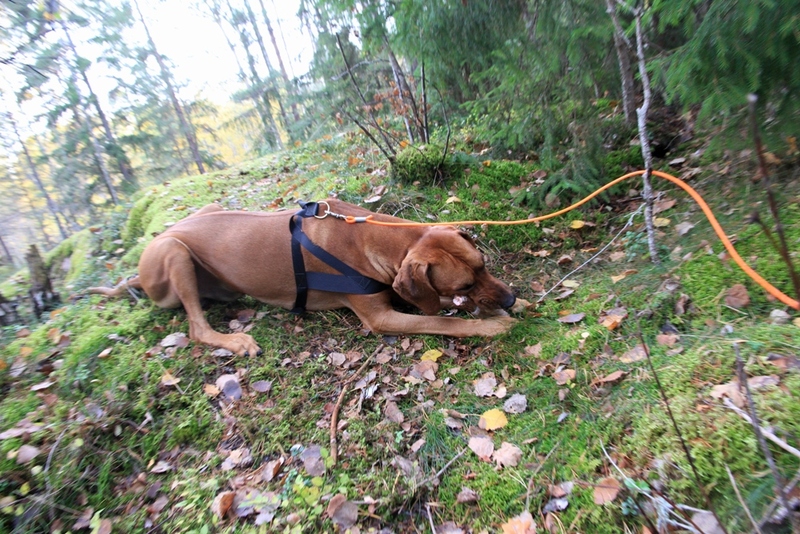 Otherwise we would also try some tracking this weekend. 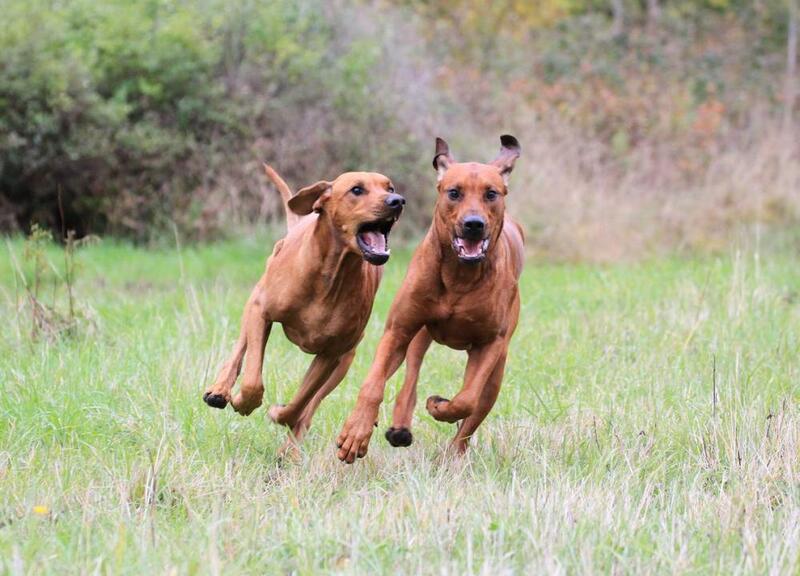 No rush… there will be more tracking weekends:)! 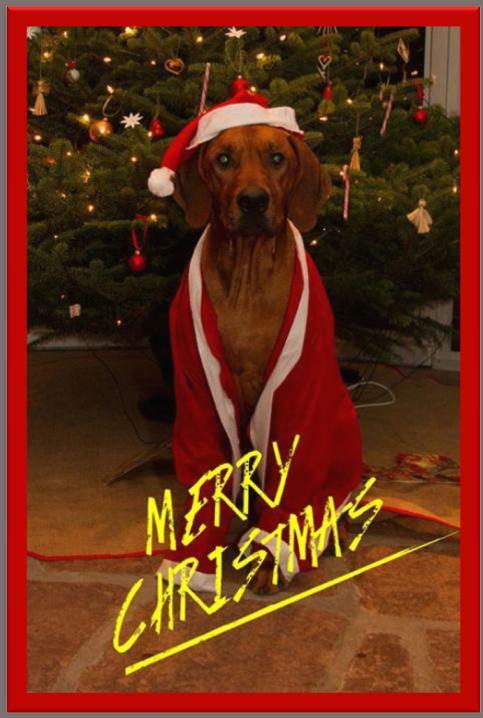 Thank you all for the sms report´s and mobile pictures! 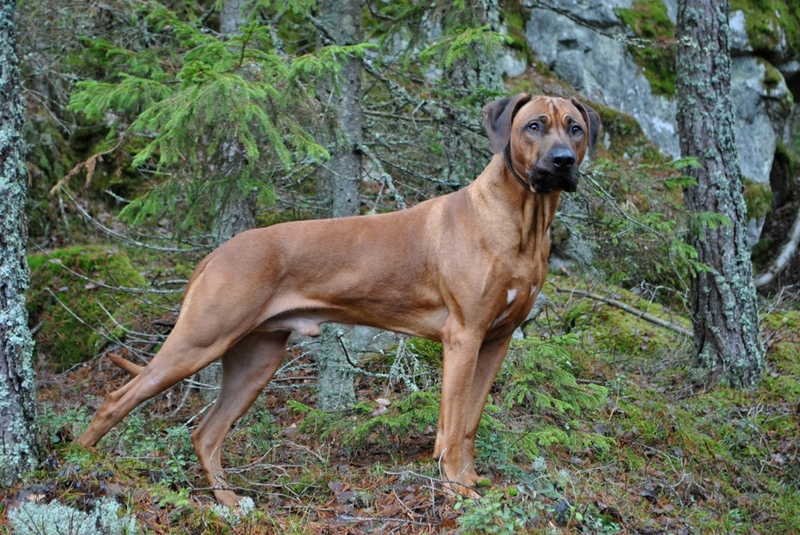 Behöver en ny matte eller husse OMGÅENDE! 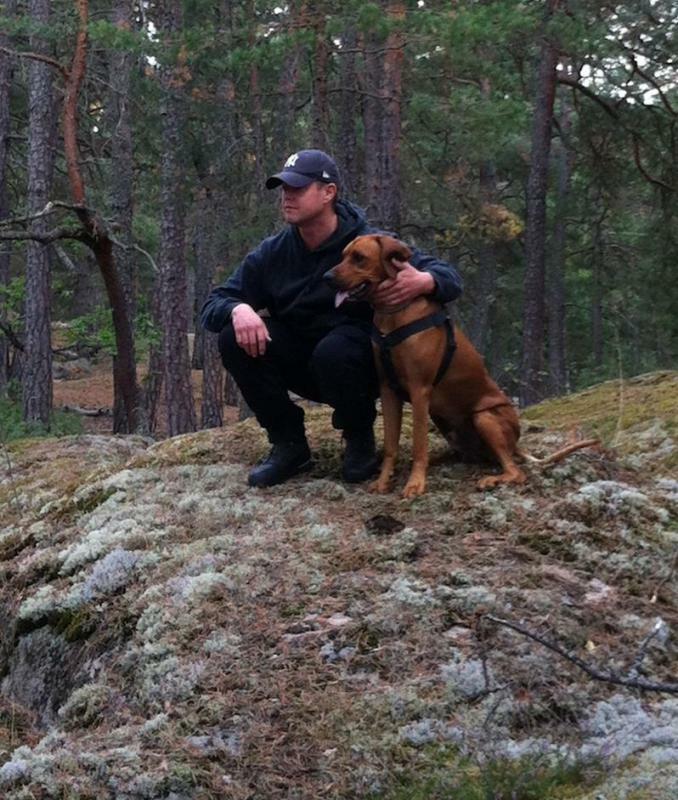 Dex är en välfungerande vuxen RR-hane på 5 år. 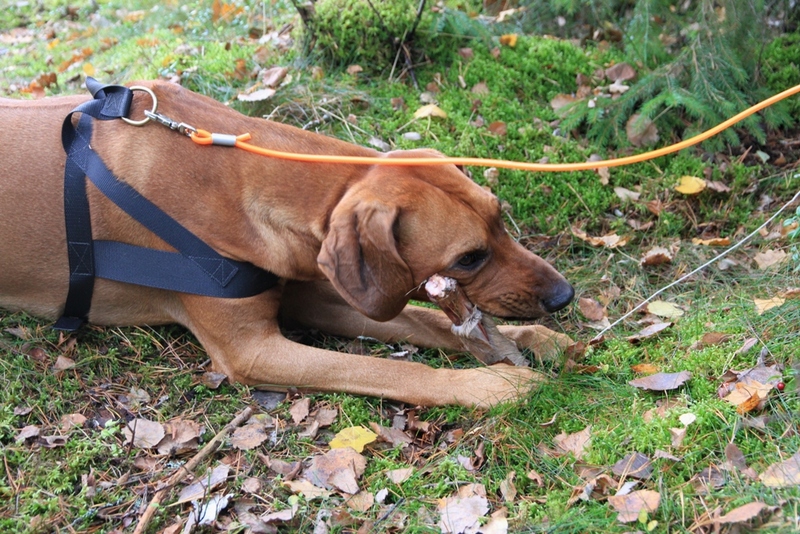 Han har provat på lydnad, dock ej utställning på grund av ridgefel! Dex bor för tillfället hos oss. 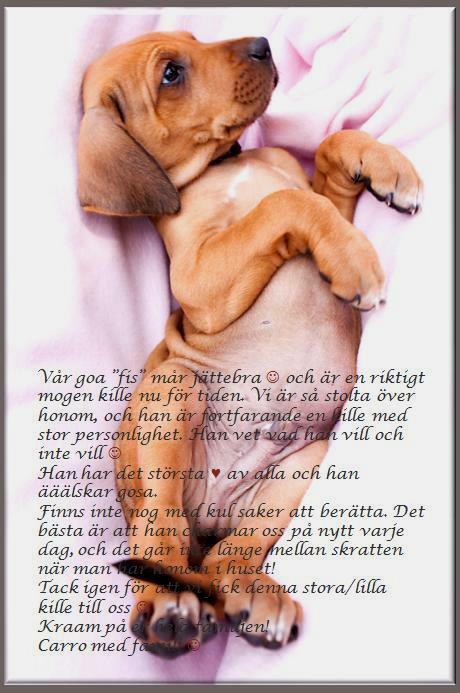 Känner ni att ni är rätt matte eller husse för Dex, och kan ge honom ett tryggt hem där han får massor av kärlek. 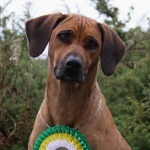 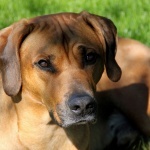 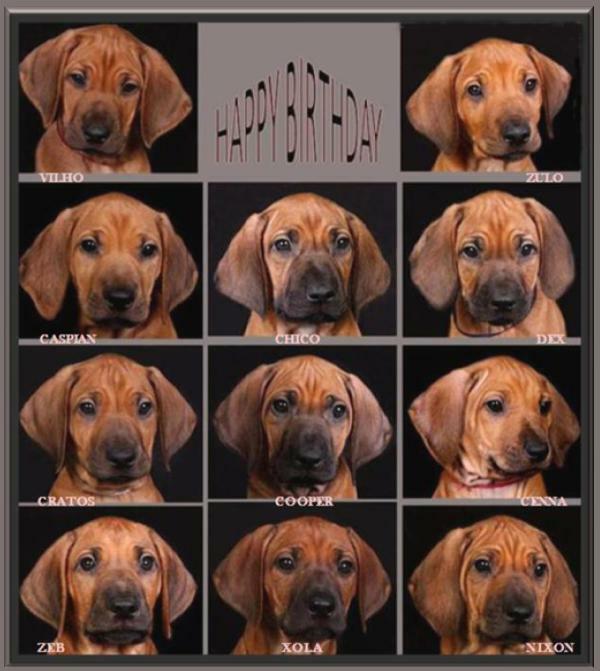 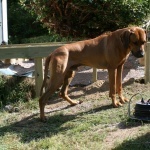 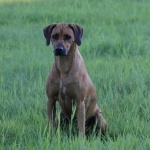 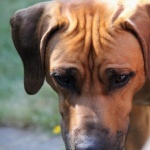 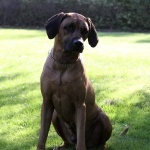 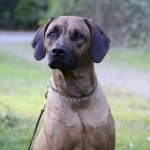 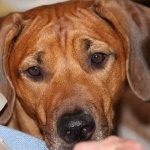 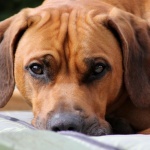 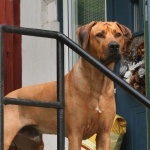 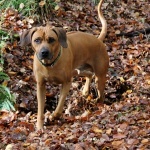 Nowdays I mostly take and put up pictures of our dogs that we have bred. 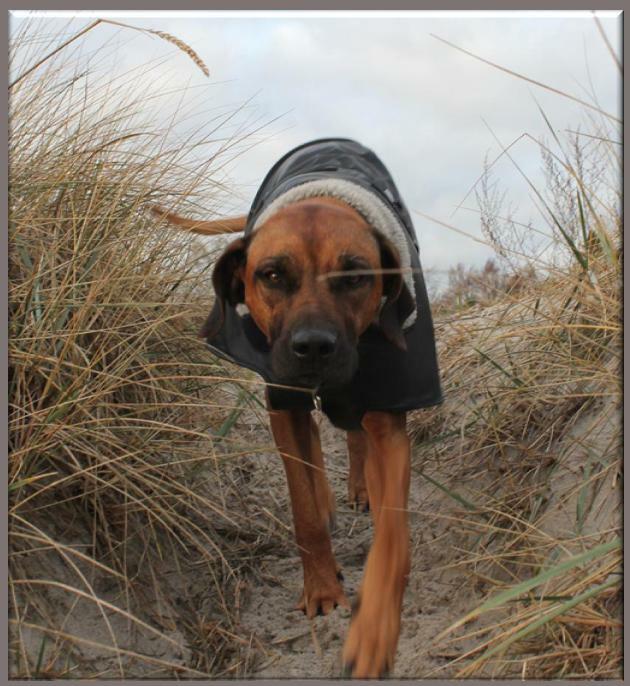 A couple of days ago I brought my camera along for one of our daily walks, this time at the beach. 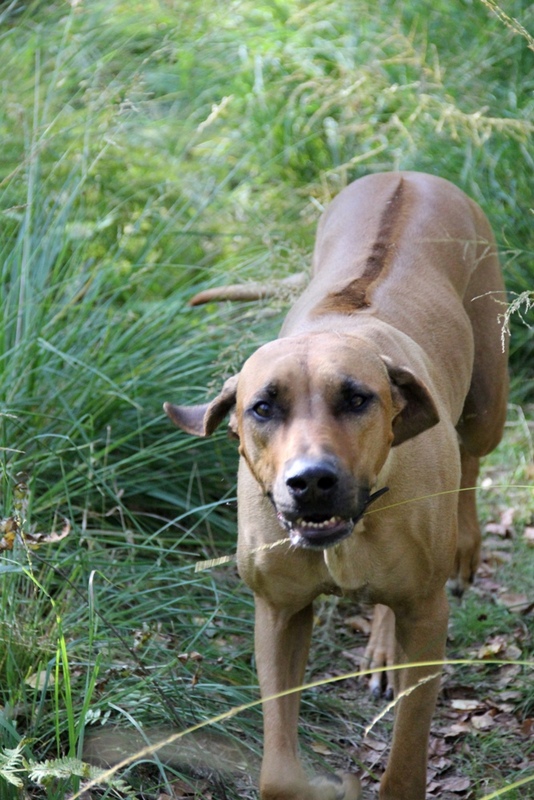 The girls gallery pages is updated with a few new pictures. 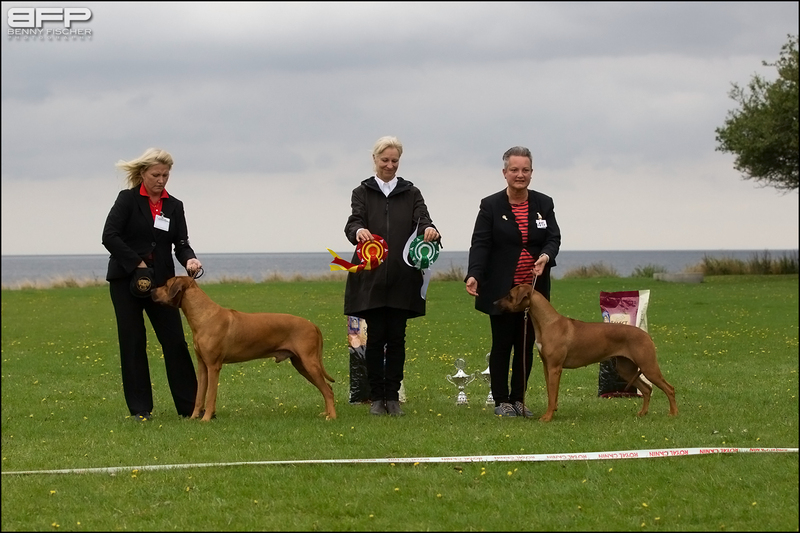 There are new pictures in Asla´s photogallery 10-11 years, and I have also made a new gallery 11-12 years. 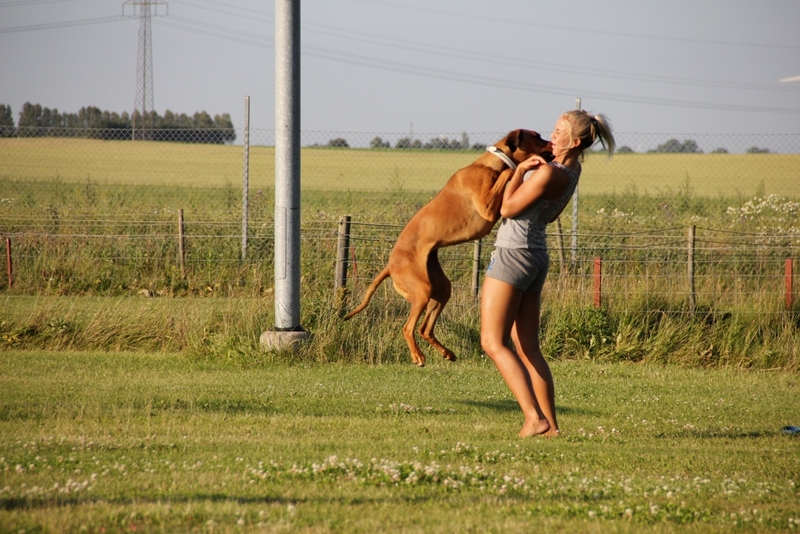 Also a few new pictures in Awena´s gallery 7-8 years, and I have also made a new gallery for Awena 8-9 years with a few new pictures. 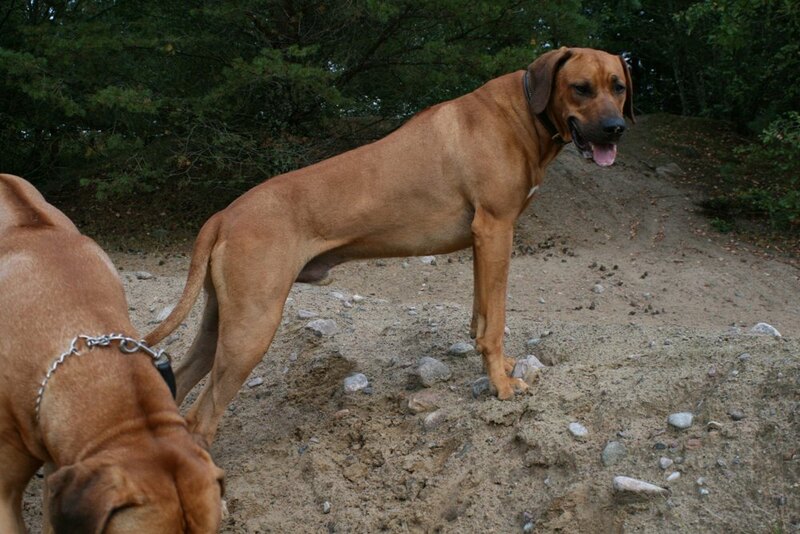 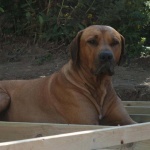 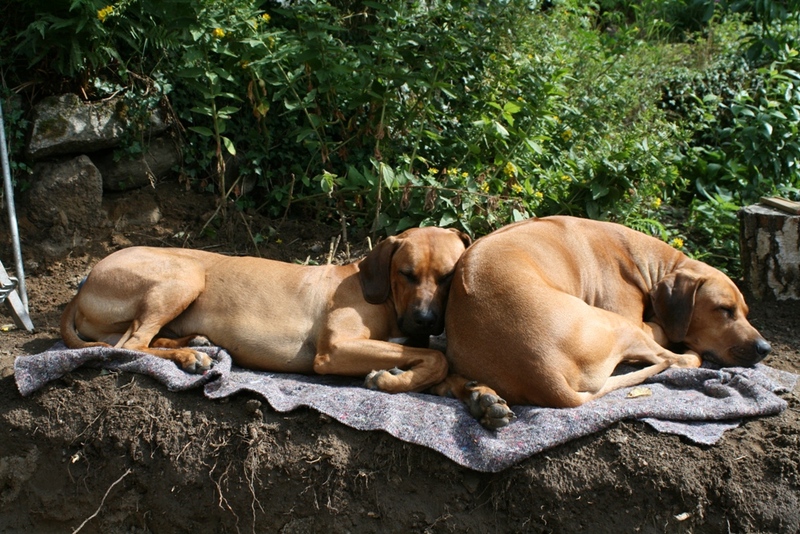 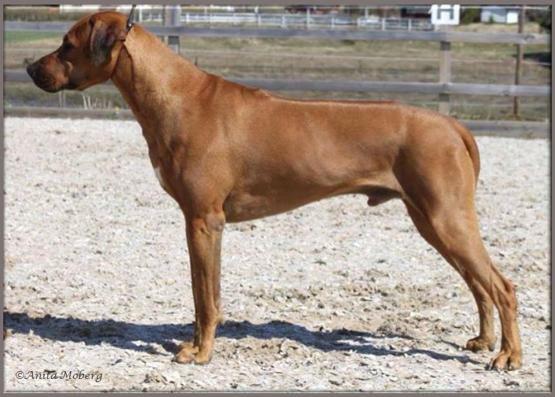 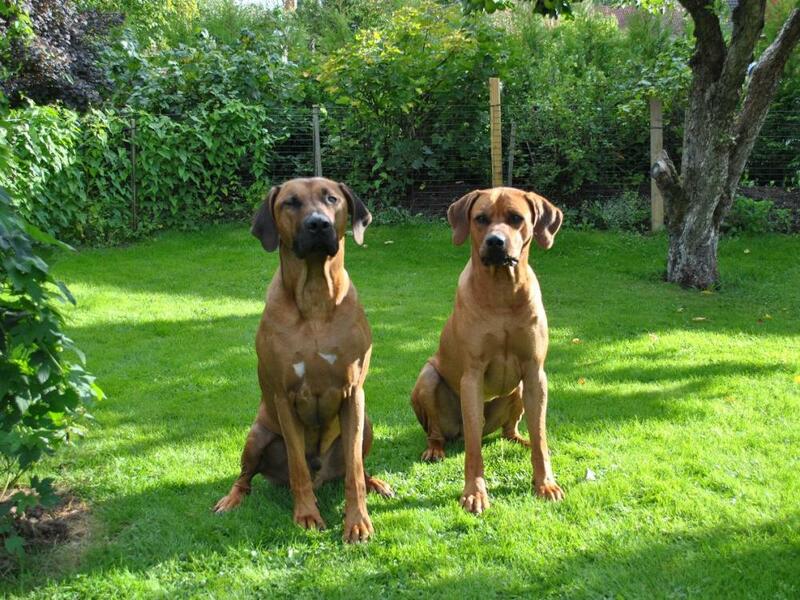 Safir is 5½ years and Tolouse 1½ years old. 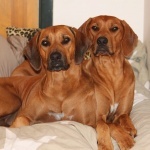 To see more pictures of our girls, click on their names above!